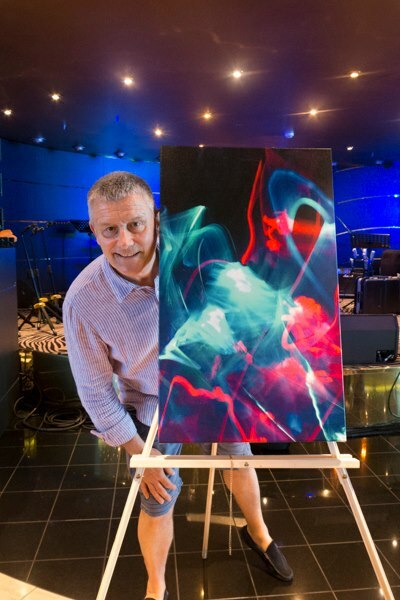 Read about Carl Palmer's exclusive Rhythm on Canvas art work here. August 2 - London - Under the Bridge. Details can be found on the Tour Dates page! The European Tour in August 2018 is starting to shape up. So far, dates posted for Austria, Italy, and Germany. 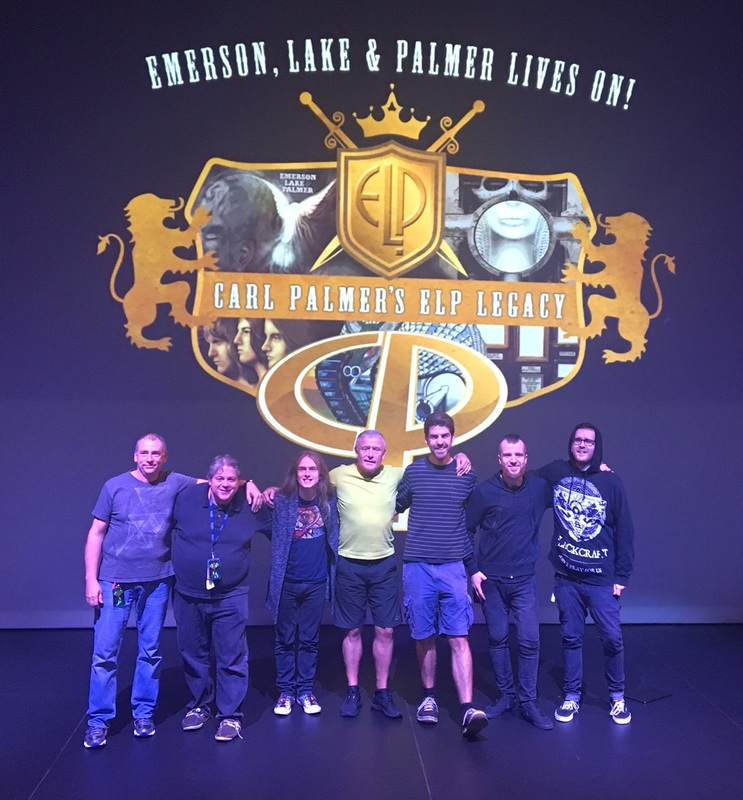 Carl Palmer's ELP Legacy Prepares For South Ameican Tour! Initial dates for May (Brazil) and June (Chile) are posted. More dates to be announced! See all the dates posted to date on Tour Dates page! 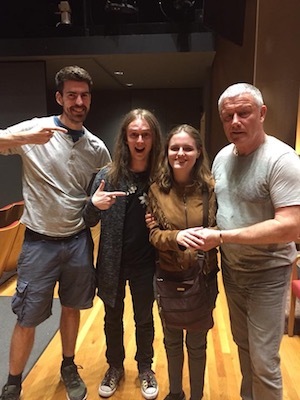 Rachel Flowers finally was able to meet and hear Carl Palmer's ELP Legacy at last night's show held at the Thousand Oaks Performing Arts Center. Before the show, Carl and Rachel exchanged their respective CDs. Details, ticket links for these and the whole tour can be found on the Tour Dates page. 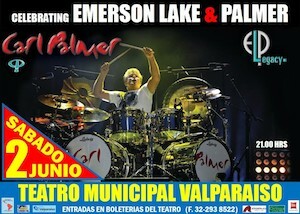 Carl Palmer welcomes all his fans to his current US tour - Emerson, Lake & Palmer Lives On! Part Deux. Check out all the tour dates on the tour dates page. 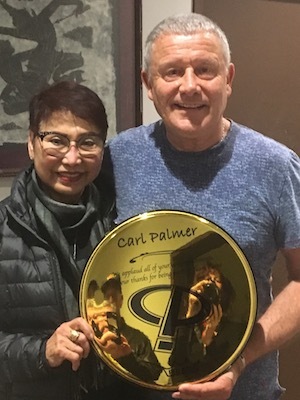 Carl Palmer had a special guest at his show in Santa Clarita, CA last night: Ami Belli, the widow of Remo Belli. 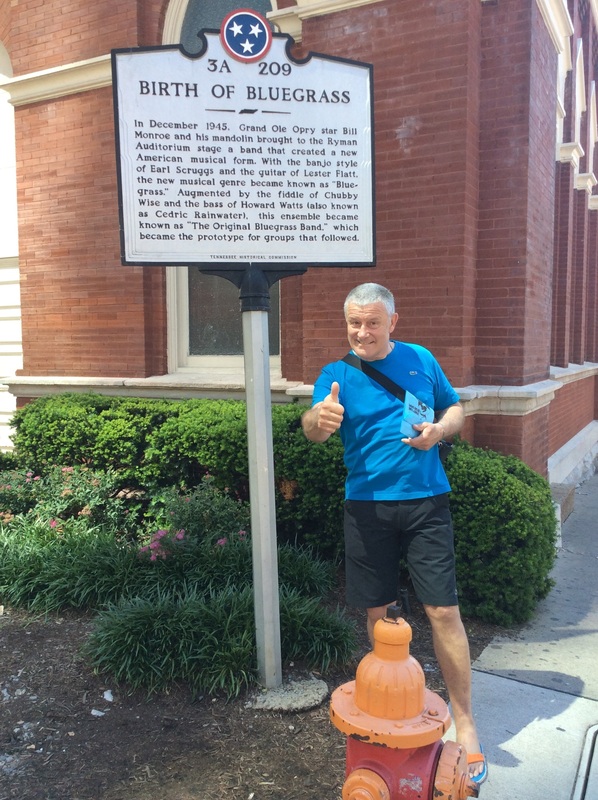 Mr. Belli is best known as the inventor of the plastic drum head, and the founder of the REMO Drum Head company. Carl has been a long time REMO artist and was delighted to see Mrs. Belli again after many years. 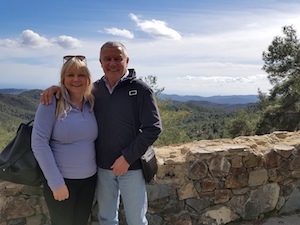 Just taking a break from writing my autobiography in Vavatsinia in Cyprus on a glorious sunny day. 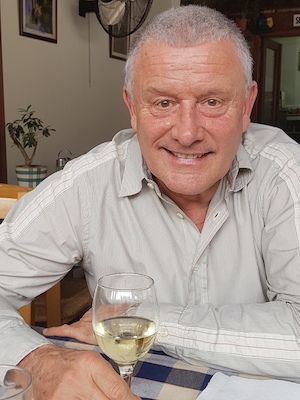 Enjoying a relaxing late lunch in my favourite Taverna in the village of Lania in Cyprus after spending a morning session on my autobiography. The tour begins this weekend with the Cruise to the Edge, continues on a US West Coast tour beginning on March 8, moves to the US East Coast on April 18, and will continue into the summer and fall with more US dates and shows in Brazil. 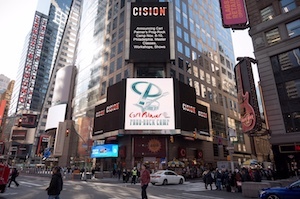 The East Coast tour includes 3 shows in Florida with the Alan Parsons Project. 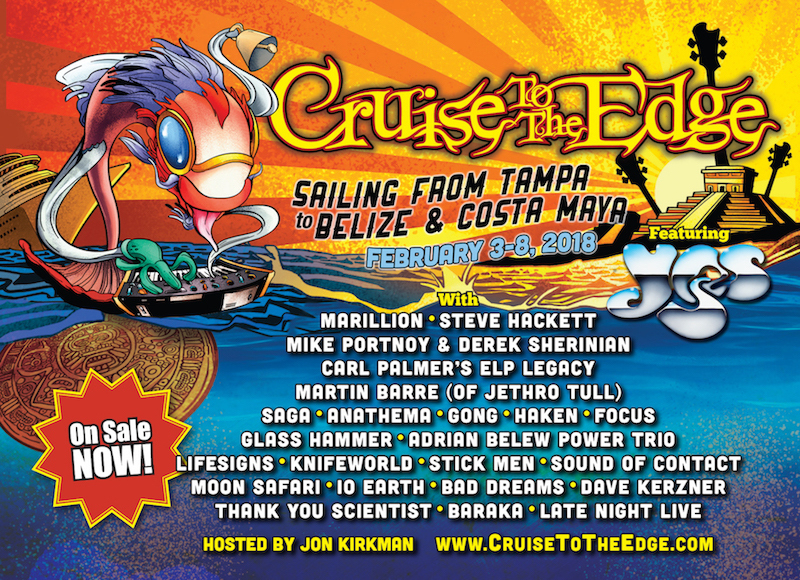 Carl, Paul and Simon are looking forward to joining The Cruise To The Edge in Tampa, Florida on February 3rd. The band will be playing two concerts onboard the ship and they will be playing several new pieces in the set. In addition there will be two art events featuring “The Legends" series featuring Keith Emerson (Welcome back), Greg Lake (Lucky Man), and John Wetton (Heat of the Moment). Carl did a live interview on BBC Radio 2 today, Sunday 21st January, with the legendary English veteran DJ and Broadcaster Johnnie Walker on his very popular 'Sounds of the Seventies' show. 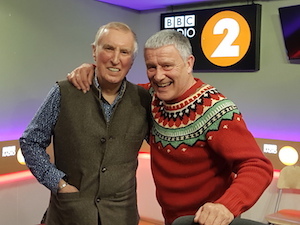 Johnnie Walker occasionally includes in depth interviews on his weekly programme with some of music's biggest names from the 1970's and it was Carl's turn today. Johnnie has previously interviewed both Greg and Keith but this was the first time he had interviewed Carl. 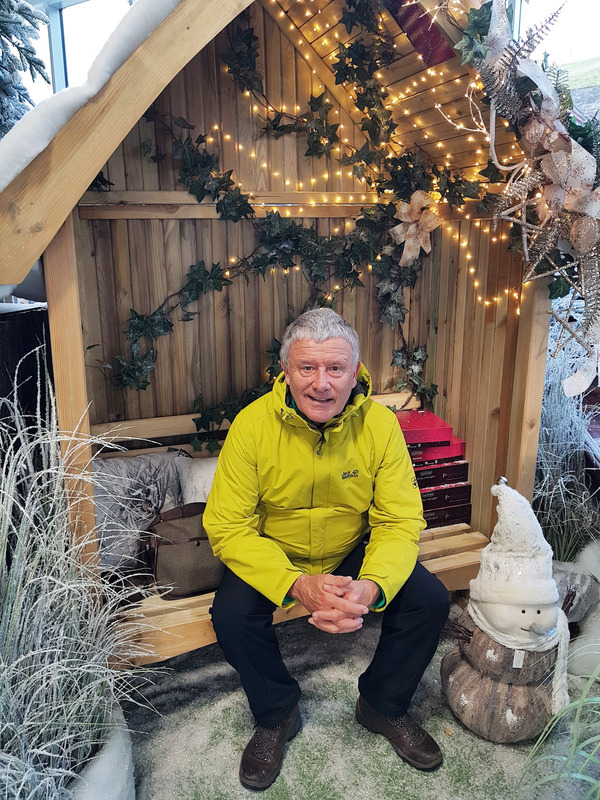 Wishing you all seasonal greetings and a very happy and healthy 2018! Happy Holiday time in NY! Our first real snowfall of the year. 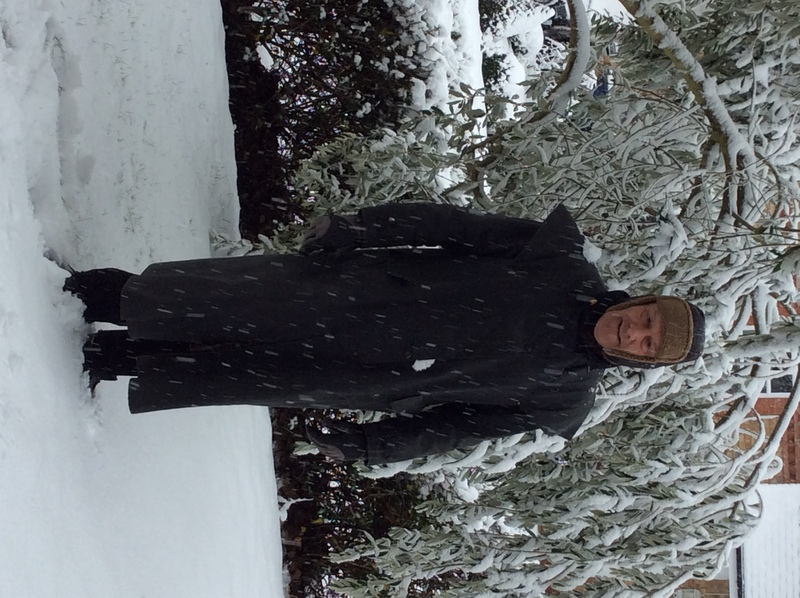 Off to get the Sunday papers! Feels very much like Christmas. Here is the classic Carl Palmer "VENUS" snare drum, available through Ludwig Drums. 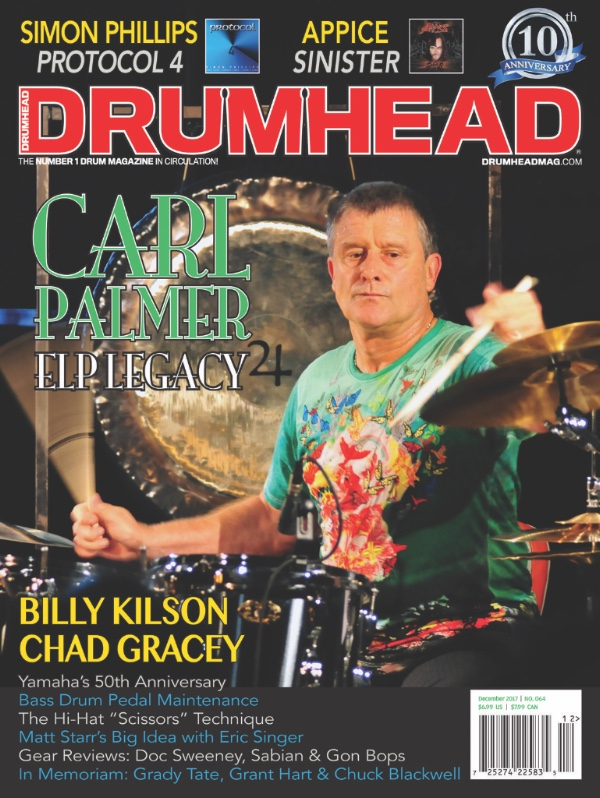 The snare drum was designed (and is used by) iconic drummer Carl Palmer. 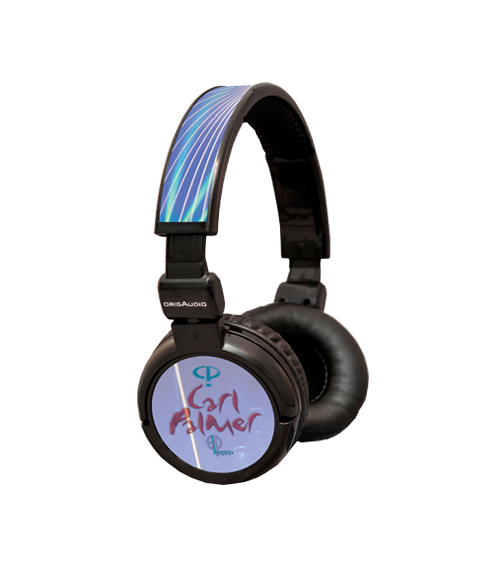 Each drum comes with a label placed inside the shell, signed personally by Carl Palmer. 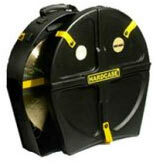 More photos and details about the Venus snare drum can be seen here. 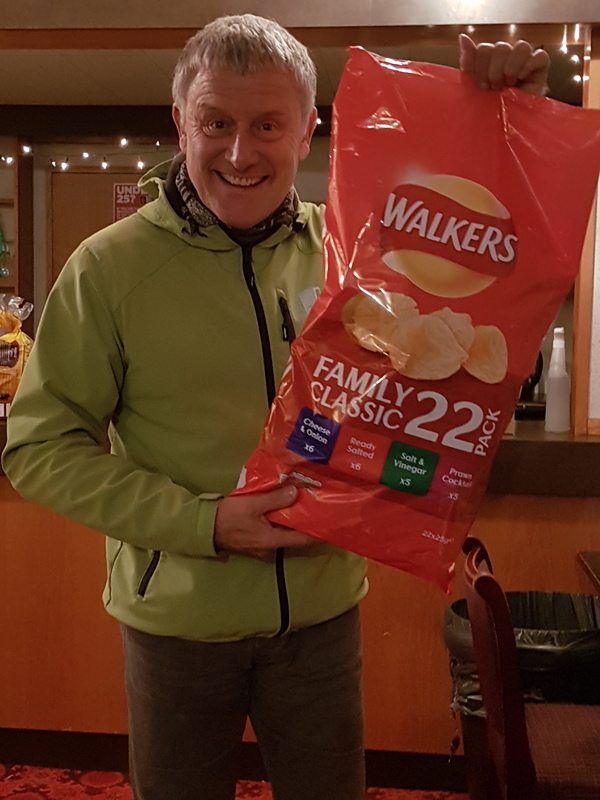 Thanks for a great time in the UK. We had the best tour ever. It was great to see so many familiar faces. 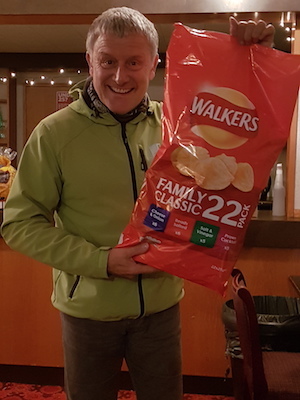 What a thrill it was to tour around the UK countryside meeting new friends and generally having a good time. The concerts we all enjoyed and the band played really well. I would also like to thank everyone who was working with us. Paul, Simon and myself all hope to see you in the very near future. 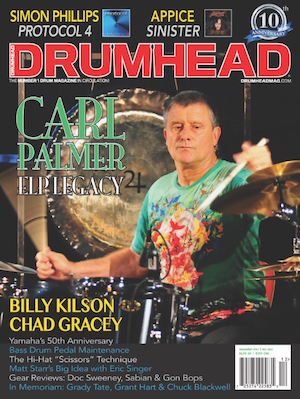 Congrats to Carl Palmer for being the cover story on the current issue of Drumhead magazine! 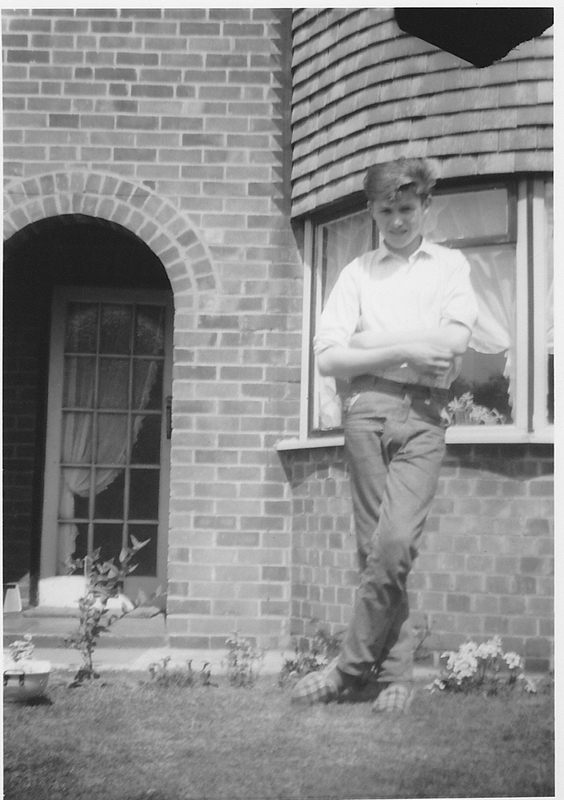 Here is Carl playing at the Kersel Pub, Southend aged 14 while on holiday! 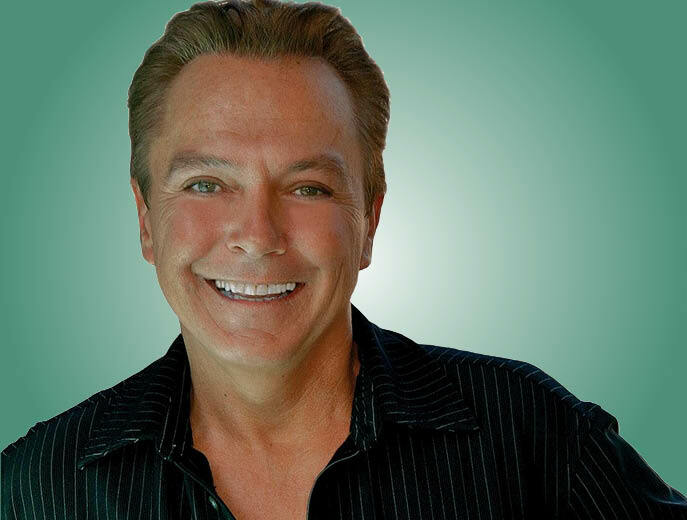 I was very sad to hear of the death of David Cassidy who I met in the late 1970's. We became good friends and David was extremely encouraging in helping me to get into acting when I studied at the Lee Strasberg School of Acting in Los Angeles. We also had the same manager for a brief time. It is a tremendously sad loss to his family, his friends and fans and my thoughts go out to all. Special Holiday Deals for Black Friday and Cyber Monday! Carl Palmer's ELP Legacy!! Shop now! Delighted to be a guest at Roger Daltrey's event to benefit the Teenage Cancer Trust on Monday, Nov. 13. The Searching for Apollo art unveiling at the Victoria & Albert Museum in London - works by Roger Daltrey and artist/photographer Alistair Morrison. While we build up a photo gallery of the event, I'm sharing this Facebook gallery here. Great interview yesterday at BBC Radio 6 Music with Liz Kershaw on her 'Legends' series. Here is a photo of Carl with Liz. 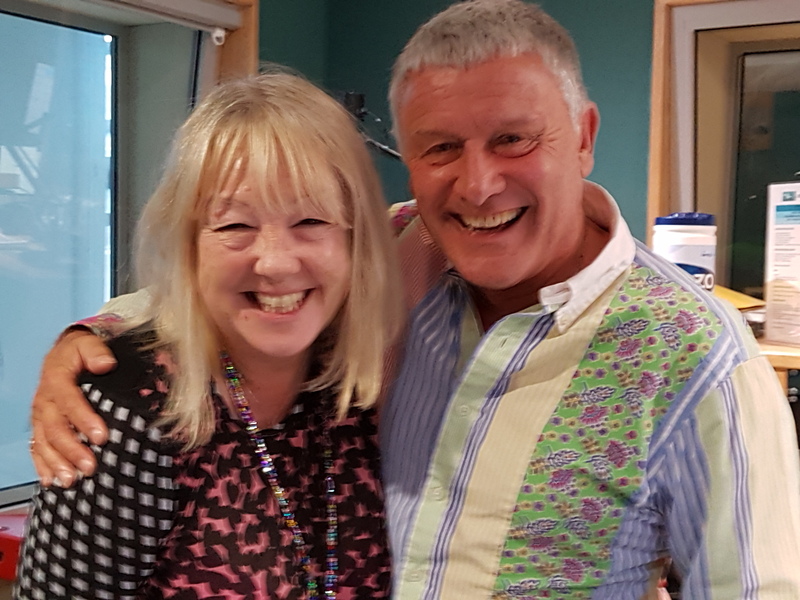 Click here for an online replay of Carl Palmer's interview today on Liz Kershaw's show on BBC 6. The interview begins at ~1 hour, 3 minutes in. Listen to Carl live on Liz Kershaw’s BBC Radio 6 Music weekend show on Saturday 11th November between 1.00pm - 3.00pm (UK time). Carl is being interviewed for Liz’s Legend series. Get all the tour dates and links to get tickets for the remaining shows on the Tour Dates page! I am very sad to hear of the passing of Tony Ortiz, a great friend for many years. And the only person ever to be the official ELP archivist for many, many years. My thoughts go out to his family. He will be deeply missed and I will be thinking of him. 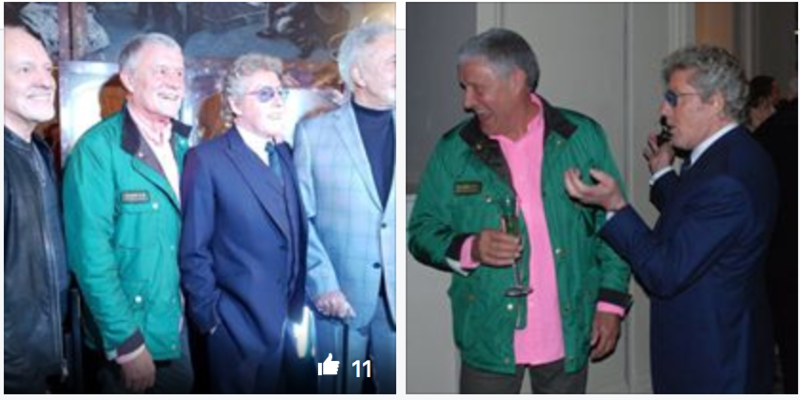 Tony was always at my concerts filming, chatting, laughing and having fun and this will be missed greatly by all of us. I am going to miss the games he would play, like standing outside my dressing door playing his ring tone of Lucky Man. Always full of humour and love and kindness. I will miss you, Tony. Say 'Hi' to the other two for me. With deepest sadness for the loss of a good and kind friend. 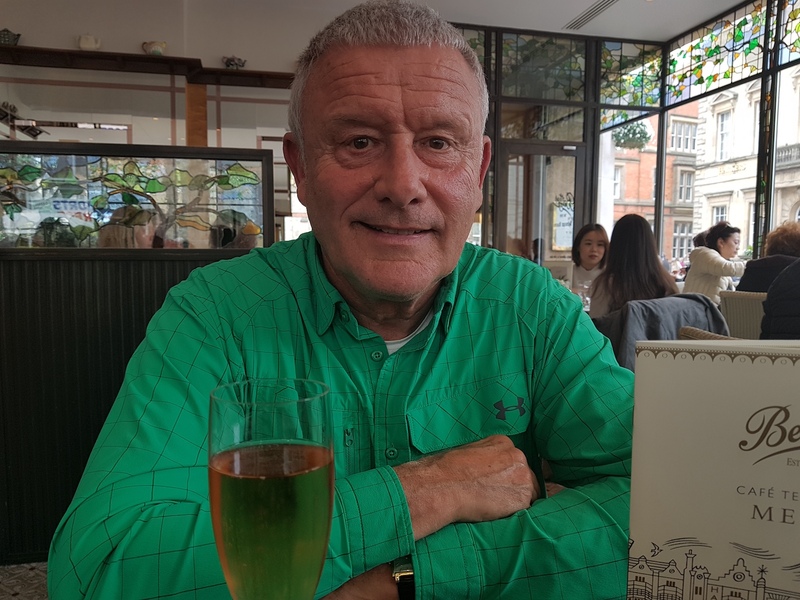 Carl Palmer's ELP Legacy UK Tour! Walking in the sunshine with the Kitzsteinhorn glacier in the background. Having a wonderful time on the famous Hahnenkamm in Kitzbuhel, Austria today where it's snowing already. 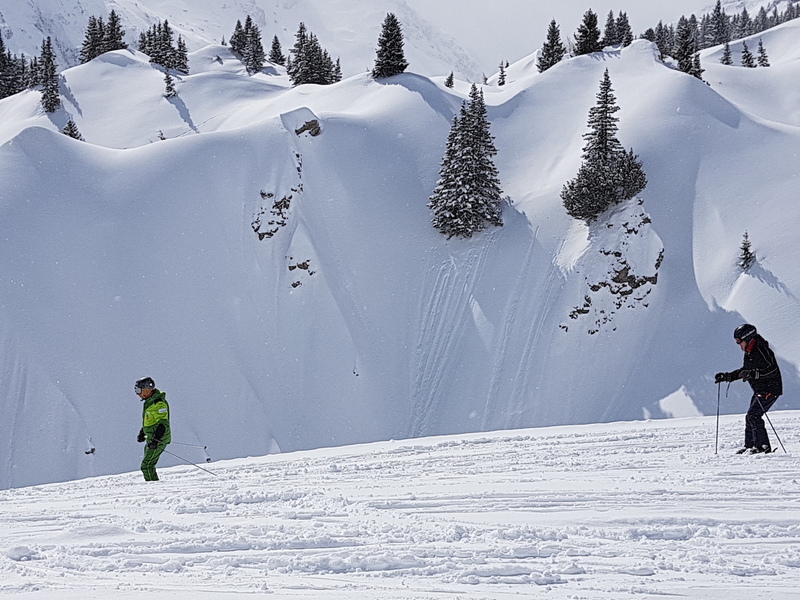 Snowballs at the ready! 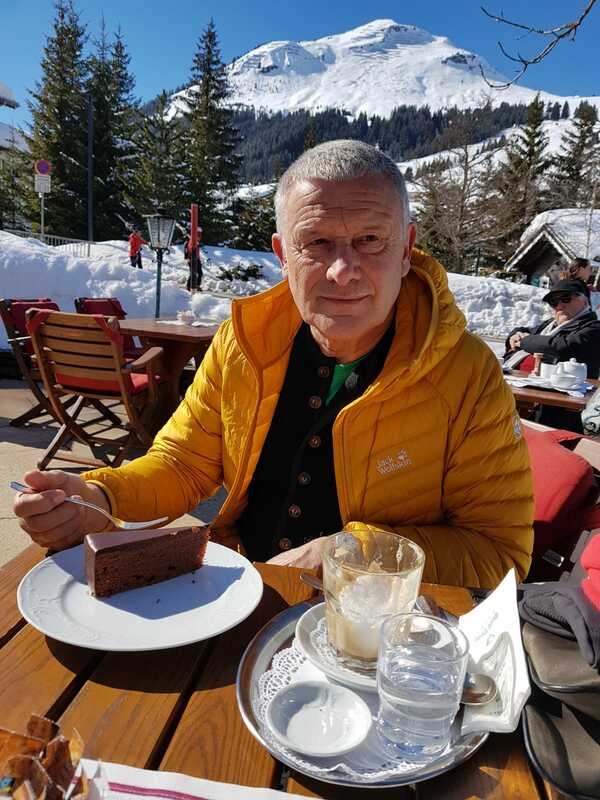 Fantastic vegan lunch at Restaurant Hochkitzbuhel bei Tomschy. A great way to spend a relaxing Sunday with Katie. We loved the gondola so much we thought of getting one for the garden, and it could be the one behind us! We have seen one in a garden here in Kitzbuhel. 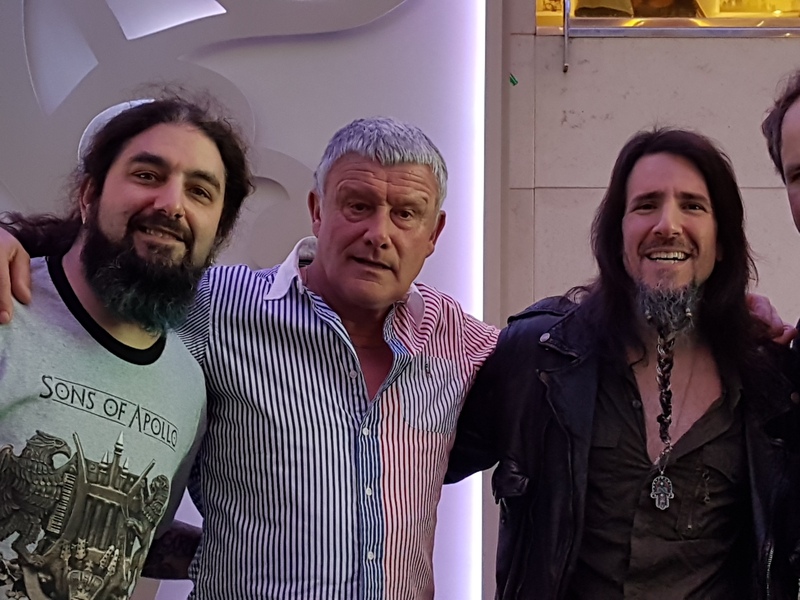 In the video below, Carl Palmer, Paul Bielatowicz and Simon Fitzpatrick say hello to all its UK friends and fans, encouraging them to check out the band's upcoming tour: Emerson, Lake & Palmer Lives On! October 13: the final night of our nearly year long tour with Carl Palmer's ELP Legacy (and Carl with ASIA on the Journey tour). Carl Palmer's ELP Legacy still has a UK tour to do in November and December, but the US crew says farewell. Thanks to everyone who contributed. 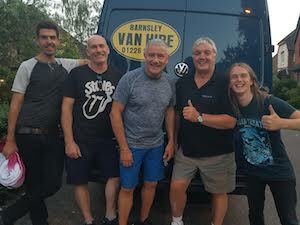 Pictured here L to R: Harry Ford (FOH sound; stage tech); Bruce Pilato (Manager); Paul Bielatowicz (Guitar); Carl Palmer (Drums); Simon Fitzpatrick (Bass); Josh Gailor-Rose (Tour Mgr; Drum Tech); and Steve Mayes (Merchandise). Carl Palmer's ELP Legacy is treated to special performance by The Laura Secord Secondary School Drumline From St. Catharines, Ontario, Canada; Directed by Dave Sisler. Palmer was in St Catharines to play a near sold out show on his acclaimed Emerson, Lake & Palmer Lives On! Tour. Later that night, Palmer and his band (Paul Bielatowicz and Simon Fitzpatrick) returned the favor by playing a thrilling show which included the entire drum line band in the audience. Carl Palmer welcomes back his U.K. fans! 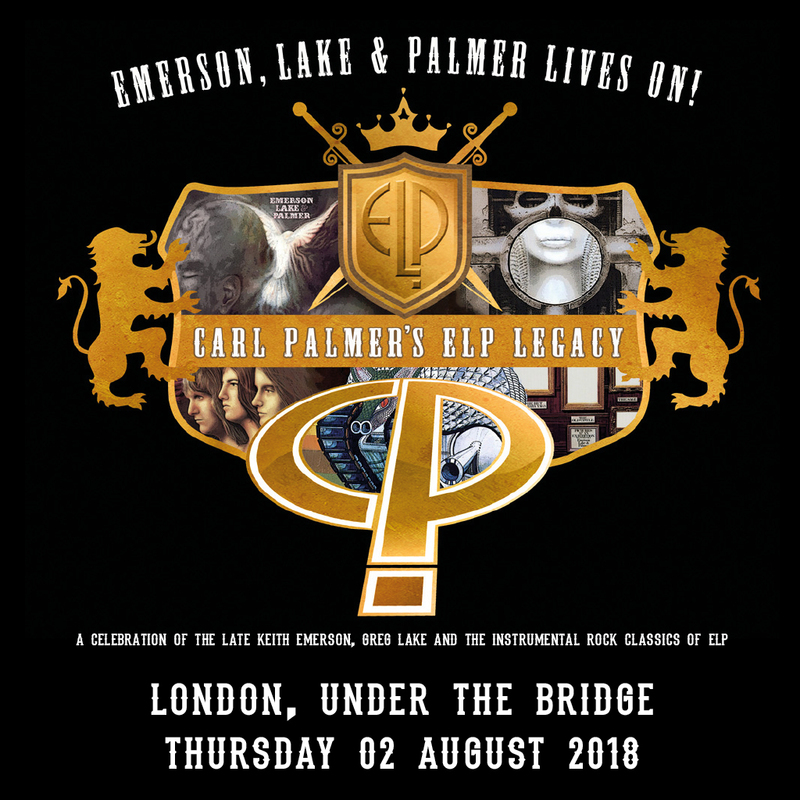 Carl Palmer's ELP Legacy embarks on its first UK tour in two years. See the details on the Tour Dates page! Carl Palmer welcomes all his fans to see him on the last of his Canadian dates with his band ELP Legacy. 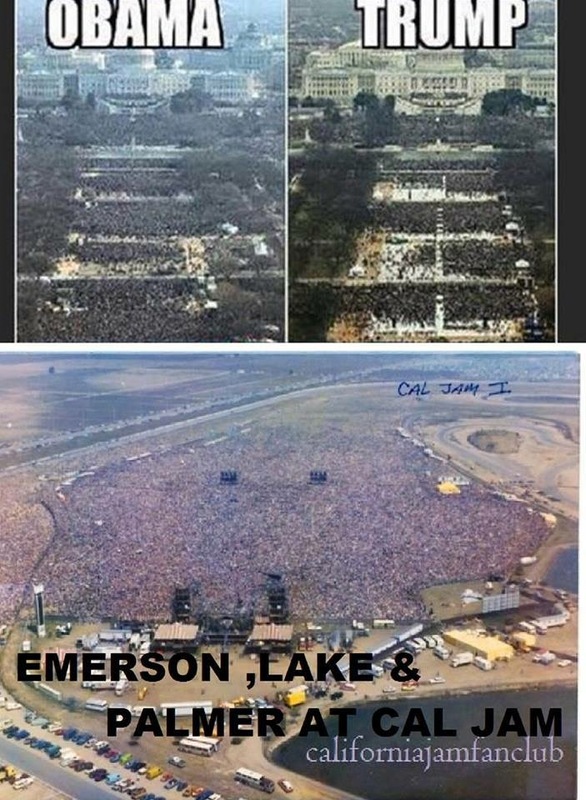 The tour is called Emerson, Lake & Palmer lives on! 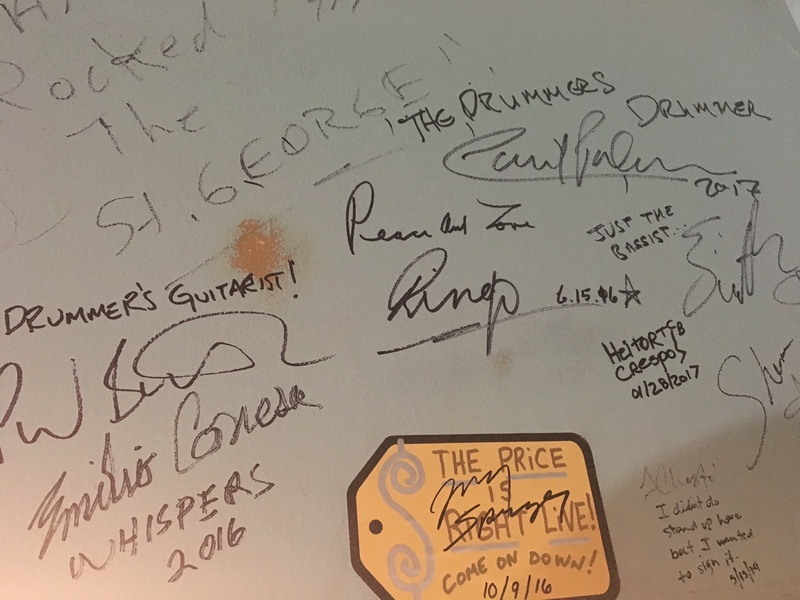 Two legendary drummers, Carl Palmer and Ringo Starr, side by side on the wall of the iconic St George Theater in Staten Island. 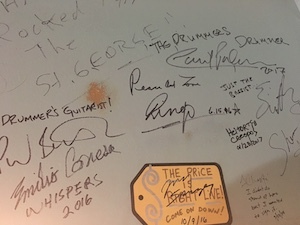 Carl's two bandmates, Paul Bielatowicz and Simon Fitzpatrick, signed as well. Carl Palmer's ELP Legacy played with hard rockers Zebra at the theater on 08 October as part of its 2017 Emerson, Lake & Palmer Lives On! Tour. 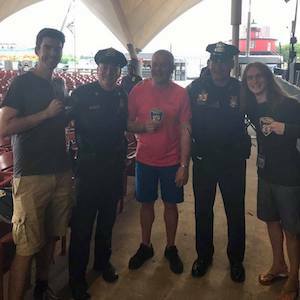 Hang out with Carl Palmer before the show! Soundcheck party tickets available – includes access to soundcheck, meet and greet with Carl Palmer, photo and signing! 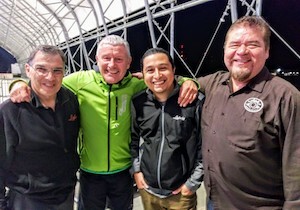 Carl Palmer hanging with some of the top brass of the Ludwig Drum company, at Sweetwater in Fort Wayne, Indiana. Ludwig manufactures Carl's ultra popular Venus Snare Drum. 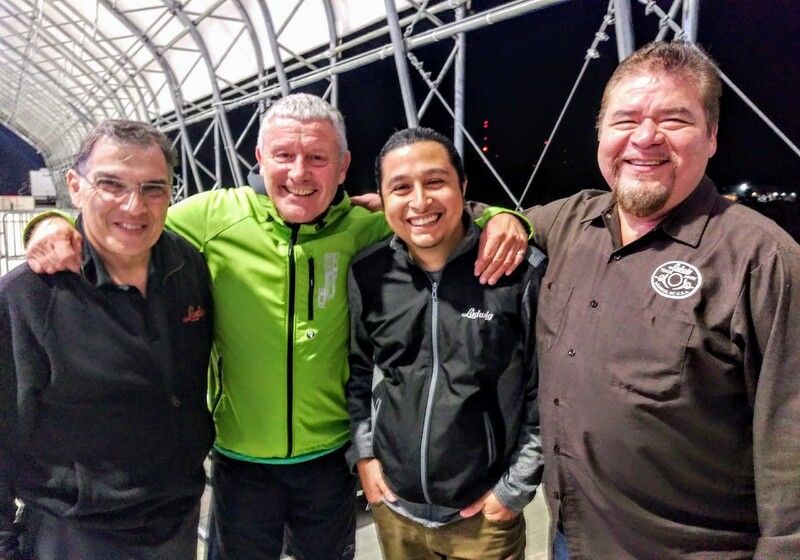 Shown here from L to R: Jim Catalano, Carl Palmer, Uli Salazar, Sonny Carreno. 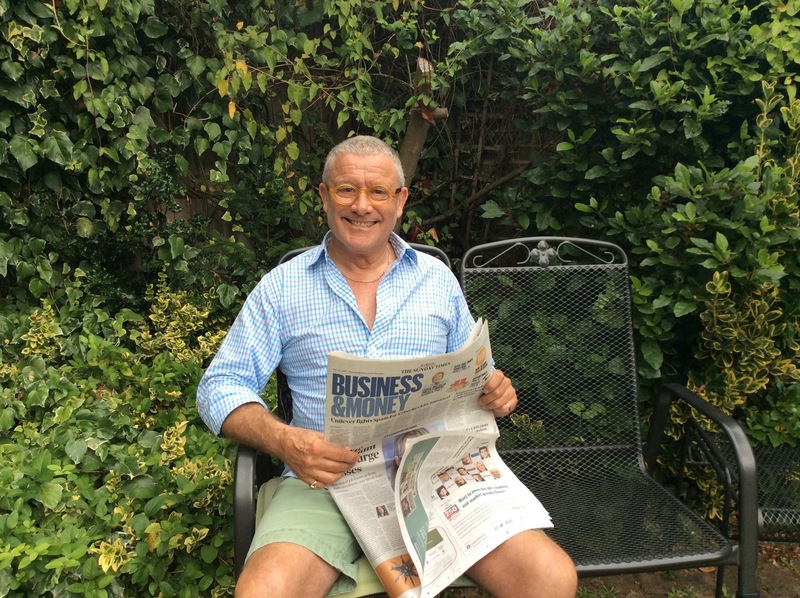 "I have to say, Tony is looking quite thin lately," says Mr Palmer. 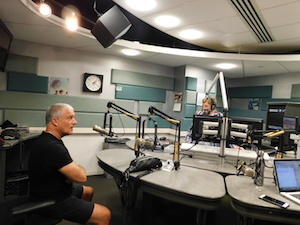 Also, here's Carl talking about the gig at Sweetwater and the current North American leg of the Carl Palmer's ELP Legacy tour. 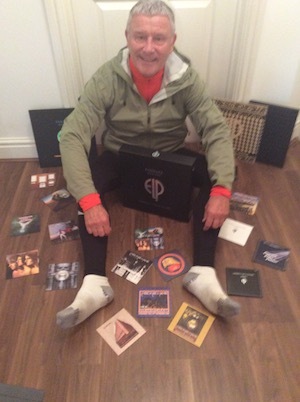 Carl enjoys opening the new ELP Box set from BMG! 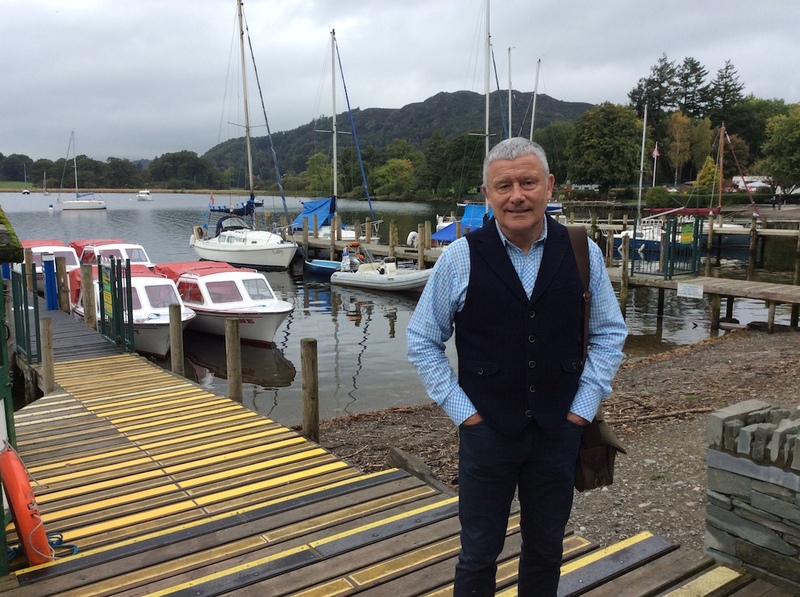 Carl just about to enjoy his last cappuccino by Windermere before starting the next tour in the USA and Canada. 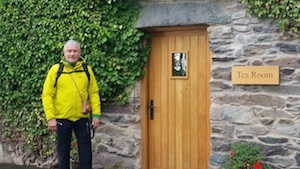 A wonderful week away in the beautiful Lake District. 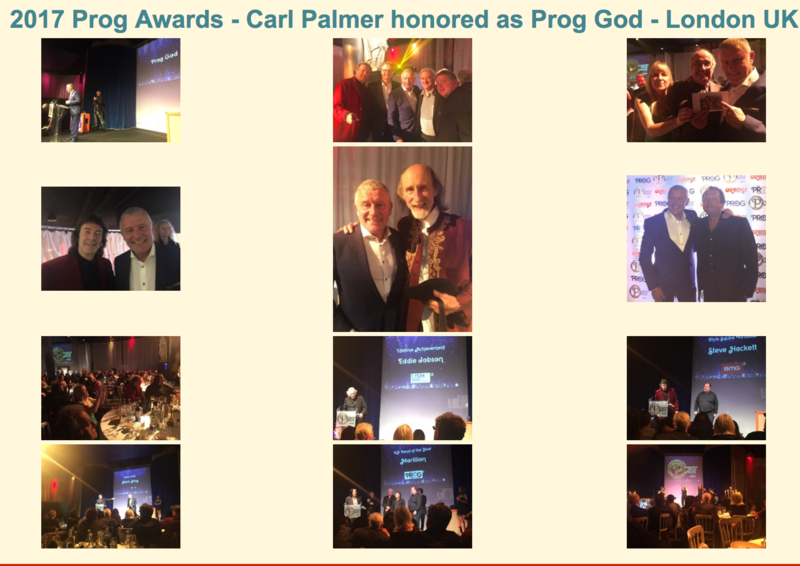 The Prog God at this years' Progressive Music awards - drummer, percussionist and songwriter - Carl Palmer has had a decorated career. As well as stints with Atomic Rooster and Mike Oldfield, he's also been a member of prog super group Asia. However he's best known as being one third of Emerson Lake and Palmer, along with Greg Lake and Keith Emerson. With both of his former ELP band mates passing away in 2016, Carl is the last man standing; something that he's painfully all too aware of. 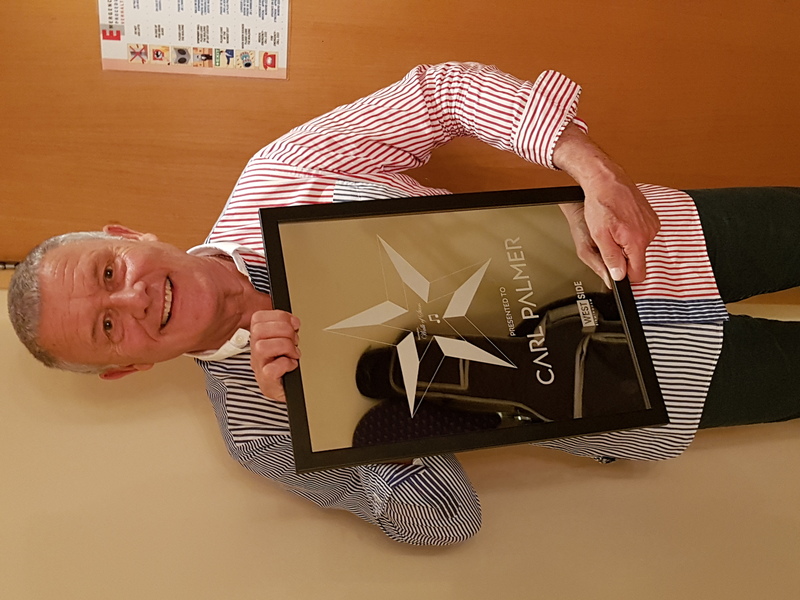 We spoke to Carl at the awards in London to discuss his legacy, the end of ELP, and his driven work ethic. Also, check out the Photo Gallery from the 2017 Prog Awards! Carl enjoying a few days break in the beautiful Lake District between tours in the USA and Canada. 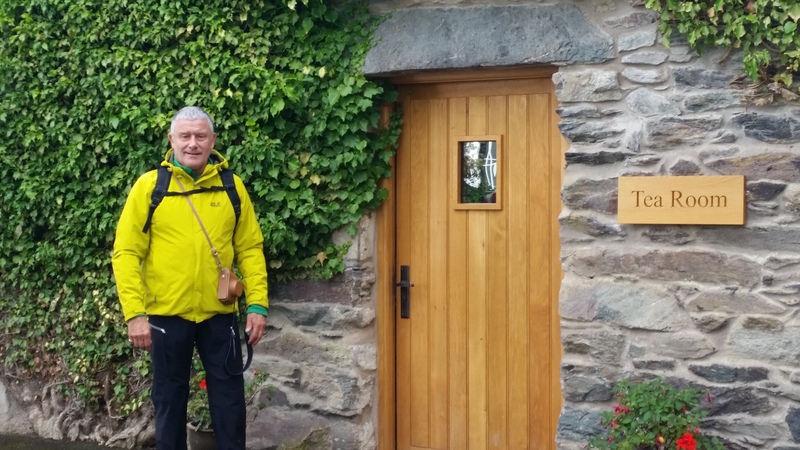 Here, Carl is taking a stop for lunch during a 7 mile hike around Ullswater, enjoying spectacular scenery. Carl with Fred at Fred's Ambleside Bookshop to pick up a copy of the book about Joss Naylor, the legendary Lake District fell runner and shepherd. 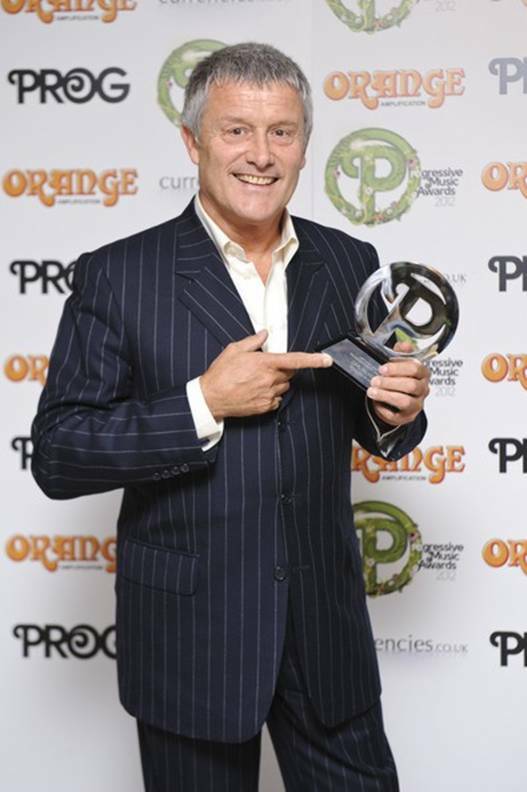 "Off to the Prog Awards in London.... there will be more to come later!" "Carl decided to get in training for his holiday at the end of the tour!" Deeply saddened to hear the tragic news of the death of Virgil Howe, beloved son of Steve Howe, my friend and bandmate in Asia. "On our way home to the UK. Thanks for a great tour! See you in September and October." 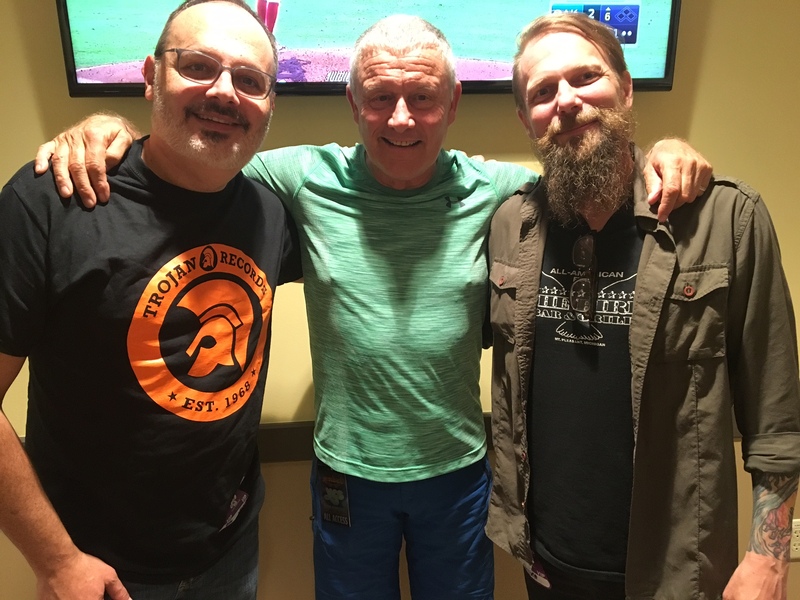 Carl Palmer greets two of the US representatives of the BMG Corporation, Michael Kachko and Jeff Christian, backstage at the Microsoft Theater in Los Angeles, where Carl Palmer's ELP Legacy was performing with Todd Rundgren and YES. Somebody get me a ladder an ark! 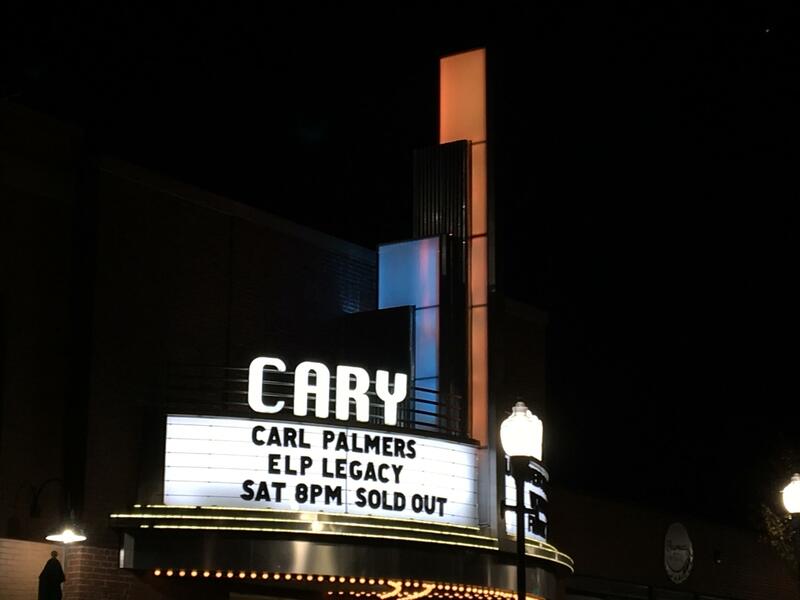 Carl talks about the deluge in Oklahoma City last night that right after Carl Palmer's ELP Legacy finished their set. And he gives a big thanks to the dedicated fans who stopped by the merchandise table to say, "hi! ", even in the rain. 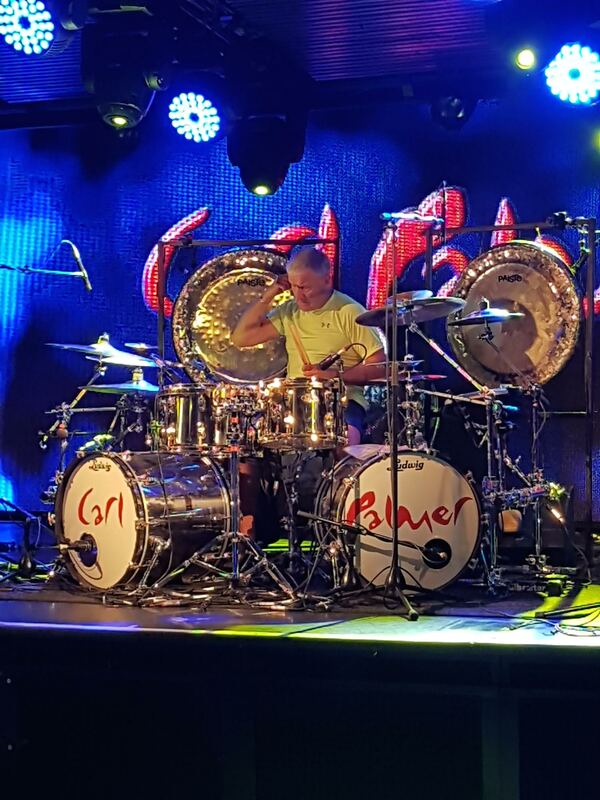 Check out the conclusion of Carl Palmer's drum solo during his set with his ELP Legacy band at the Nautica Amphitheater in Cleveland, Ohio. Sunday, August 20, 2017. Carl loves talking to the fans after his Yestival set! 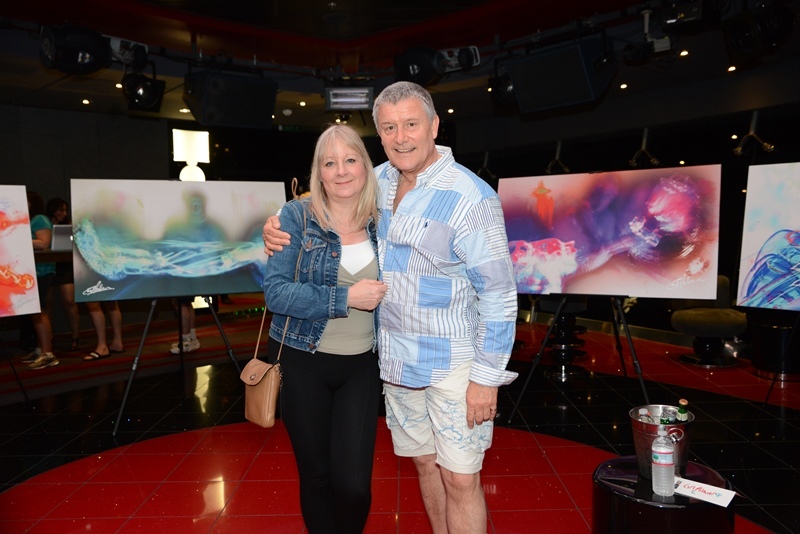 Carl Palmer's ELP Legacy on Cruise to the Edge! 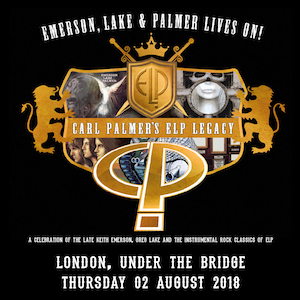 If you've been seeing Carl Palmer's ELP Legacy opening up the Yestival shows, you're just seeing part of their full show! 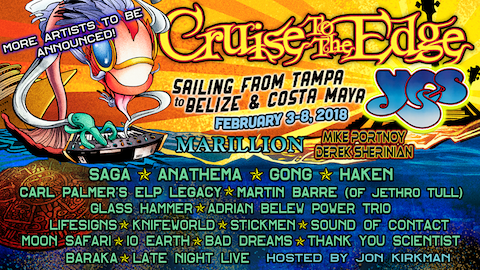 Catch the full show and hang with the band on Cruise to the Edge 2018 sailing from Tampa to Belize and Costa Maya. February 3-8, 2018! Or, if you can't join the band on the cruise, catch their headline appearances later this fall on their US and UK tours. 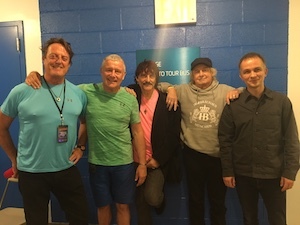 Five of the world's greatest drummers got to hang out backstage recently at the Yestival concert held at the The Ford Amphitheater at Coney Island, NY. Shown L to R: Prairie Prince (Todd Rundgren, The Tubes); Carl Palmer (Emerson, Lake & Palmer; ASIA); Carmine Appice (Vanilla Fudge, Cactus, Rod Stewart, Appice Brothers); Alan White (Yes, John Lennon); and Dylan Howe (Yes, Dr Feelgood's Wilko Johnson). All these drummers except for Appice are touring together on Yestival through early September. 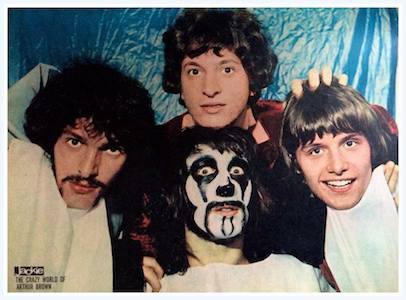 An early publicity still of The Crazy World of Arthur Brown featuring a 17-year-old Carl Palmer on drums. #1 worldwide in 1968! Gee – I wonder where Alice Cooper got his look from? 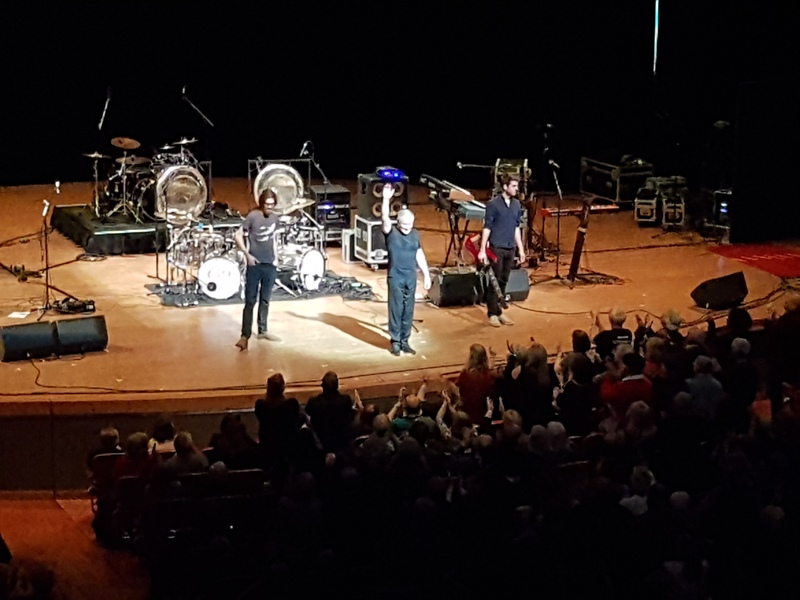 Carl Palmer's ELP Legacy got a roaring standing ovation once again as they performed on the Yestival tour with YES and Todd Rundgren. The show last night was at the Tower theater in Philadelphia. 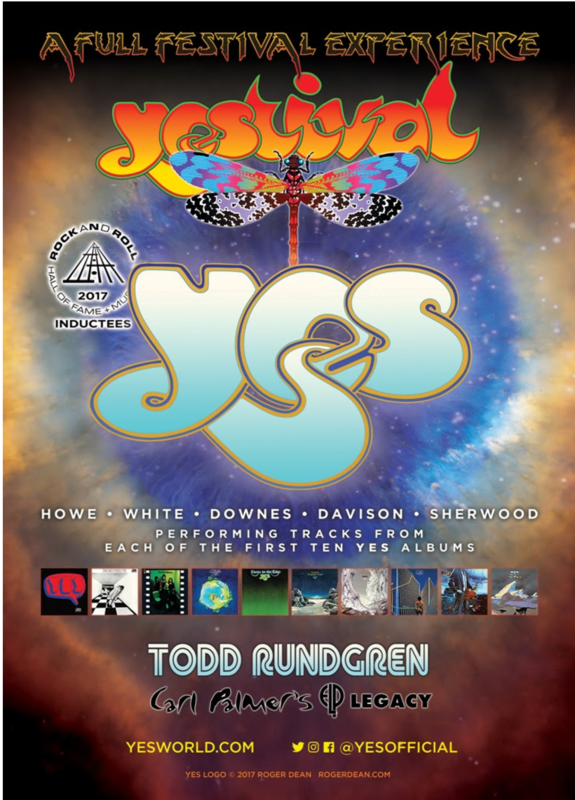 Carl reports on the Yestival experience and invites fans to join in. 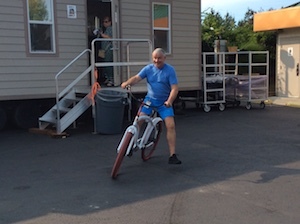 He lets us know that he, Paul, and Simon will be reporting in from the tour every few days. Baltimore's Finest, Sgt. Newberg (left) and Detective Sponsky (right) take a moment to show their appreciation for the music of Carl Palmer's ELP Legacy. 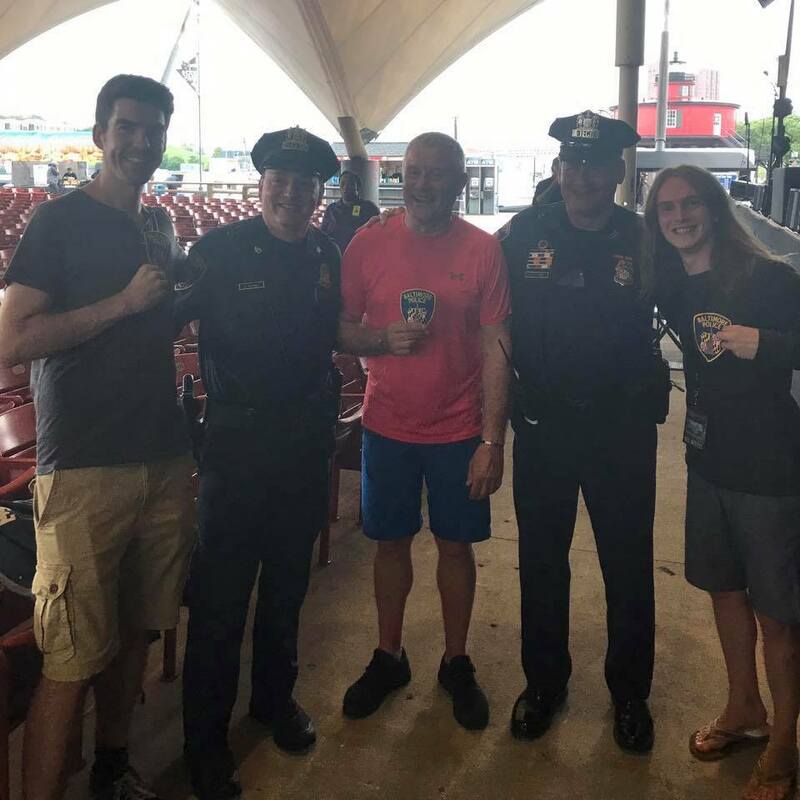 The police took the time to issue an official Baltimore Police Dept patch to Carl and his band, and thanked them for bringing back great musical memories of their youth! Complete list of Carl Palmer's ELP Legacy appearances is available on the Tour Dates page. 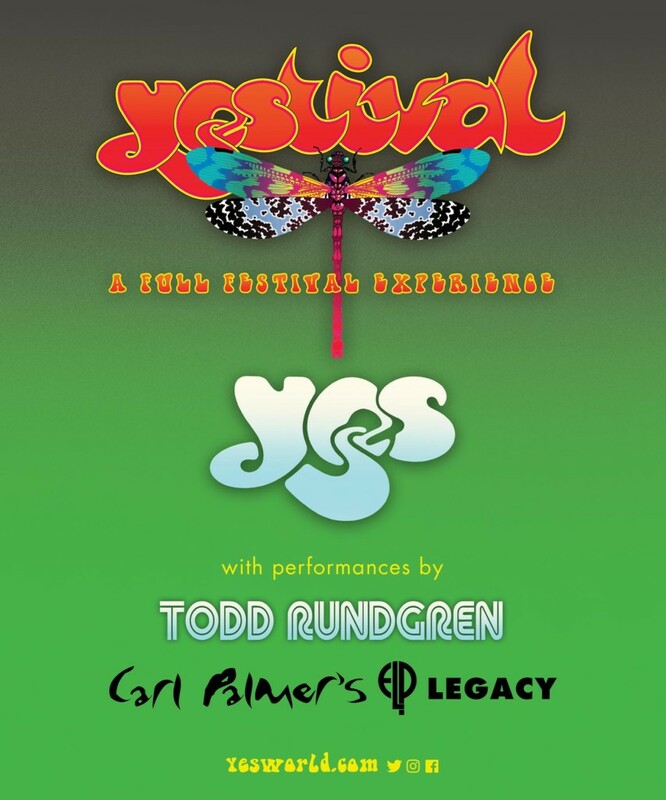 Carl Palmer's ELP Legacy starts the Yestival tour tomorrow (August 4) with Yes and Todd Rundgren! Emerson, Lake & Palmer drummer Carl Palmer has been named the Prog God for 2017 – and he'll pick up the award at this year's Progressive Music Awards in association with Orange Amplification in London in September. He's being honoured for his 50 years of service to the prog scene which, along with his body of work with ELP, also includes his career with multi-platinum selling supergroup Asia along with his solo work. ASIA performs Heat of the Moment as the finale on their final night of the Journey and Asia tour. 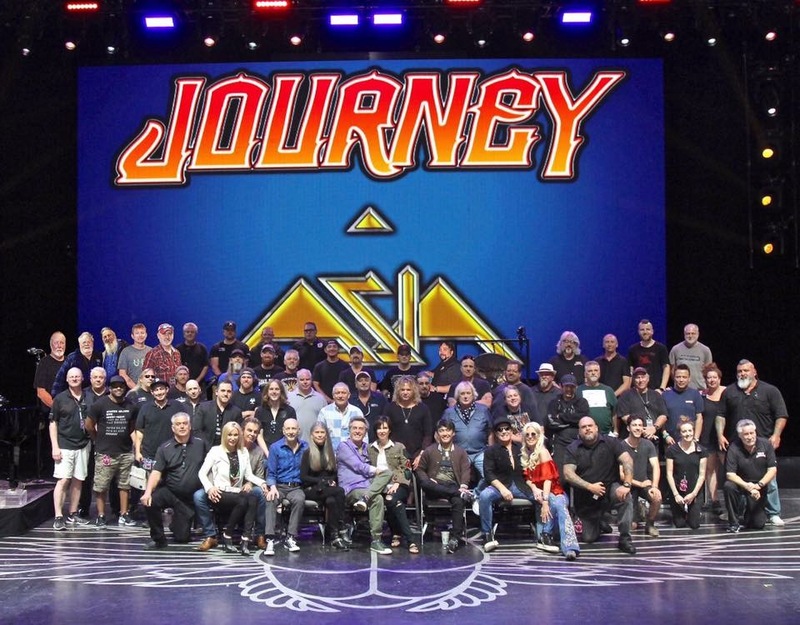 Thanks to everyone who came to the show and thanks to Journey for inviting us along! 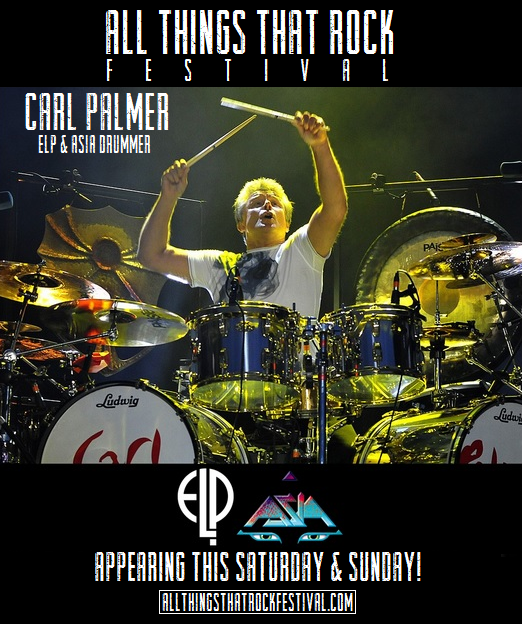 Carl Palmer welcomes everyone to see the ELP Legacy show on the Yestival Tour in August! All of the tour dates are on the Tour Dates page! It is a bittersweet moment as ASIA and its crew say goodbye to our wonderful tour-mates, JOURNEY. Our final show together is tomorrow, July 28th, and we will always be grateful for the opportunity they gave us on this tour. Amazing new Super Deluxe ELP Box Set FANFARE: ELP 1970-1997, out 29th September on BMG. Containing the classic albums, vinyl, hardback book, a wealth of unreleased audio and memorabilia. 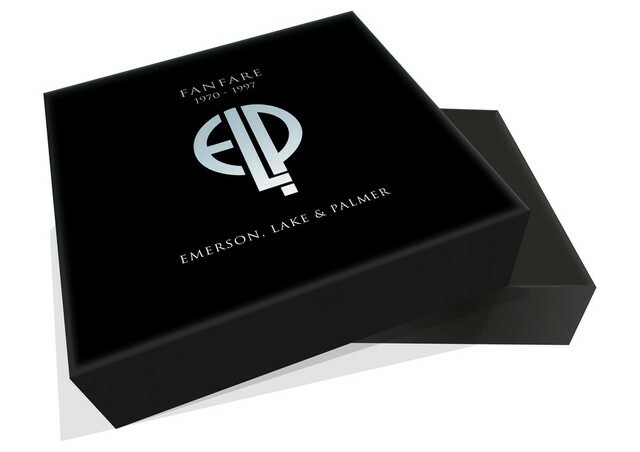 Visit the official box store now to pre-order the set, with exclusive collectable material, and see rare ELP video montage. 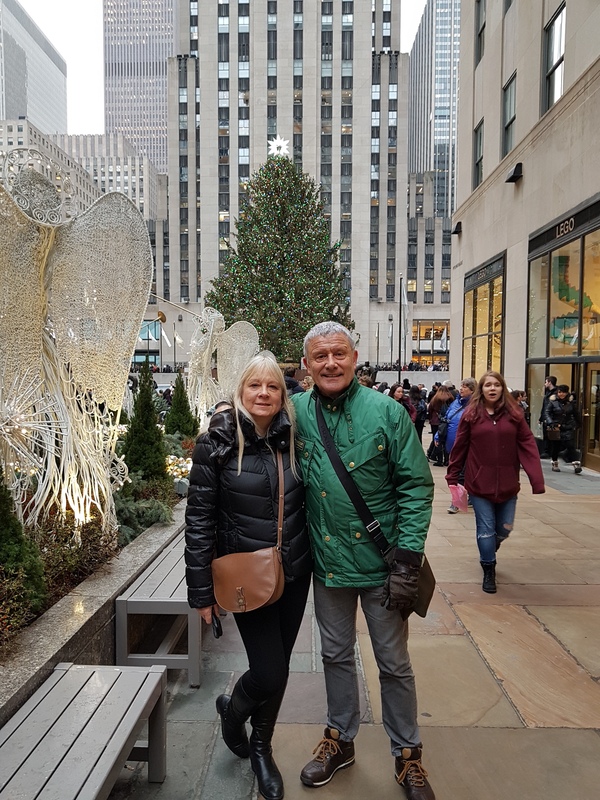 Carl took the opportunity to fly back to England, for a brief 36 hour visit, during the few days break in the Journey/Asia Tour in the USA. 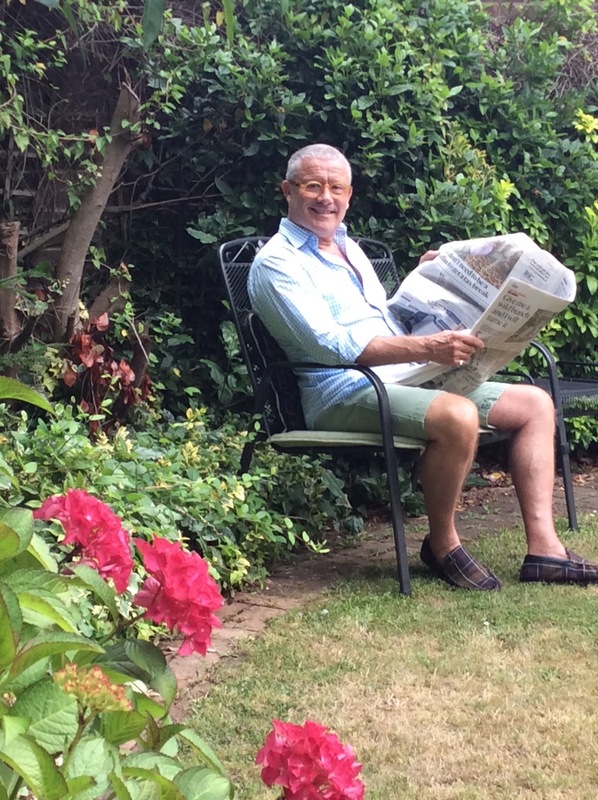 It was really lovely to catch up with the family and relax for a few hours. A long way, but well worth it. The shows with Asia continue on July 18 in Tucson, AZ and continue through the final show with Journey on July 28 in Washington, DC. 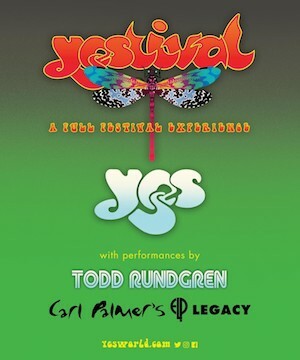 Then, the Yestival tour (where Carl Palmer's ELP Legacy will be appearing with Yes) starts on August 4 in Greensboro, NC. New posters/images for the Yestival tour! Featuring Yes, Todd Rundgren, and Carl Palmer's ELP Legacy! Click on thumbnail image for larger image. And... New dates added for the Elp Legacy tour in the UK in November and December 2017! 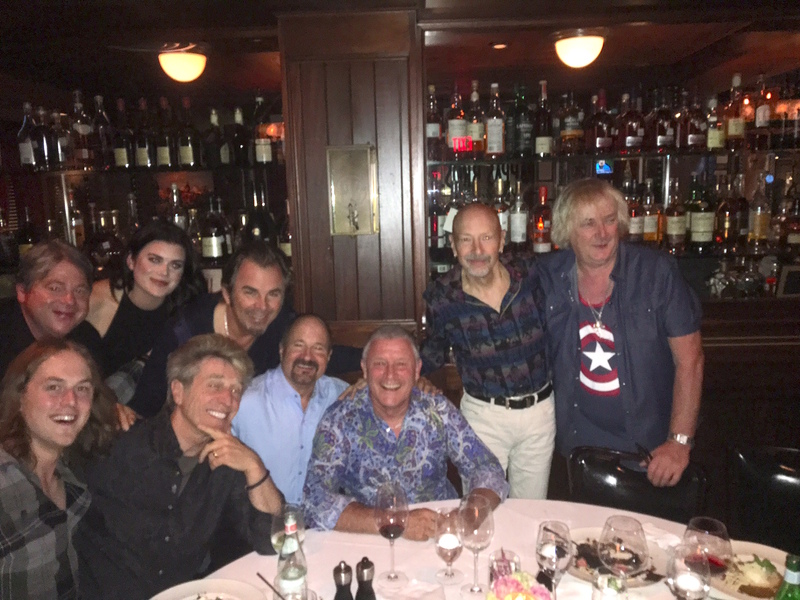 The members of ASIA and JOURNEY (bands and crews) recently took time from their sold out US tour to have a dinner together at the trendy Pappas Bros Steakhouse in Houston, Texas. A great time was had by all. Shown here (Standing L to R) Bruce Pilato (Asia tour mgr); Madison Cain; Journey's Jonathan Cain; Journey's Steve Smith; Asia's Geoff Downes. (Seated L to R) Asia's Sam Coulson; Journey's Ross Valory; Ken Silva (Journey Tour Accountant) and Asia's Carl Palmer. New dates have been added in San Diego, Reno, and Canada! 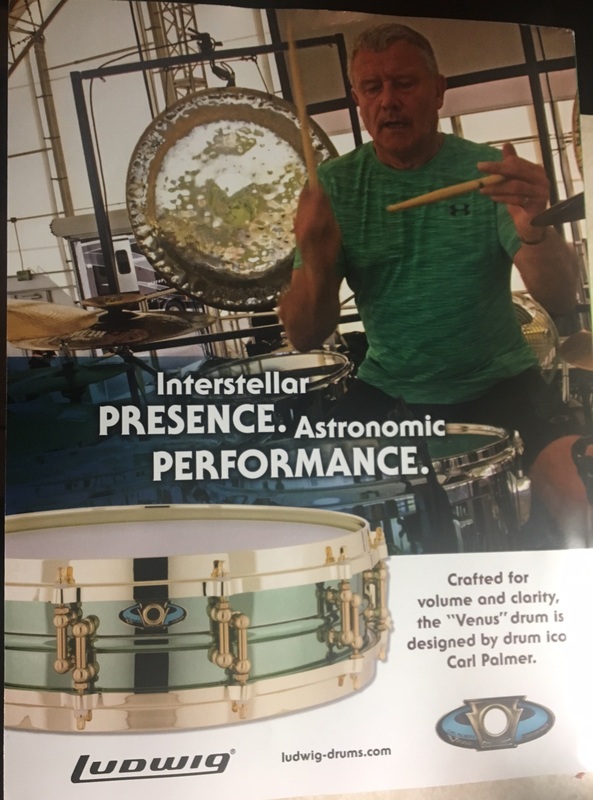 Very thrilled that Pollstar magazine ran a photo and caption on the recent Carl Palmer's ELP Legacy sold out show from The Arcada Theater in St. Charles. IL. Pollstar is the main source of information for us in the concert industry, so it is pretty big stuff when you get coverage. See the links on the Tour Dates page! 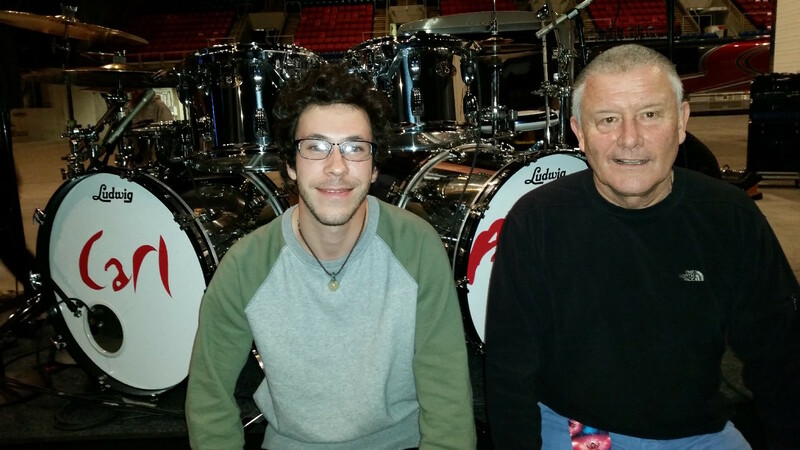 For full details on the entire 2017 tour itinerary for Carl Palmer's ELP Legacy including the October 2017 Canada tour dates, read the press release! 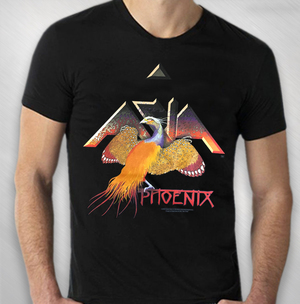 ASIA brings back classic Phoenix T-shirt! 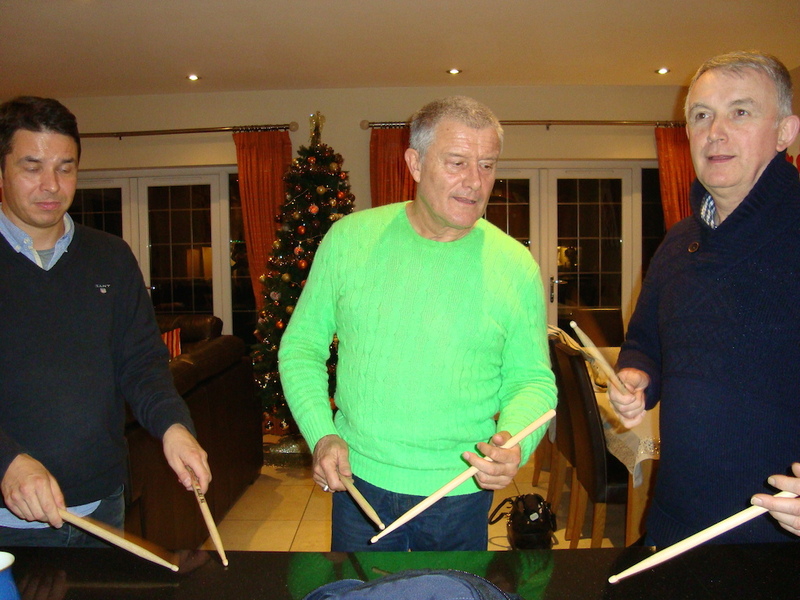 "This is one time Steve (my younger brother) and Ian (my nephew) played together. For me, it's history." "[...] The musicianship was incredible. 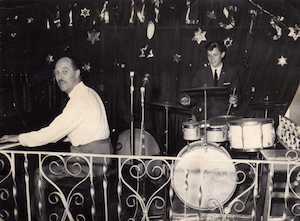 [...] Though he's 67 years old, Palmer beat on his drum set with a vigor more often seen in 20-somethings. 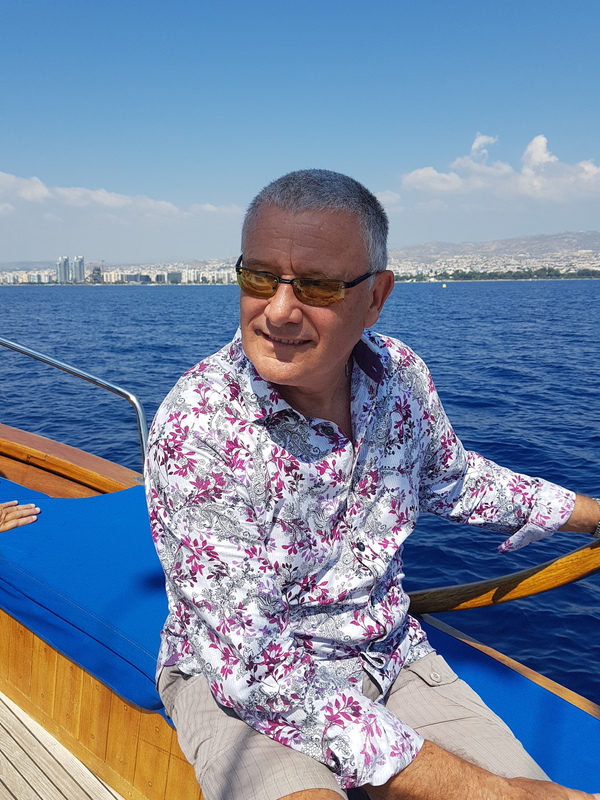 [...] I am most definitely one to seize the day, so if you have a chance to see Carl Palmer and his merry bandmates Paul and Simon live in concert, I wholeheartedly suggest you do so immediately. Theirs is a chemistry not often found in rock music these days [...]"
Read the whole review at http://livemusicnewsandreview.com/. Thanks for the great questions, Garret! Interview conducted on May 10, 2017 by Garret K. Woodward, arts/entertainment editor for The Smoky Mountain News and music editor for Smoky Mountain Living. 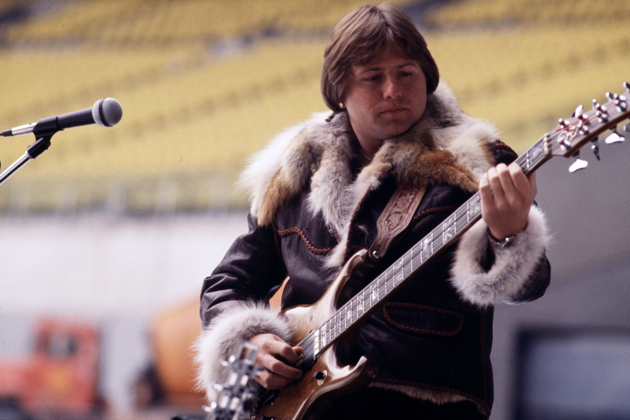 "[...] From our front row table, stage-left, at the Bull Run Restaurant, we had a great side view as Palmer and his band-mates, Paul Bielatowicz on guitar, and Simon Fitzpatrick on bass and Chapman Stick, proceeded to absolutely shred apart, and then reconstruct, (in such a great way) classic Emerson, Lake & Palmer songs. In the process, I might add, practically blowing our heads off (with the occasional, quieter ambient flourish, of course) for over two hours! [...]"
Read the whole review at Standing-Room-Only.info. 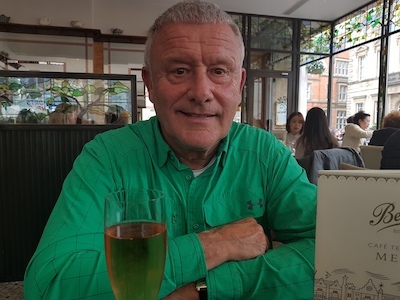 A video message from Carl Palmer talking about the end of the ELP Legacy US tour and the start of the new ASIA tour with Journey and the special John Wetton Tribute show. 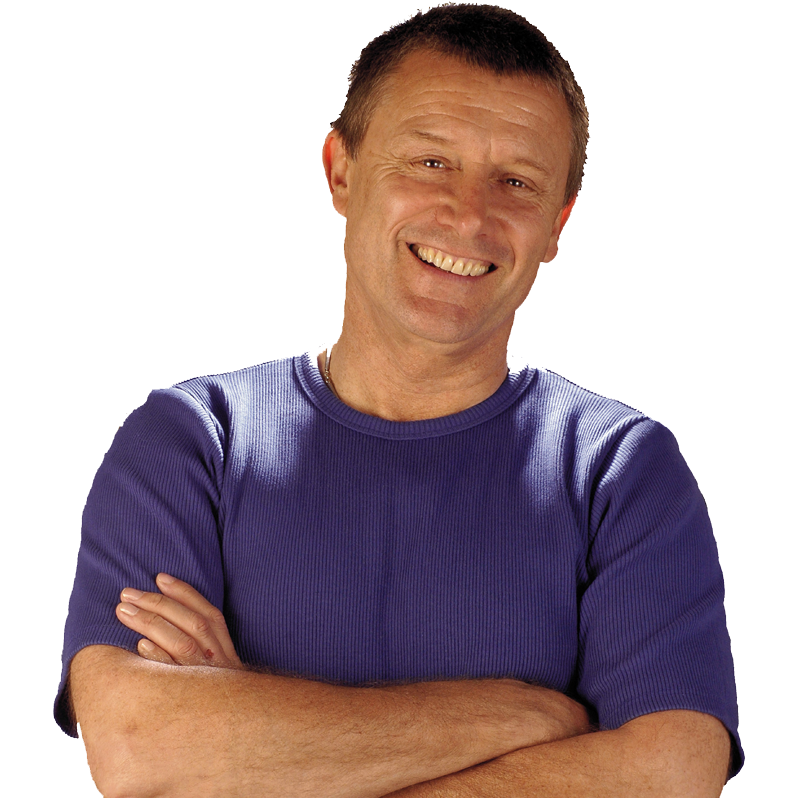 Complete list of Carl Palmer's Asia and ELP Legacy appearances is available on the Tour Dates page. 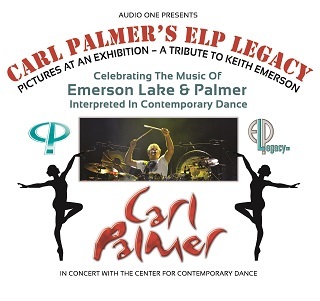 Don't miss Carl Palmer's ELP Legacy Emerson, Lake & Palmer Lives On! show at the Grey Eagle in Asheville, NC – Thursday, May 11th!! 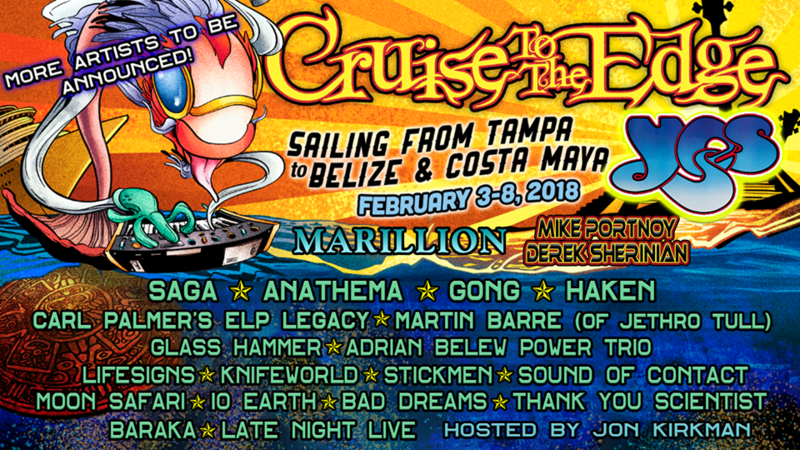 Cruise to the Edge 2018 - on sale now! 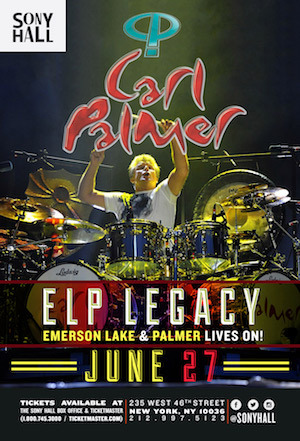 The US leg of the Carl Palmer's ELP Legacy tour starts tonight in Delray Beach, Florida and continues through June 3. Ticket link will be posted when ticket sales begin. 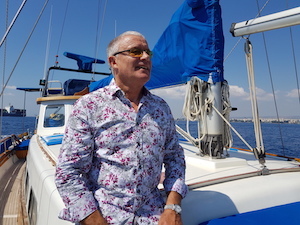 Sailing from Tampa to Belize and Costa Maya! 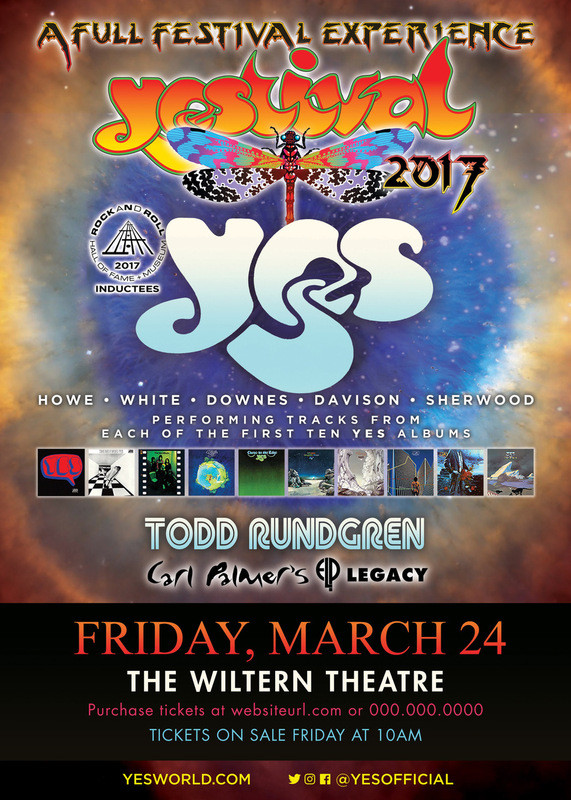 Tickets are now on sale for the Yestival shows with Yes and Todd Rundgren! 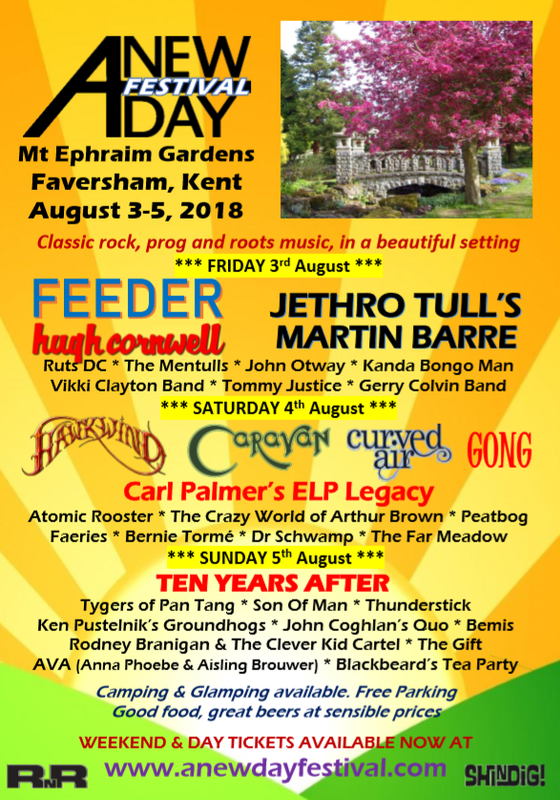 For full details on Yestival and the entire 2017 tour itinerary for Carl Palmer's ELP Legacy including the November 2017 UK tour, read the press release! 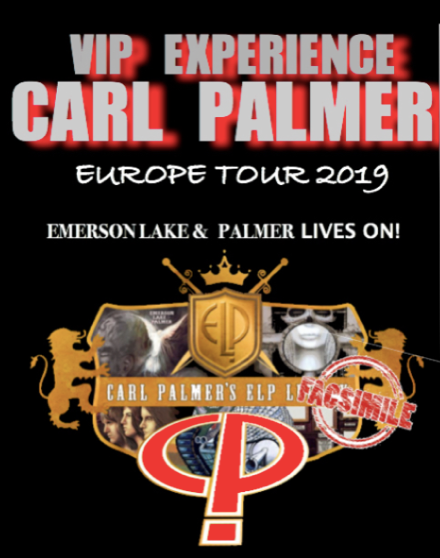 Carl Palmer's ELP Legacy is on tour in Europe! 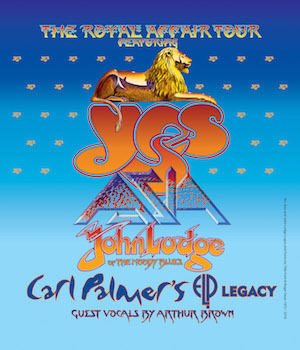 Carl Palmer's ELP Legacy in YES Yestival 2017 Tour! 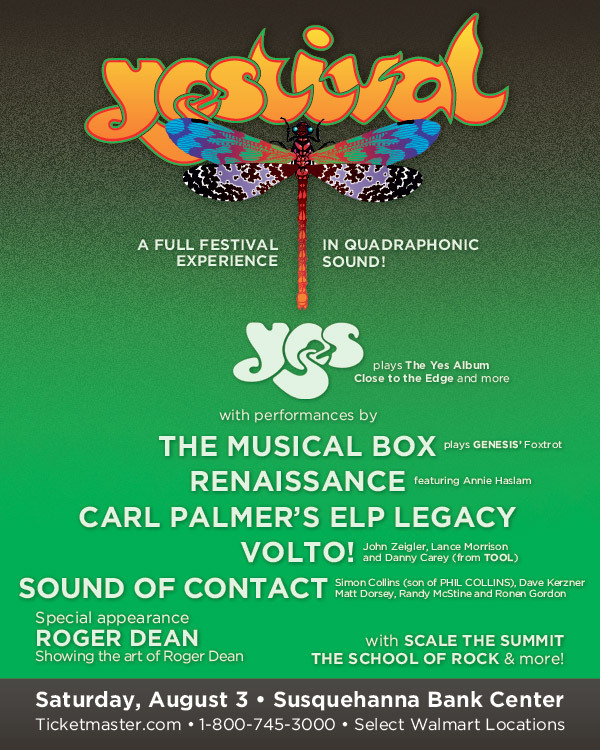 In addition to the other ELP Legacy and ASIA shows already announced, Carl Palmer's ELP Legacy will join YES along with Todd Rundgren as special guests on the forthcoming YES Yestival tour. The tour starts on August 4 in Greensboro, NC and concludes on September 3 in Tulalip, WA. Ticket presales begin April 13. Details will be added to this site soon. The current details including Yestival tour dates, ticket availability, etc. can be found now at YesWorld.com. Click on the image above to see the whole photo album. 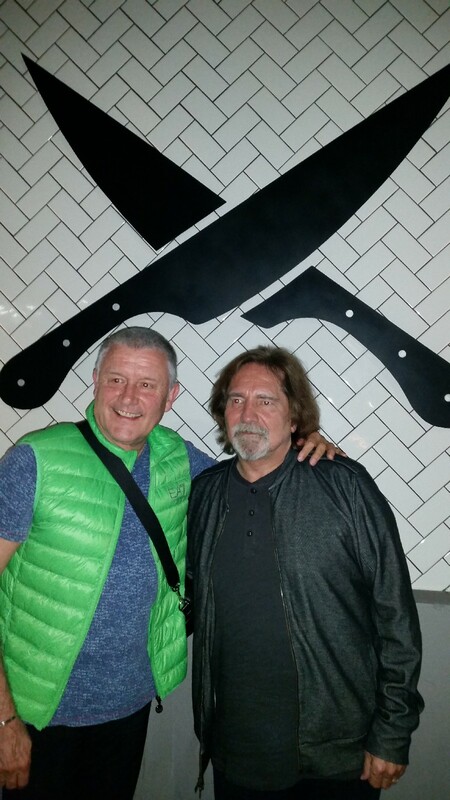 Carl hanging out with his friend, Geezer Butler from Black Sabbath at their favorite LA based vegan restaurant. 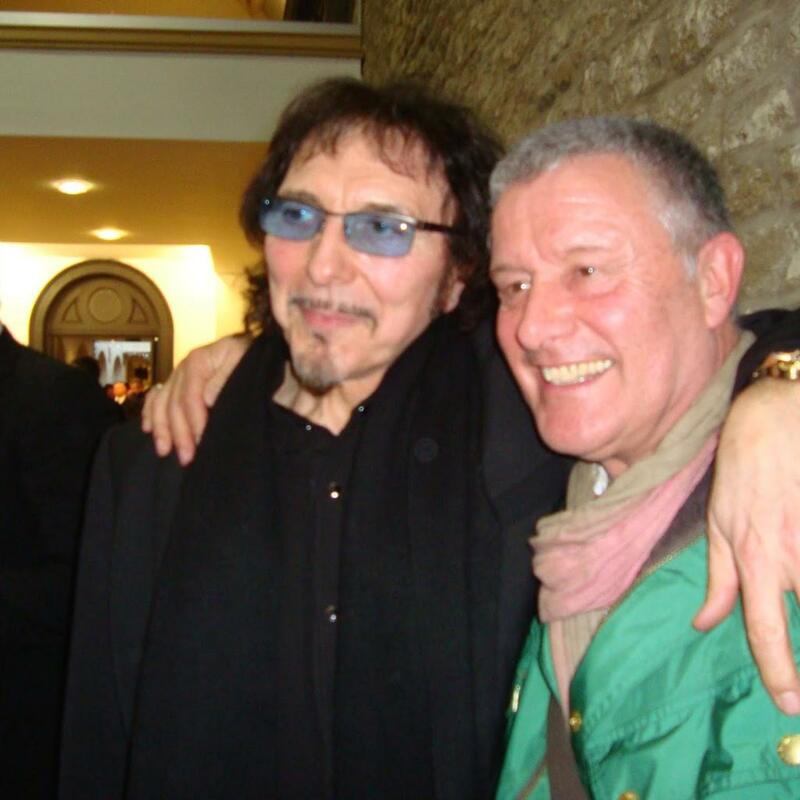 Carl was recently invited as a guest of Sabbath at their final ever show in Birmingham England. The other photos are of Carl with Josh Rose-Gailor (his drum tech on the ASIA tour; left) and Jake Linton (the bass and guitar tech on the ASIA tour; right). ASIA and their fans will pay tribute in a special concert to the late singer/songwriter, John Wetton, who spearheaded the legendary British band. The event is called "An Extraordinary Life" and will be a fully interactive celebration whereby fans can contribute to the remembrances of the acclaimed musician. It will be held on Saturday, June 17th at the Bergen Performing Arts Center in Englewood, NJ. "An Extraordinary Life", a reference to one of the band's most popular songs, will pay tribute to John. Special guest Billy Sherwood of YES is filling in as bassist and vocalist. Also appearing will be current ASIA members Carl Palmer, Geoff Downes, and Sam Coulson. The group will do a full set of ASIA music, as well as some of the best loved songs from the members' previous super-groups, bands such as King Crimson; YES; The Buggles; and Emerson, Lake & Palmer. Fans can submit their own memories (text, photos, and videos) for possible inclusion in the celebration. Read the details regarding fan submissions here. Read the entire press release for complete details about this special event. 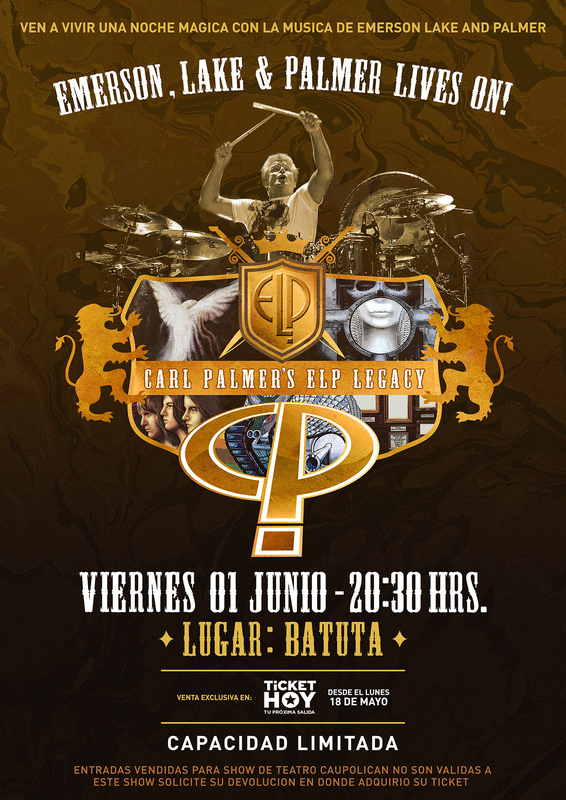 Carl Palmer's ELP Legacy is in transit to Mexico City! They're appearing at the Lunario on Thursday, March 9! 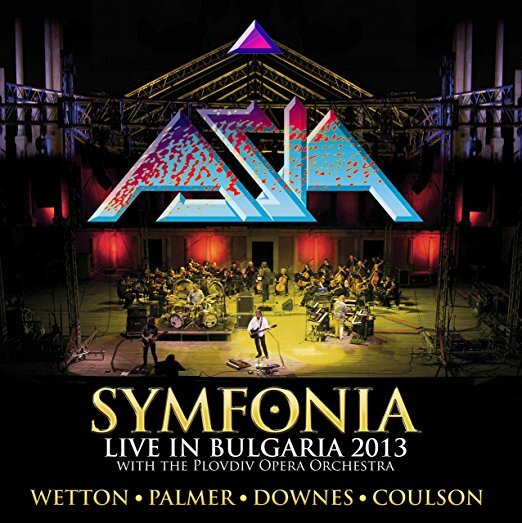 Today, Frontiers Music Srl is proud to release ASIA's new live album Symfonia – Live In Bulgaria 2013. In celebration of the live album's release the band has unveiled a performance video for "Heat of the Moment", ASIA's chart topping 80's anthem. Watch it below or on YouTube. Available on 2CD/DVD, Blu-Ray, and MP3 (audio only), the album was recorded during a special show on September 21, 2013 during the Sounds of the Ages Festival at the magnificent Second Century Roman Theater in Plovdiv, Bulgaria. 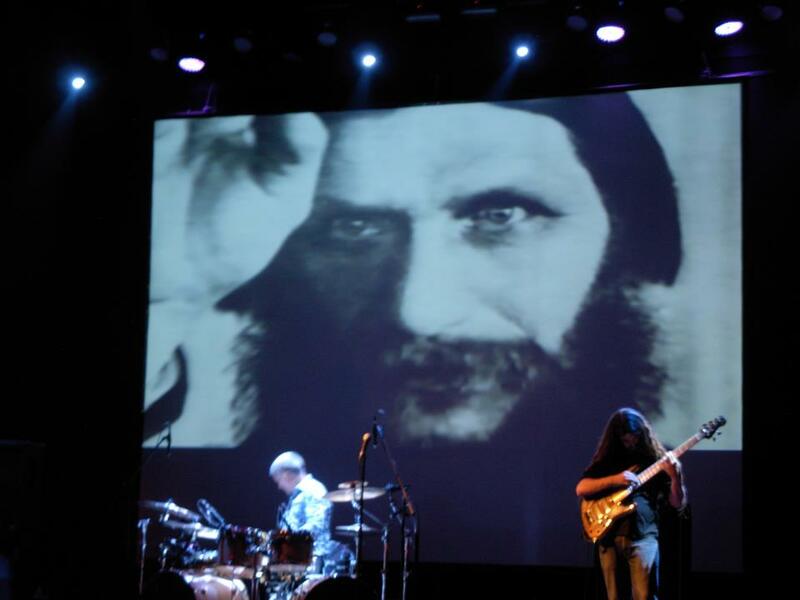 On some of the songs during the band's set, Original Asia was joined by The Plovdiv Philharmonic Orchestra, conducted by Levon Manukian. Carl Palmer, among the most renowned drummers in rock history and a founding member of both ELP and ASIA, has announced an extensive 2017 World Tour, EMERSON LAKE & PALMER LIVES ON!, a musical celebration of his late band mates Keith Emerson and Greg Lake and their group, ELP. See all the tour dates: South America, North America, Europe, and the UK! I'd like to thank all of you who have reached out and extended condolences to me regarding the passing of Keith Emerson, Greg Lake, and John Wetton. 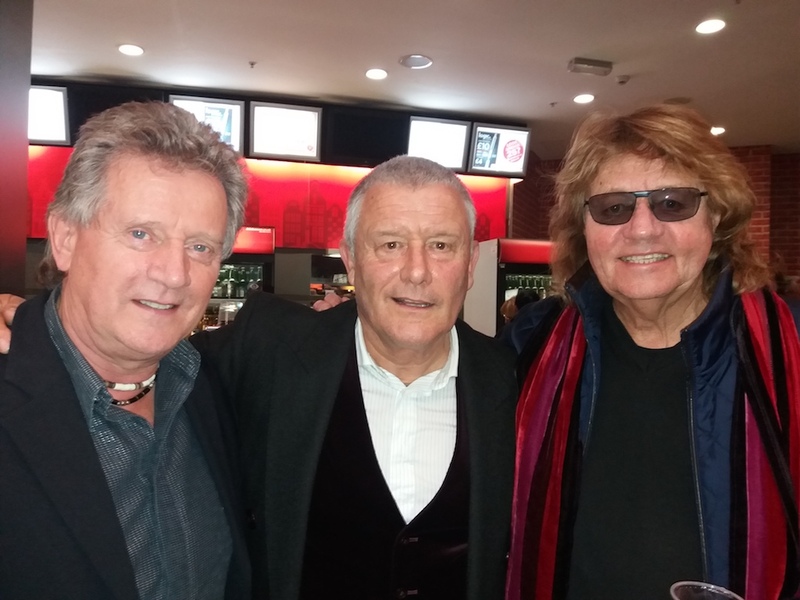 I was pleased to attend the final Black Sabbath show ("The End" tour) in their (and my) hometown of Birmingham on Saturday, 4 Feb.
"Carl Palmer enjoys a chat with former ELO and Black Sabbath drummer, Bev Bevan, and Phil Tree at the final Black Sabbath show held Friday in the UK." 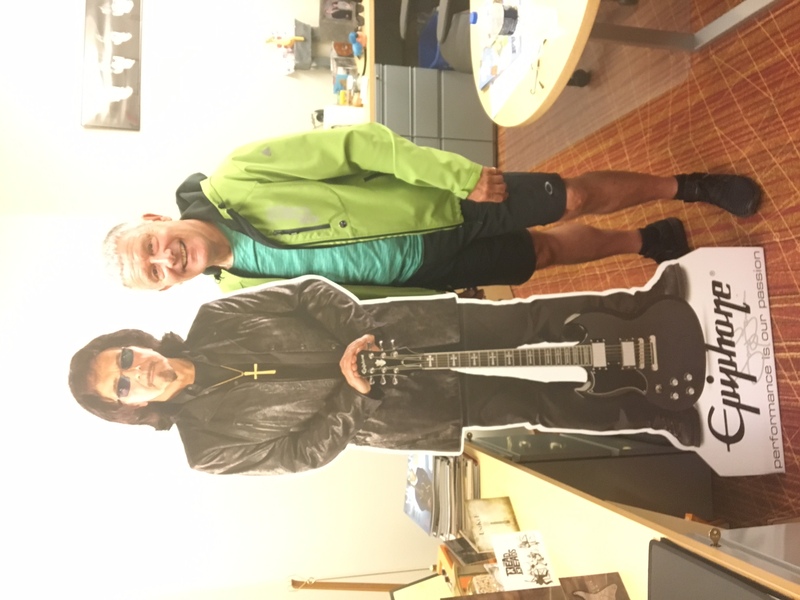 "Carl visits with Tommy Iommi after the show." ASIA Tour VIP Packages are now available! ASIA with special friend Billy Sherwood, will be on the Journey tour paying tribute to the musical legacy of John Wetton. See the tour dates and check out the VIP Meet and Greet and more packages. 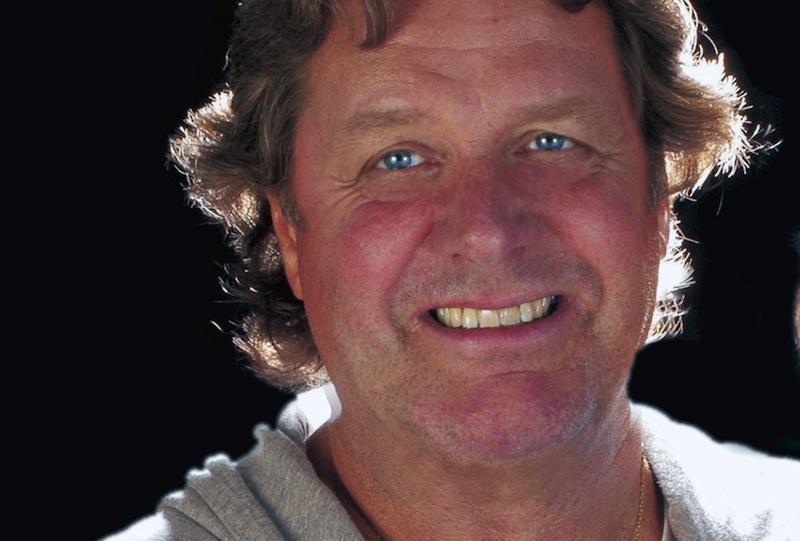 With the passing of my good friend and musical collaborator, John Wetton, the world loses yet another musical giant. John was a gentle person who created some of the most lasting melodies and lyrics in modern popular music. As a musician, he was both brave and innovative, with a voice that took the music of ASIA to the top of the charts around the world. His ability to triumph over alcohol abuse made him an inspiration to many who have also fought that battle. For those of us who knew him and worked with him, his valiant struggle against cancer was a further inspiration. I will miss his talent, his sense of humor and his infectious smile. May you ride easy, my old friend. "The music of Emerson, Lake & Palmer doesn't divide people — it brings them together." 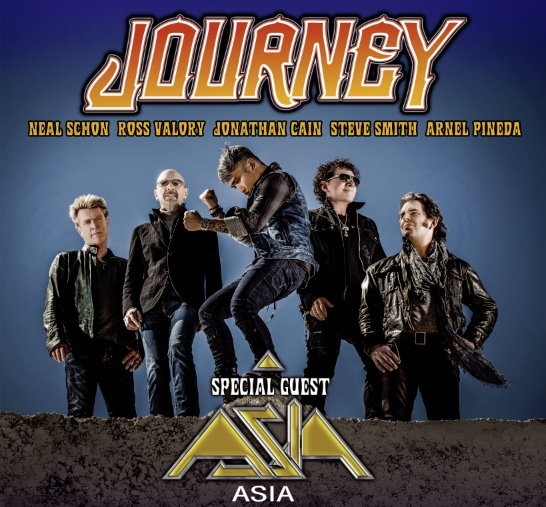 Second leg of ASIA tour as special guest of Journey announced! 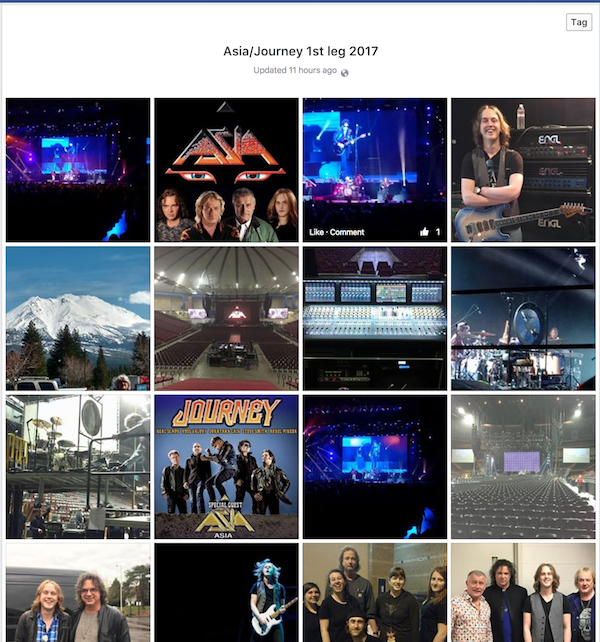 Asia is pleased to announce the second leg of their 2017 tour with Journey. The second leg starts June 5 in Tulsa, OK and concludes July 15 in El Paso, TX. Hope to see you at one of the shows! I have to withdraw from Cruise to the Edge, and from the first leg of the Journey tour, March 15 – April 4. I will soon be starting a new medical chemotherapy procedure, under which I will not be able to fly. I am grateful to the promoters of the Cruise. I wish them pleasant sailing and I know my friends on the cruise, both artists and fans, will have a ball on the ocean wave. I will be with you all in spirit. My good friend, Billy Sherwood, will fill in for me within Asia, keeping my seat warm during the initial 12 Journey dates. While I am naturally disappointed to miss the beginning of what I know will be an historic ASIA tour, I am intending to return to the stage with Asia later in 2017, dates soon to be announced. I know this decision will be in the best interests of my health and our fans, in the long run. 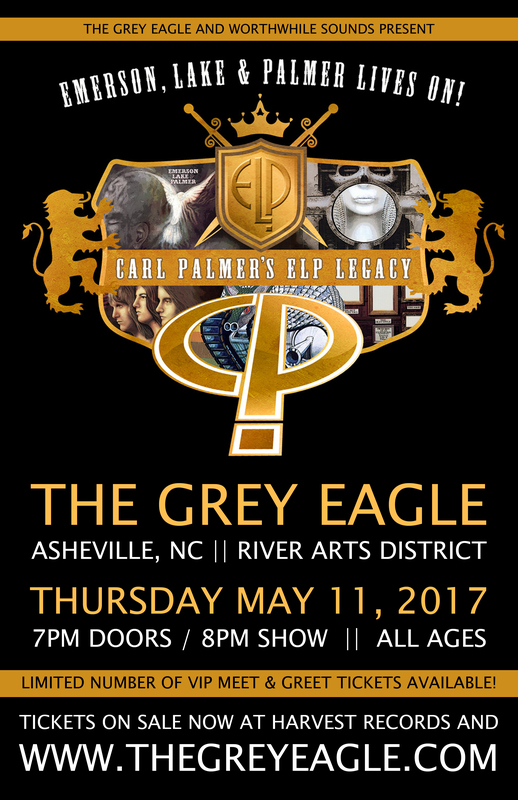 The first set of 2017 tour dates for Carl Palmer's ELP Legacy has been released. The tour starts April 8 in Munich (Germany) and proceeds through April 24 near Verona (Italy). See all the tour dates here! 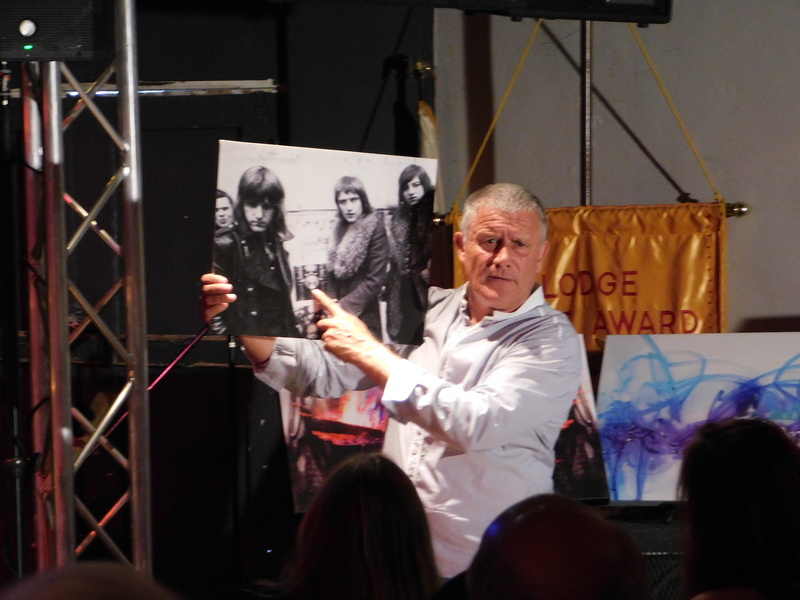 I have been working hard with Scenefour and after a few days of working with them I think we have a new canvas that will be a tribute to Greg Lake and it will be called "Lucky Man". I need to live with it for a few more days but I am very happy with what we have got. I will post it as soon as I can. Keep a look out. We have plenty of touring this year with CPL and Asia so I am sure I will have a chance to see you all sometime. My condolences go out to the family of Rick Parfitt and all of the STATUS QUO band. Red Sky at Night is one of my all time favourite tracks. We will miss the energy, Rick. Merry Christmas and Happy New Year for 2017. Legendary British band to tour for the first time since 2014. After a three year absence, British super-group ASIA has announced it will embark on a lengthy US tour as the special guests of Journey. The band is delighted to have received this special invitation from such esteemed musical friends. Read the entire Press Release. See the tour dates announced so far. More to be announced! I am very sorry about some of the Carl Palmer's ELP Legacy dates in April being moved around. This is to accommodate the tour with ASIA which has happened just last week with a wonderful invitation from our friends in Journey. 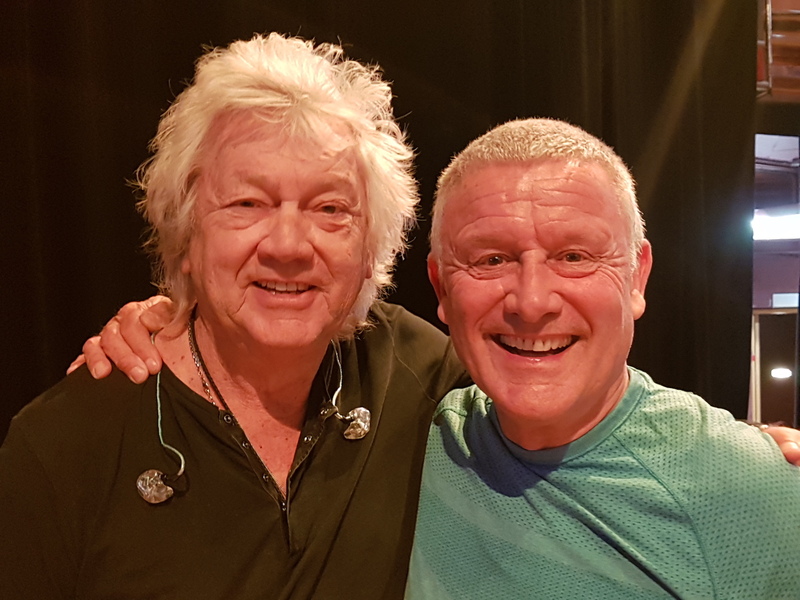 I am looking forward to working again with ASIA and John Wetton now that he is able to play and I hope it all goes very well for him and the band. 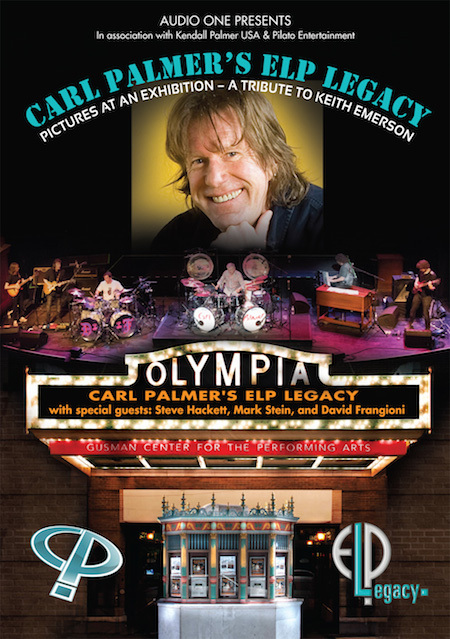 I will be re scheduling the dates that were orginally planned for April for Carl Palmer's ELP Legacy with my agent. We are working on it now. Looking forward to seeing you all very soon. Hope all of you have a great Christmas! Filmed Live in Miami June 2016!!! Track list includes full version of Pictures an an Exhibition and much more! See full track list and order here! 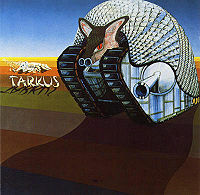 Track list includes full version of Tarkus and much more! 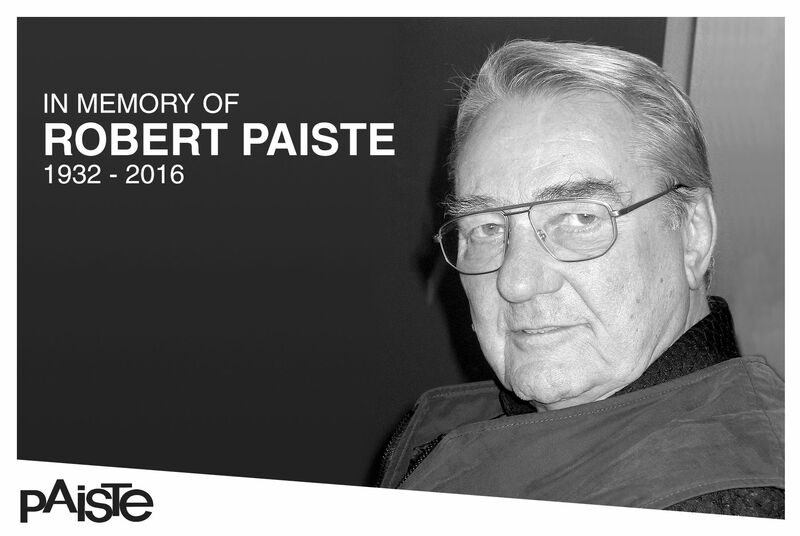 Robert was a friend and true innovator in the industry of cymbal manufacturing. He will be greatly missed now and in the future. With the dream of another Emerson, Lake & Palmer reunion gone, at least fans can enjoy the music, celebrate the genius of Keith Emerson, and see Carl Palmer and his band bring that same brazen and incalculable spirit to the playing of the progressive rock bands of the 70s. 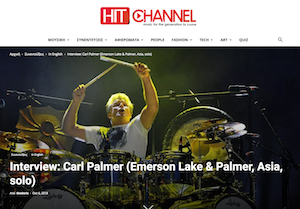 Ken Sharp at Rock Cellar Magazine spoke with ELP founding member drummer, Carl Palmer, for a look back at all things ELP and Palmer's tour paying tribute to their music and the mastery of Keith Emerson. 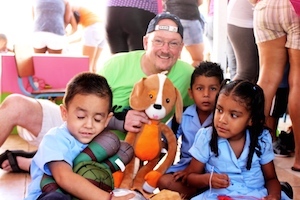 The shows posted last week originally planned for late November and early December in Central America (Mexico, El Salvador, and Panama) have been postponed by the promoter and are due to be rescheduled next spring. We are sorry for any inconvenience this may have caused. Read the entire interview at MusicAficionado.com.com. 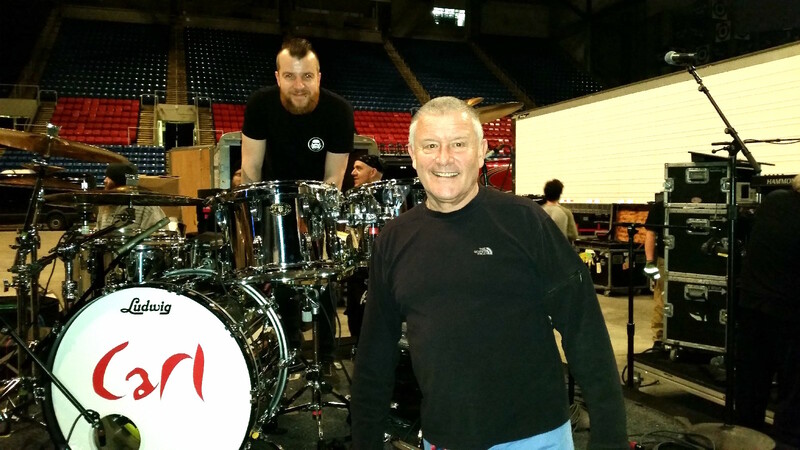 Jeff Mann, drummer for the popular band, Consider The Source, got to share the bill and spend some time with his drum hero, Carl Palmer. 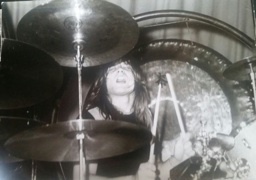 Jeff had met Carl at the age of 15 at a drum clinic; with the band's appearance at the 2017 Progtober Festival at Reggie's in Chicago, he was able to update the photo. Says Mann: "Thanks again for having Carl say hello to me after the show we did together at Reggie's on Sunday. It meant a lot to meet one of my heroes who inspired me to play the drums and chat with him for a bit. Here is the picture we took together as well as the old one as a 'before and after'. 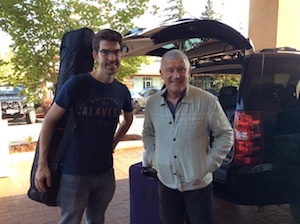 Safe travels on the road and please extend my thanks to Jake as well for being so thoughtful." Due to circumstances beyond our control the Carl Palmer master class and art event scheduled by The Music Annex in Fort Lee, NJ on November 6th has been cancelled by the promoter. If you have purchased tickets please contact your point of purchase for a refund. 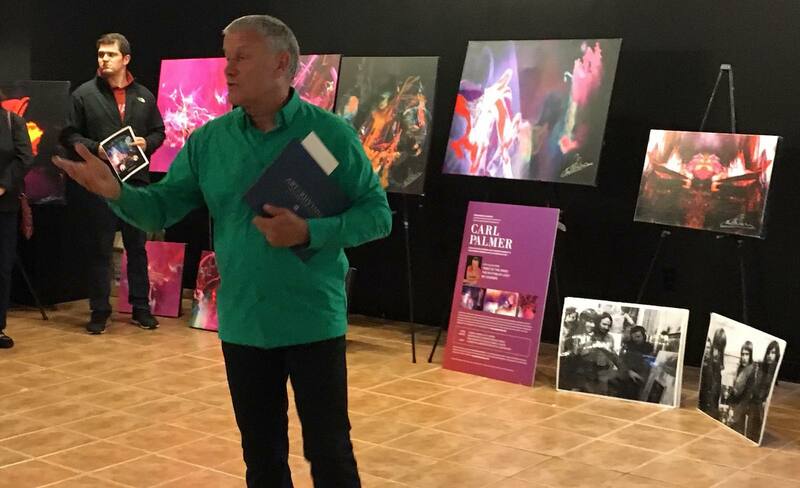 Carl Palmer, one of rock's iconic figures, and a founding member of both Emerson Lake & Palmer and ASIA, in association with Los Angeles art company SceneFour, recently completed a number of charity art events that have benefited Musicians On Call; The Arts Garage Performance Art Center; and St Jude Children's Hospital. The events resulted in the sale of 46 original Palmer canvases, a portion of the whose proceeds will be distributed to these very worthy causes that Palmer is supporting. Read the full press release or visit the Art of Giving page. 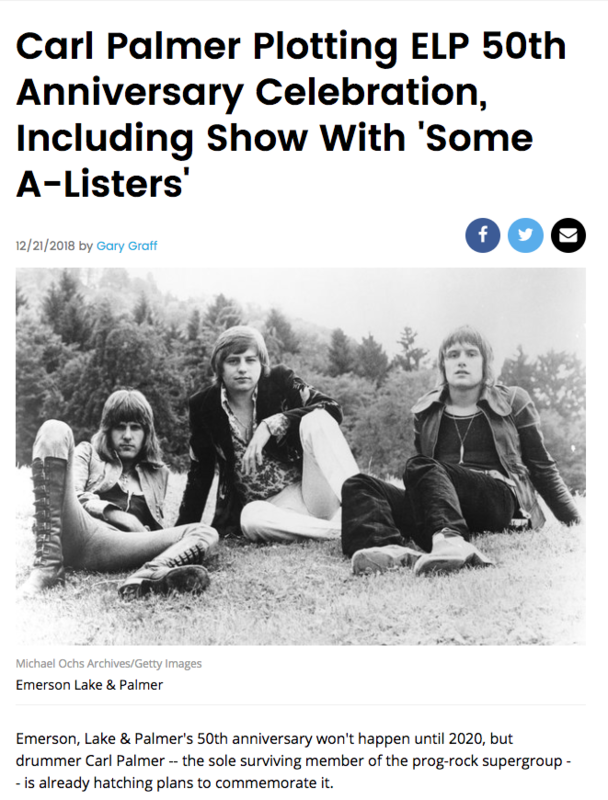 Newsweek: "Speaking with ELP's L&P: Greg Lake and Carl Palmer"
This week's Culture section has an article about ELP featuring interviews with Carl Palmer and Greg Lake. Newsweek spoke with Lake and Palmer about Emerson's enduring legacy and the groundbreaking trio that he co-founded. [...]"
Germany tour dates for 2017! While we get ready for the 2nd part of the 2016 tour, we're also looking ahead to 2017. The initial dates for a 2017 tour of Germany have been announced. 2 more dates just added to the fall tour! Tour starts October 19th in Wisconsin and concludes on November 21st in North Carolina. 14 dates announced. More to be announced. I am deeply saddened by the loss of my great friend, David Enthoven, who was the very first manager of ELP along with John Gaydon. I was looking forward to going out with him sometime year. We always had a great time. Now this is not going to happen; forever lost. David thank you for being such a guiding light. Thanks for fan, Dieter Petzold, for sharing some photos from ELP's June 13, 1971 show in Düsseldorf, Germany. Now in our ELP Photo Gallery. See all the Photo Galleries! A new show was just added to the tour. Sunday, 31 July 2016, Carl Palmer's ELP Legacy will appear at the Nice Music Festival at the Hall Cultural Center in Banska Stiavnica, Slovakia. Festival, venue, and ticket information here. 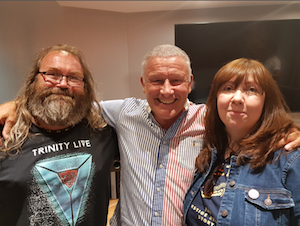 New on In The Studio with Redbeard, "Carl Palmer and Greg Lake tell the tale of the groundbreaking 1970 debut containing Knife Edge, Take a Pebble, and the hit Lucky Man, plus the ahead-of-its-time opus Tarkus in 1971, with archival comments from the late Keith Emerson in part one. 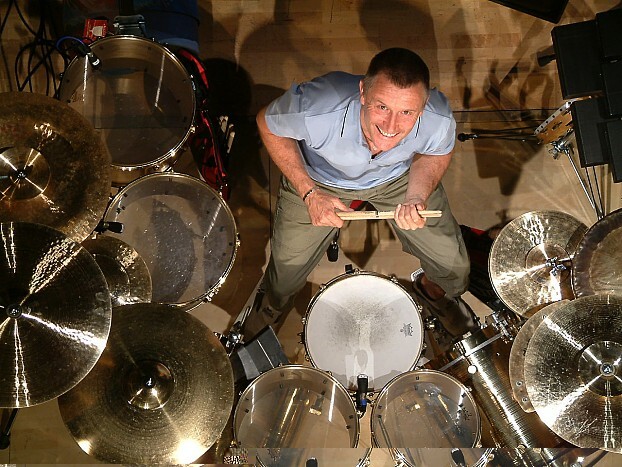 When it comes to rock and roll drummers, Carl Palmer joins the ranks of the most regarded drummers in the genre. 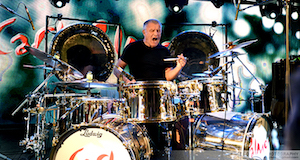 Under the touring name of Carl Palmer's ELP Legacy, the drummer intended it to be a celebration of his 50th year as a professional musician. 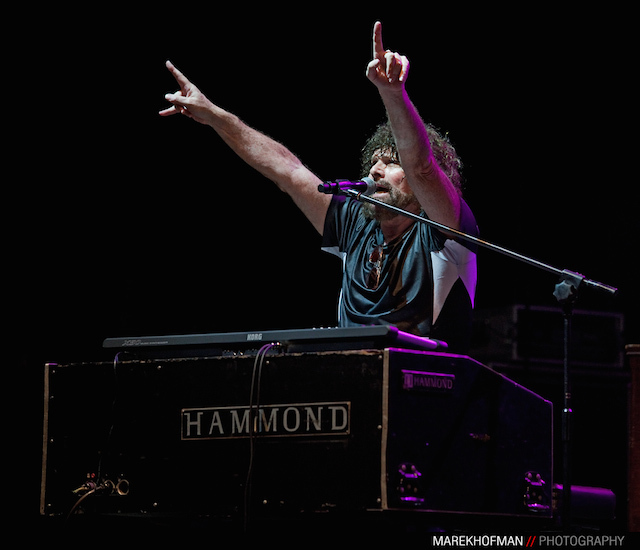 However, in early 2016 when tragedy struck his former bandmate Keith Emerson (who was set to join Palmer on a few shows), the show quickly turned around to a tribute to Emerson. Carl appeared on the NBC Dallas/Fort Worth (TX) Channel 5 morning show on Tuesday, July 12. My thoughts and prayers go out to the great city of Dallas and all its people. And my deepest thoughts are with all the families who have suffered so much over the last few days. Every human life is valuable in this great world we all live in. 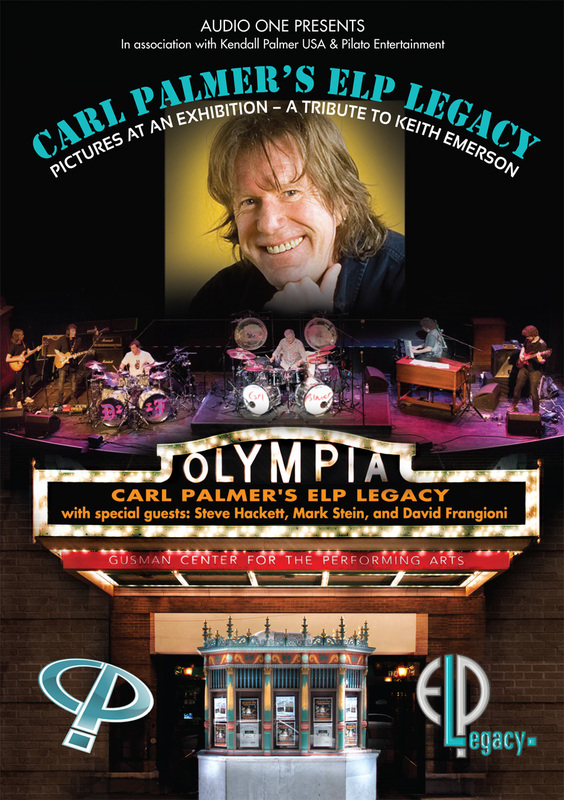 The June 24th Tribute to Keith Emerson show at the Olympia Theater was an overwhelming success. 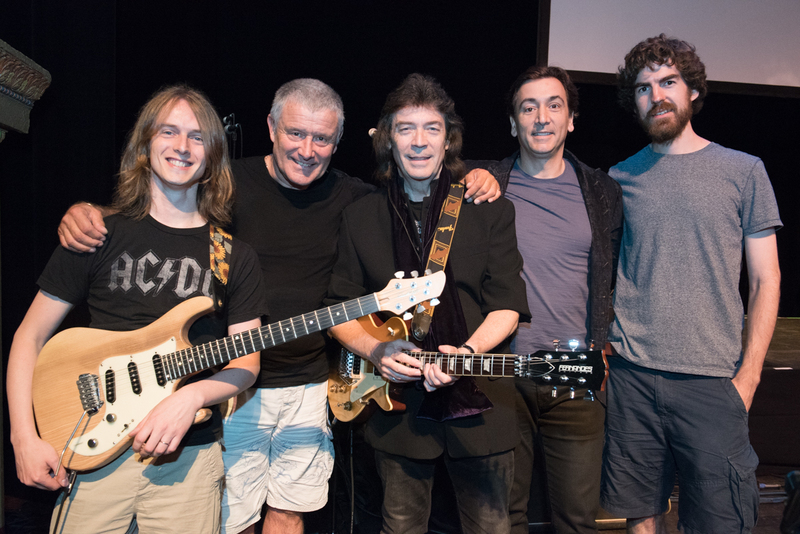 Special thanks to our special guests Genesis guitarist Steve Hackett and Vanilla Fudge keyboardist and singer, Mark Stein, and to our producer and guest drummer David Frangioni. 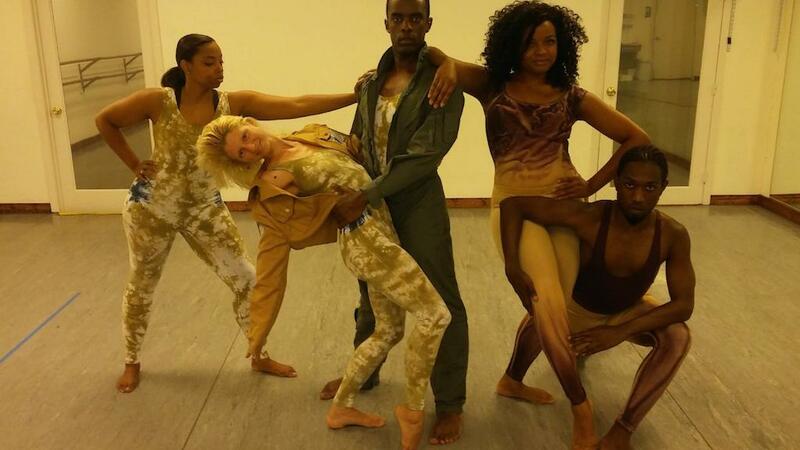 Members of The Center for Contemporary Dance prepare for their appearance during Carl Palmer's ELP Legacy "A Tribute to Keith Emerson" concert. 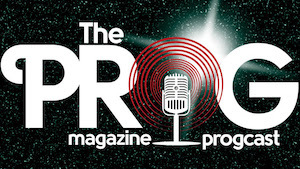 The show, which also features Steve Hackett of Genesis and Mark Stein of The Vanilla Fudge will be held Friday, June 24th at the Olympia Theater in Miami. See all the tour dates. 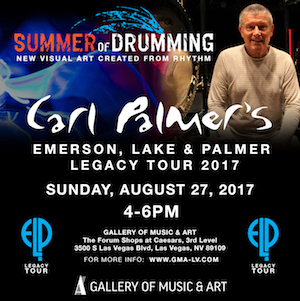 Carl Palmer's ELP Legacy continues its highly successful REMEMBERING KEITH AND THE MUSIC OF EMERSON LAKE & PALMER 2016 North American Tour. Of the first 7 shows 5 have been standing room only! The sell outs will continue throughout the tour which ends July 12th in Dallas, TX. A second leg of the tour is being planned for Fall 2016. 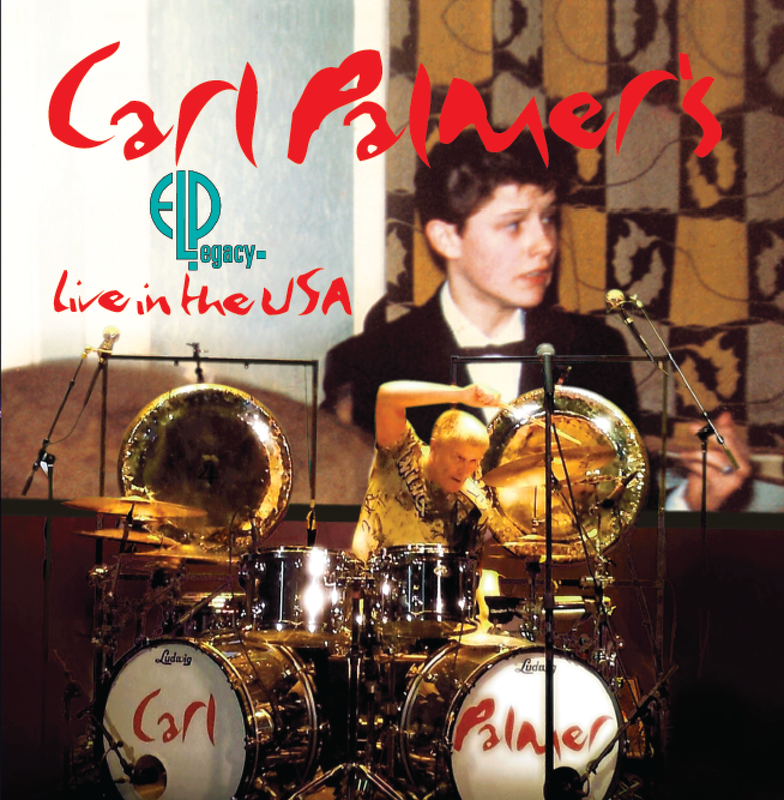 Carl Palmer has released Live In The USA with his acclaimed ELP LEGACY band. 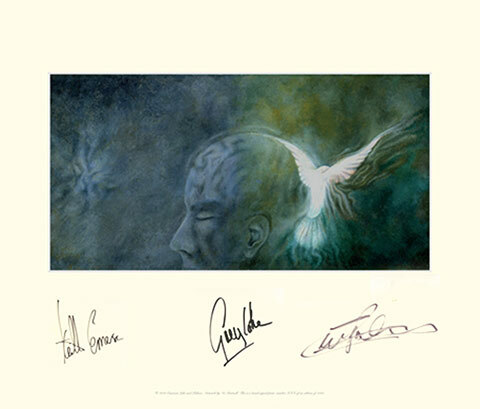 The album, recorded at Buffalo's Tralfamadore Music Hall, features several ELP classics, as well as other prog music staples from The Nice and King Crimson (two bands that featured ELP's Keith Emerson and Greg Lake). 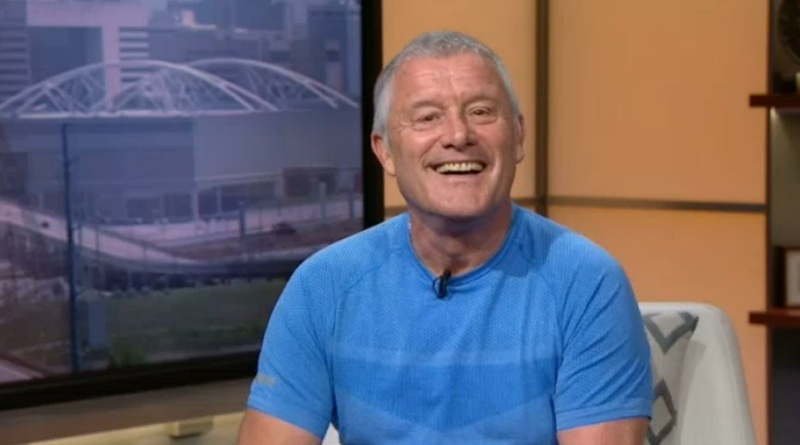 The album will be official released on July 12th, with copies available now at all Carl Palmer shows. Live In The USA has been dedicated to the late Keith Emerson, who died tragically in March of 2016. 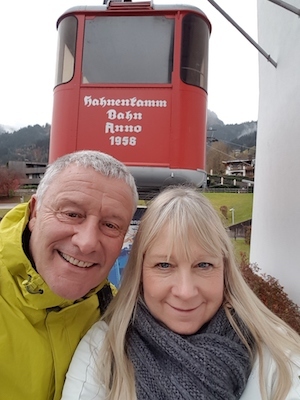 "Keith's death hit us all hard, and it was very sad for me since he and I had been discussing working together again in 2016," says Carl Palmer. "All I could do was finish the album with his spirit in mind, and dedicate it to him." See the track list and read the entire Press Release. 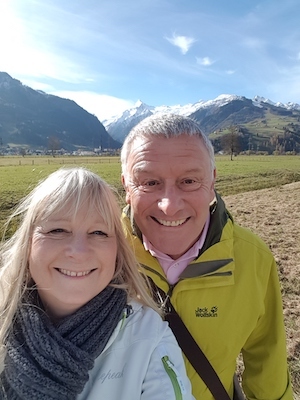 Thanks to Rick Stein, the English celebrity chef, who gave Emerson, Lake & Palmer a mention from Bologna on his very interesting programme: Rick Stein's Long Weekends. People in the UK can watch the episode on the BBC web site. I realise that many of you have commented about if there is going to be a tribute show to Keith in the UK. 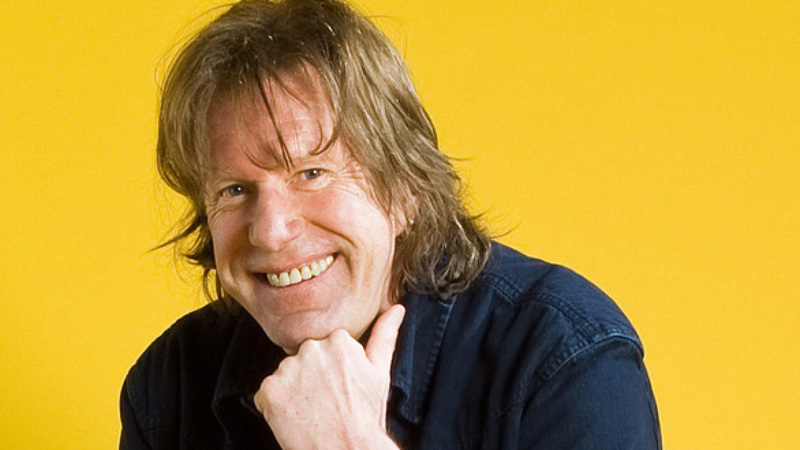 I want you to know that I have started working on a show for Keith Emerson here in the UK. I do not have any dates as we speak but it is something I really want to do and I am hoping it will be this year. My US tour has taken up such a lot of time and the show for Keith in Miami, Florida is coming along fine. Because I had no venues booked for this year in the UK, it's proving hard to find a suitable venue, but we are looking and some very important people are helping me. So stay with me on this one. I will be doing something for Keith that's for sure. Legendary Genesis guitarist and solo artists Steve Hackett and Vanilla Fudge keyboardist and vocalist Mark Stein will both join Carl and his band for the tribute show in Miami. "I am honored and grateful that these two iconic musicians have agreed to appear at this special tribute to Keith," says Palmer. 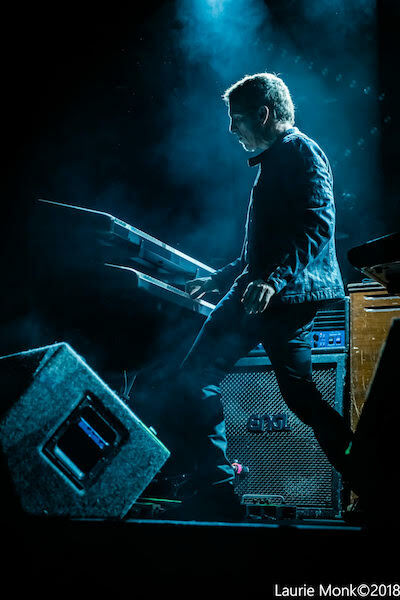 "I have been working as an instrumental act since 2001, so this will be different and exciting to have Mark Stein on keyboards and vocals and Steve Hackett on guitar for some of songs." Also added will be The IDA Program Children's Choir (led by Liz Quin) who will contribute on the ELP hymn classic, "Jerusalem." 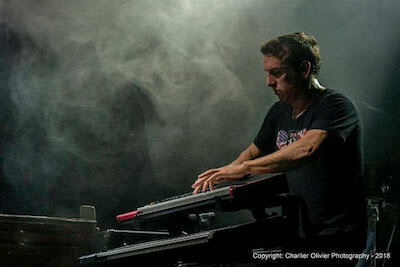 Acclaimed producer and musician David Frangioni, will also be a special guest during the show. will be deeply missed by all of us. I will always think about all the good time we had together and all the great ideas he always had. A great musician. A great singer. Just so much talent. He wrote some great songs and I do mean great songs. 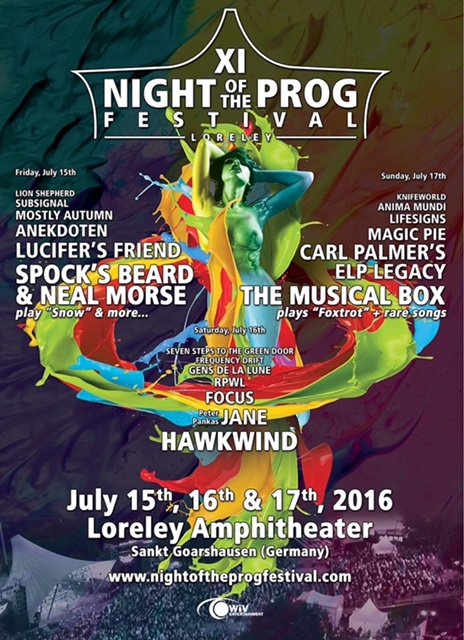 Carl Palmer's ELP Legacy will be appearing at the Night of the Prog Festival 2016, 17 July 2016 in Sankt Goarhausen, Germany. The festival is held at the Loreley Amphitheater: a UNESCO World Heritage site. On the hill of the River Rhine, it is located between Frankfurt and Cologne in Germany. 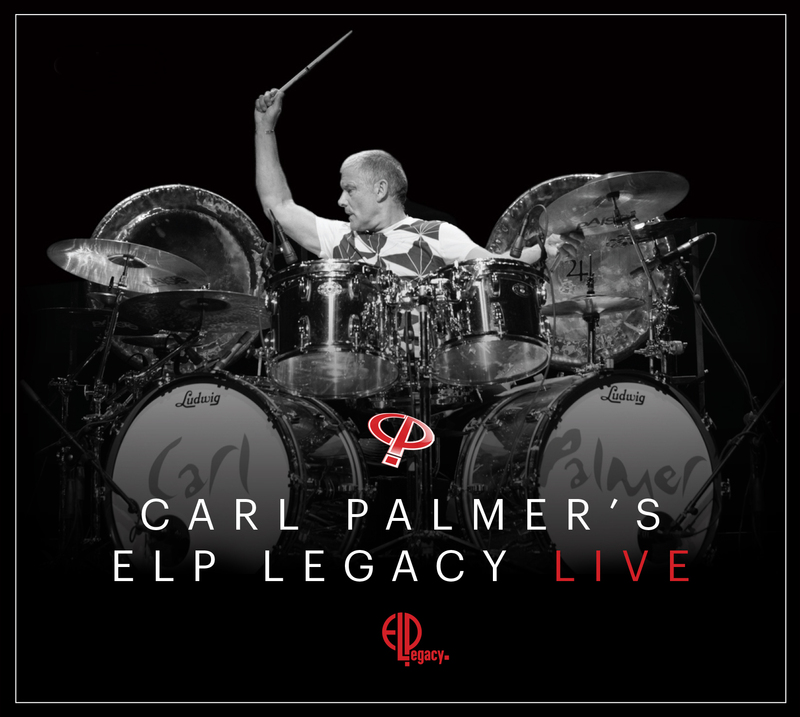 Carl Palmer's ELP Legacy partners with PledgeMusic.com to bring exciting VIP packages and enhanced products directly to fans. Be a part of the June 24th event. See the packages here. 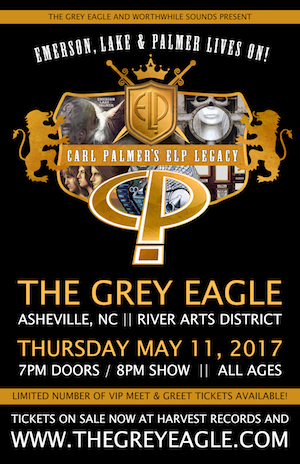 Carl Palmer's ELP Legacy Announces 9th Tour of North America. "Remembering Keith and the Music of EMERSON LAKE & PALMER." Exciting show features the instrumental rock classics of EMERSON LAKE & PALMER, in final leg of world tour. 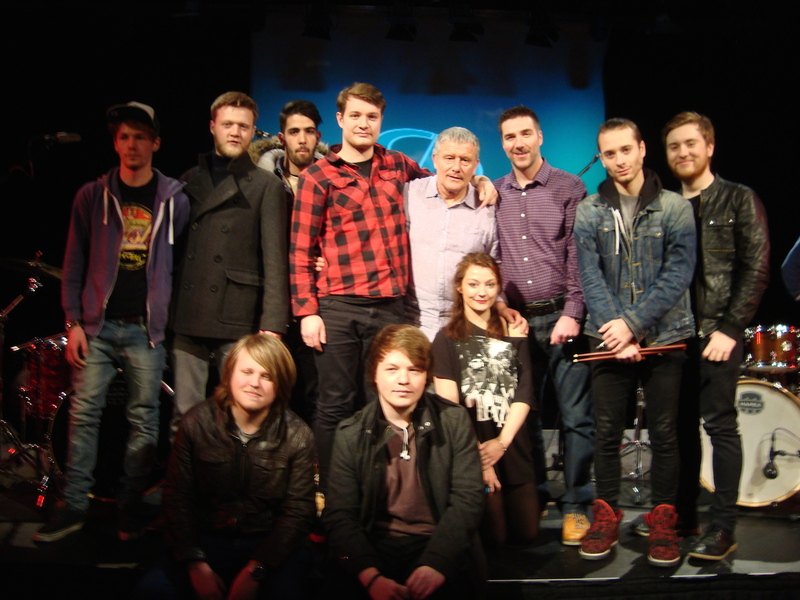 Solent University: "Drum clinic's a hit with music students"
"Renowned drummer Carl Palmer visited Solent this February to deliver a drum clinic which proved to be a big hit with the University's student musicians. [...]"
Read the whole story on the Solent University Music and Performance blog. See more of Carl's awards on the Awards page. A great man is no longer with us. My condolences go out to the Wogan family. Terry always made me laugh. One of the all time great presenters on TV and Radio. Terry's work for charity was on the highest level. A National Treasure! 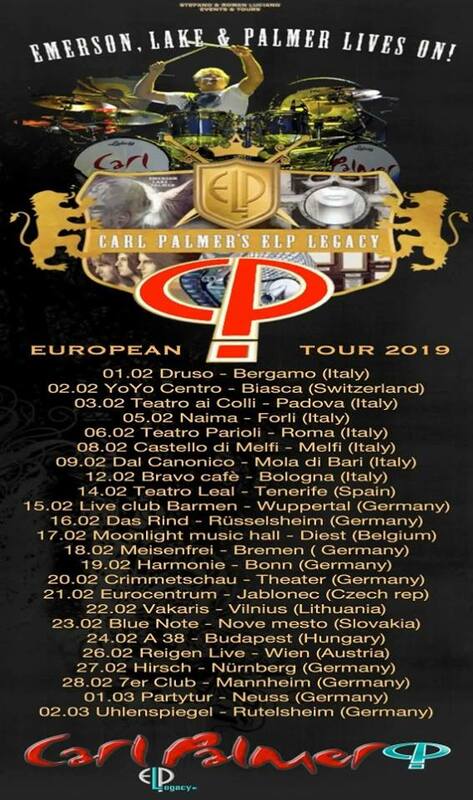 Just announced some initial dates of the Carl Palmer's ELP Legacy European tour. So far, shows are booked in Austria, Germany, Hungary, Italy, and Portugal. More dates should be announced soon. See all the dates on the Tour Dates page! The «Vir2osity» 20" Duo Ride executes Carl's exclusive ideas for a variable ride cymbal with distinct playing zones. In general, this heavy cymbal features a fairly raw, earthy, complex wash that’s very tight and controlled. The overall glassy stick sound tends towards a drier, more raw and wooden note in the un-lathed zone, while the lathed zone presents a livelier, crisper and richer ping. The bell is well separated and decidedly loud and piercing. 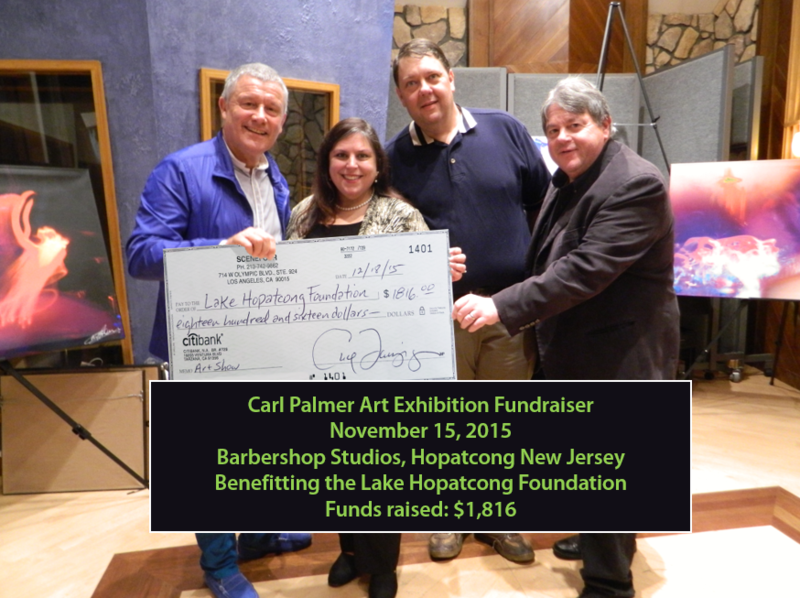 Carl Palmer's Art Of Giving continues. 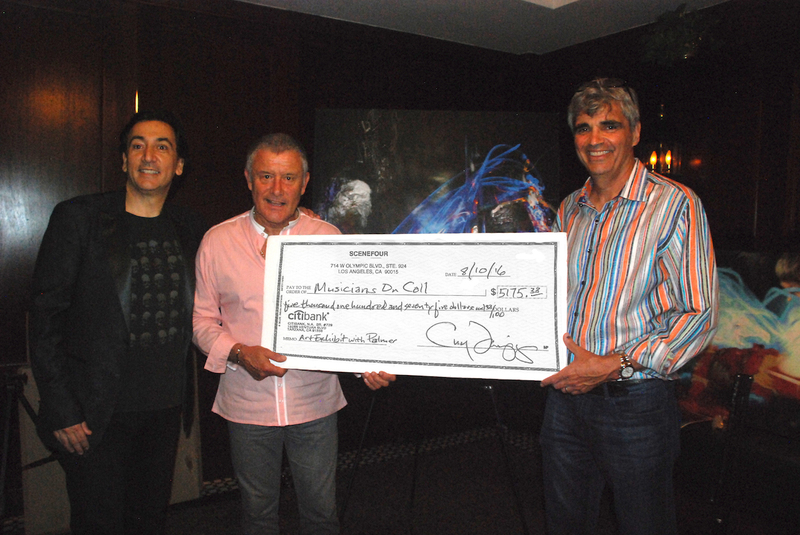 Here, Carl Palmer hands over another check to Hope Reins of Raleigh, a charitable organization that places rescued horses with emotionally disturbed children in the Raleigh, NC area. 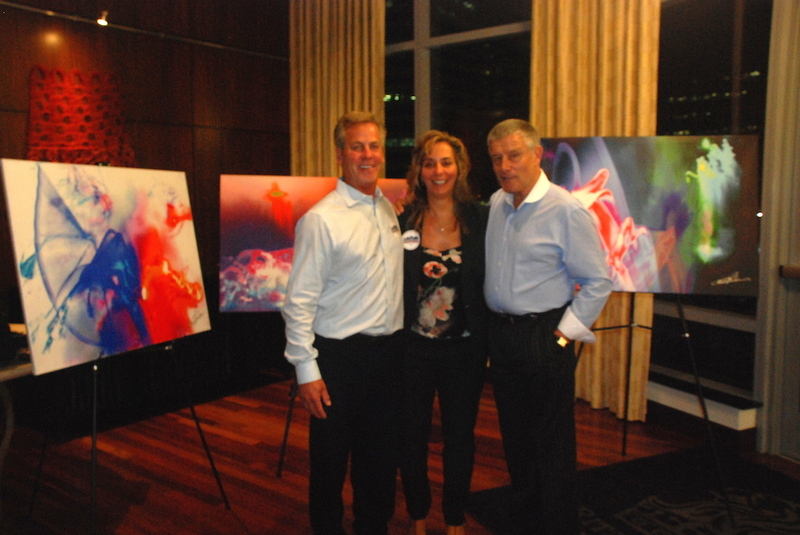 The charity was the recipient of funds raised in a private art event featuring the artwork of Carl Palmer hosted by the Hill family. Pictured here L to R: Steve Hill, Susan Clemmer of Hope Reins of Raleigh, Valerie Hill, and Carl Palmer. I am deeply saddened to hear about the death of David Bowie. He was a stand alone guy, completely original in every way. 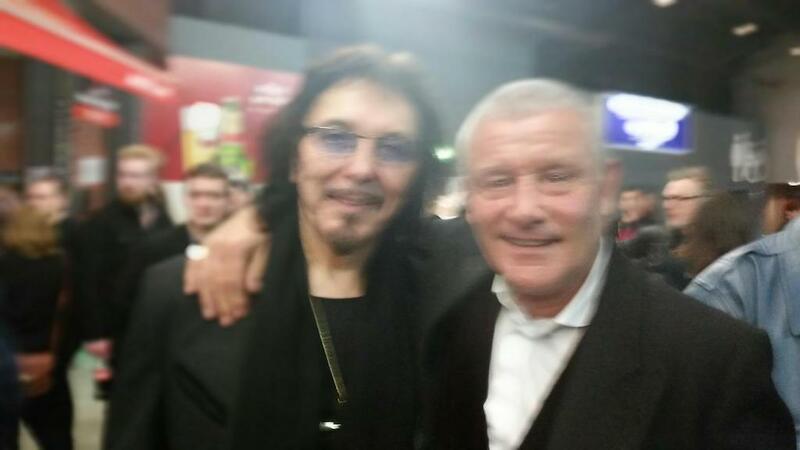 Great person, I only met him once in my career when I was fourteen when I was playing in the King Bees. David also was in a band many years ago called The KING BEES . 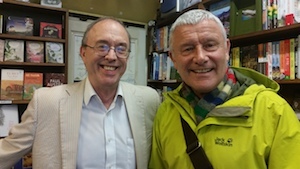 He introduced himself to me when I was still living in Birmingham. We were both playing at Mothers, a very good club in its day. 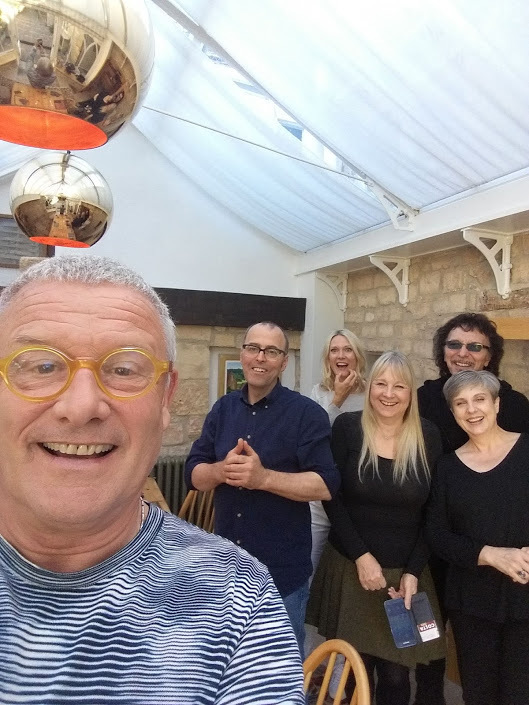 Carl attended the unveiling of the Cozy Powell Memorial Plaque today at the Corn Hall, Cirencester in the Cotswolds in England. 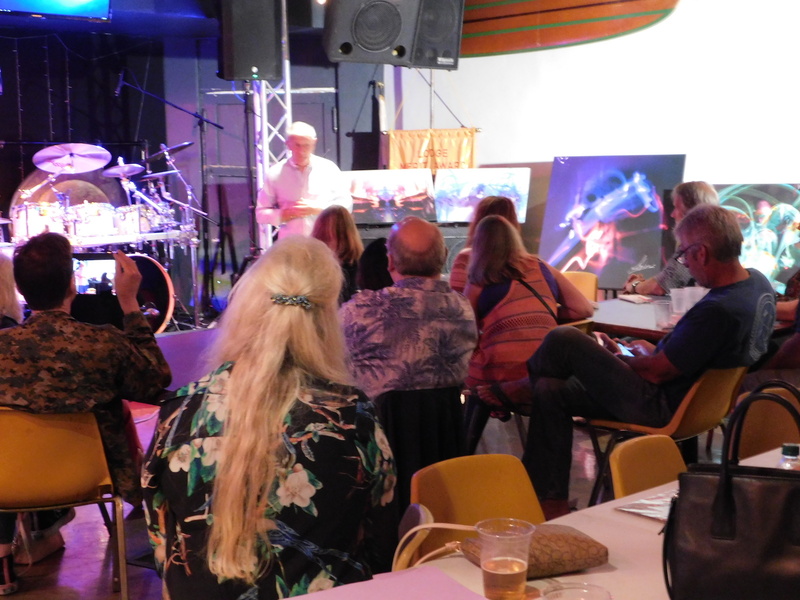 The event was very well attended by fellow musicians, family and friends of Cozy Powell, who was a much loved son of Cirencester. The large crowd blocked the Market Place in Cirencester to see Tony Iommi and Brian May unveil the plaque after a short speech by the Mayor of Cirencester and Brian and Tony. 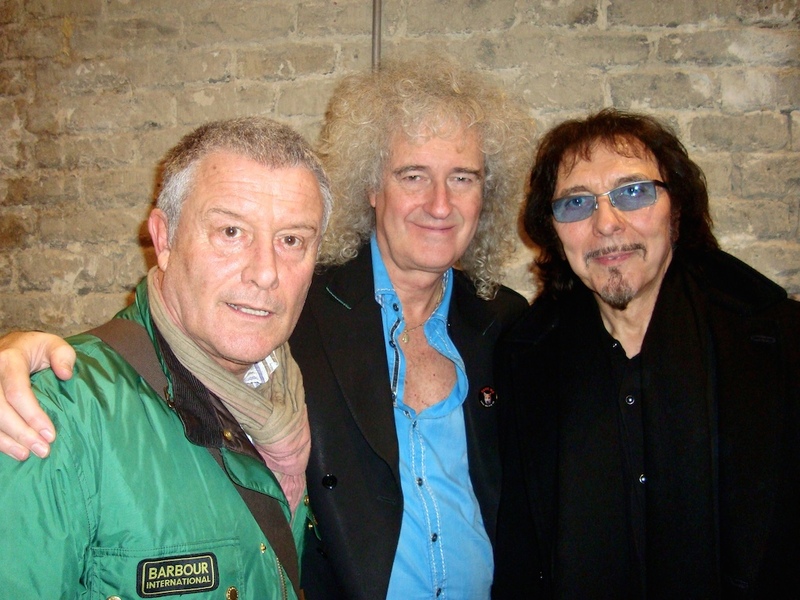 After the unveiling a reception was held inside the Corn Hall for guests and Carl, Brian May and Tony Iommi all made speeches celebrating the life and music of Cozy Powell. It was a very happy occasion for many well known musicians, his family and friends to remember Cozy. He obviously was very highly thought of and much loved by all. 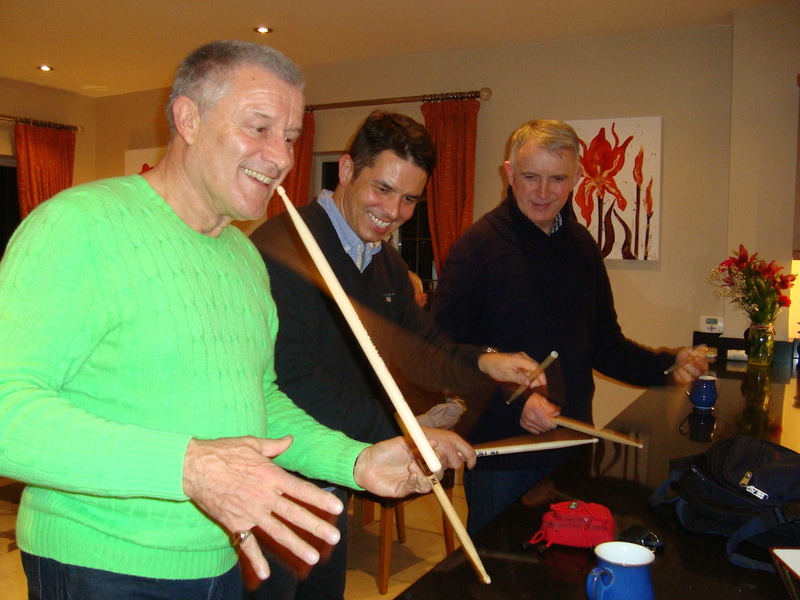 I thought you might like to see the 3 Palmers, all drummers, practising over the holiday. With me is Steve, my brother and Ian, my nephew. 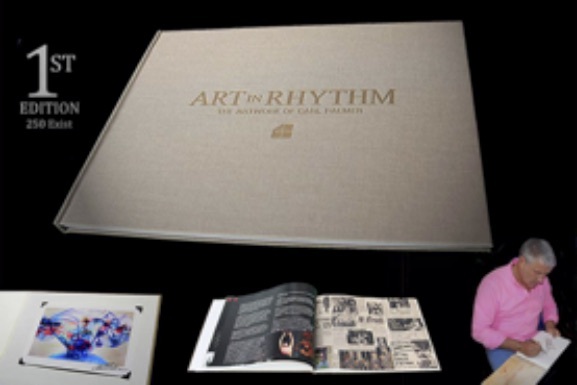 Art In Rhythm, the acclaimed new hardcover book which features images of, and text about, Carl Palmer's two art collections, A Twist Of The Wrist and The Rhythm of Light, has sold out of its initial edition of 250. Released in mid October of this year, the book was issued as a coffee-table companion to Palmer's unique blend of rhythm, art and modern photography, which he developed with the Los Angeles-based art company, Scene Four. 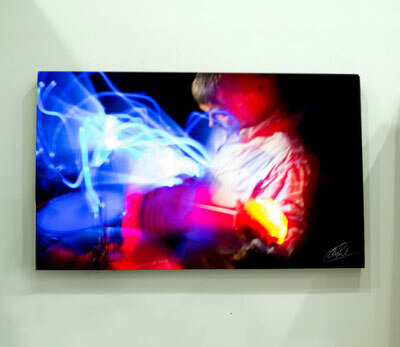 The collections feature images created while Palmer played the drums using LED-lit drumsticks. [...] Besides creating inspired rhythms for Emerson Lake & Palmer, he provided the beats for Asia, Atomic Rooster and The Crazy World of Arthur Brown. 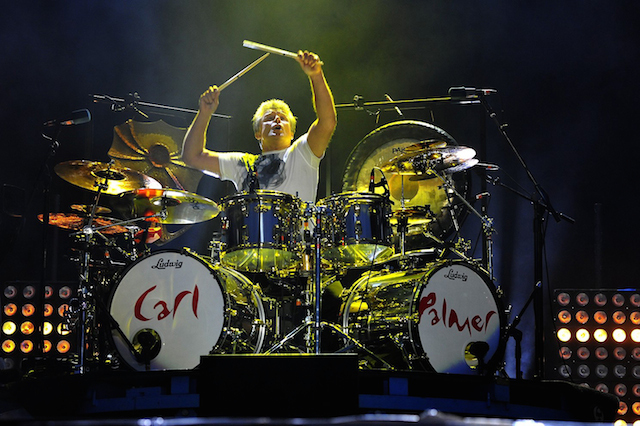 It's no wonder that Rolling Stone magazine named Carl Palmer one of the 10 Greatest Drummers of All Time. 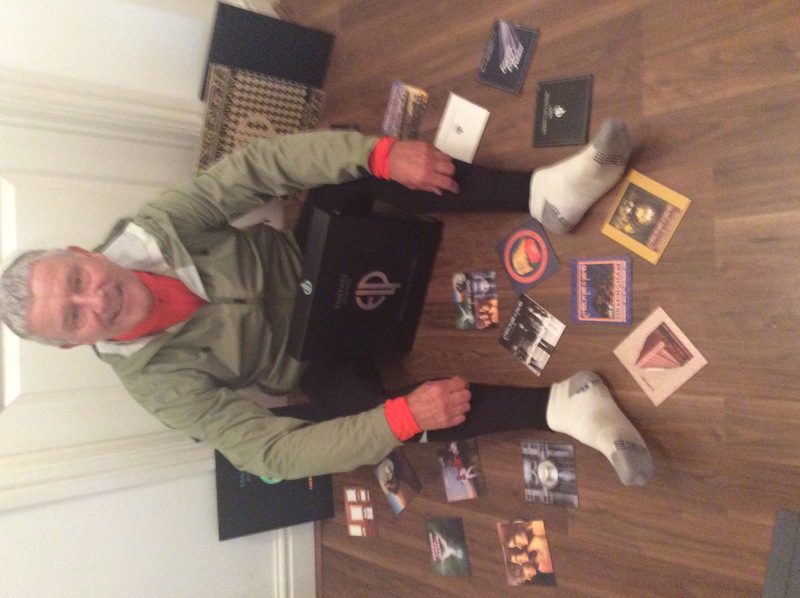 Carl Palmer's ELP Legacy Sizzles with A Progressive Display of Artistry! This Tuesday night (Dec. 1st) in Los Angeles! 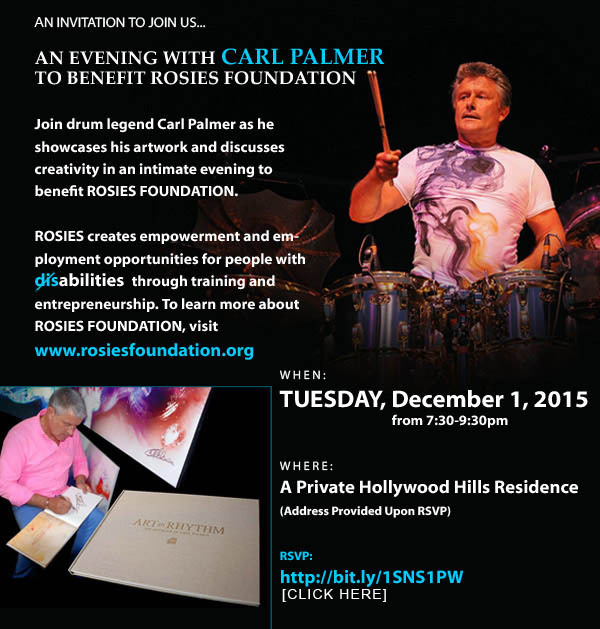 Join Carl Palmer as he showcases his artwork and discusses creativity in an incredibly personal evening to benefit ROSIES FOUNDATION. We'd love to see you there, and it helps an incredible organization. Get details and RSVP here! Saturday night's show in Cary, NC. Thanks to all the fans who are coming out to support Carl Palmer's ELP Legacy while we're on tour! 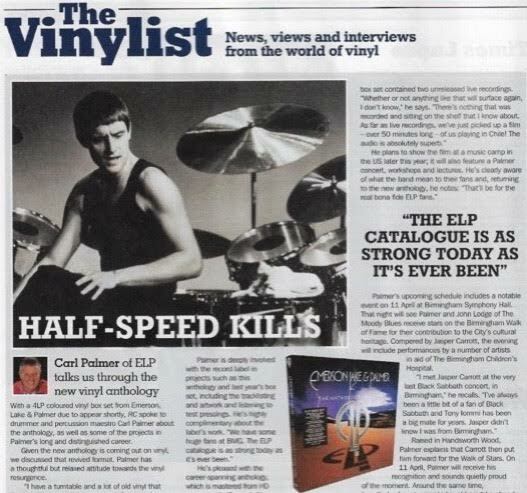 Carl Palmer with Emerson, Lake & Palmer makes Rolling Stone's 50 Greatest Progressive Rock Albums of All Time! 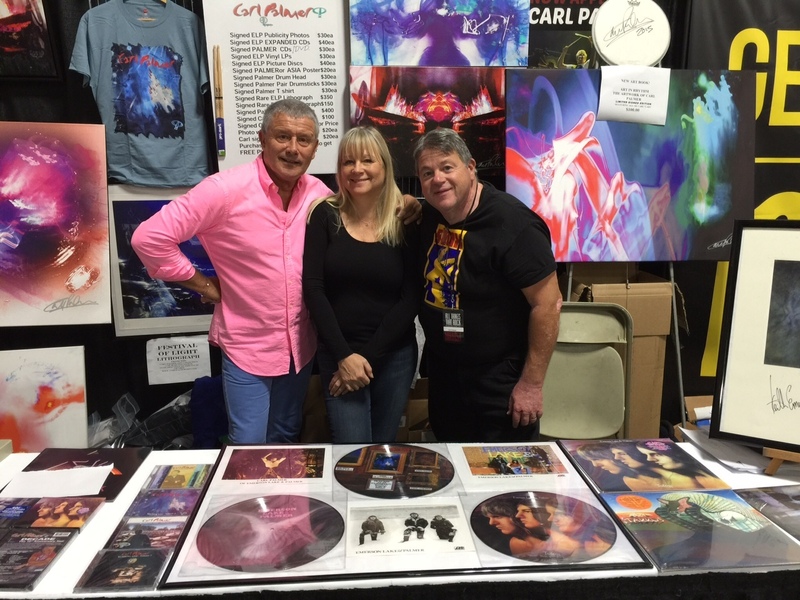 Carl, seen here with Katie and Bruce, as the All Things That Rock Festival begins. BACK IN THE NY GROOVE.... 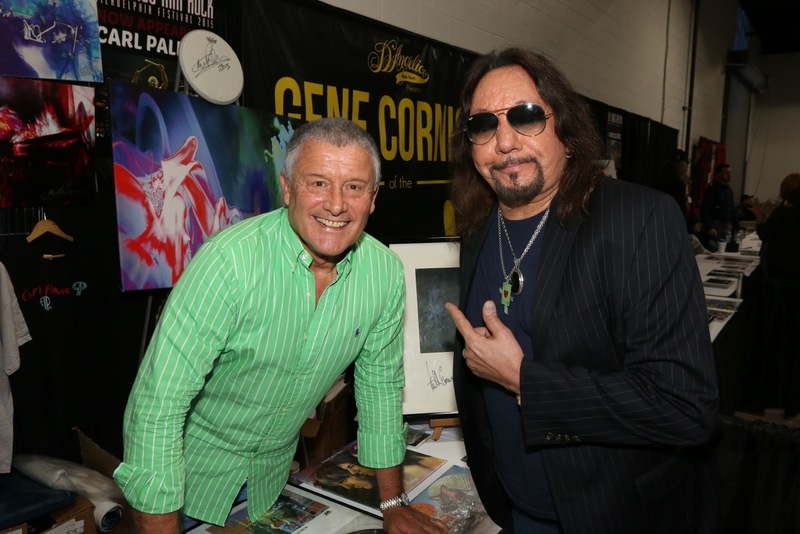 Kiss founding member and ex-guitarist Ace Frehley made it a point to stop by Carl Palmer's display at the ALL THINGS THAT ROCK FESTIVAL in Philadelphia to meet the legendary British drummer. 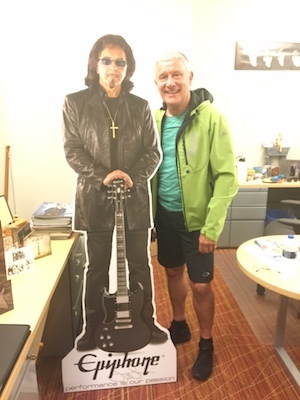 Ace remarked on how all the KISS members were big ELP fans. 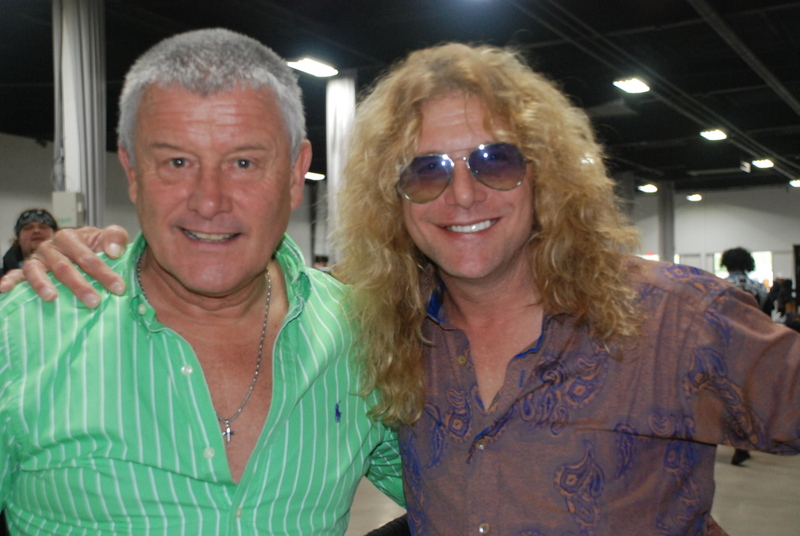 In addition, former Guns N Roses drummer Steven Adler came over to meet Carl. 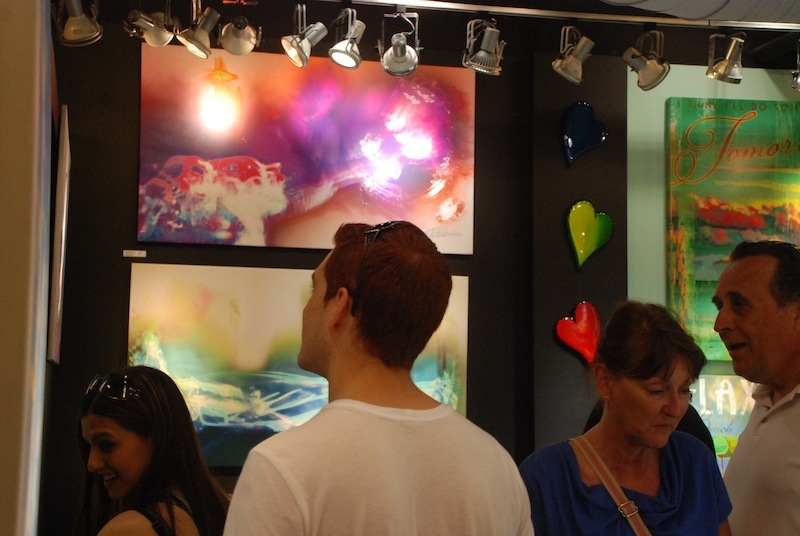 Adler, like Carl, has created his own collection of art with Scene 4 of Los Angeles. 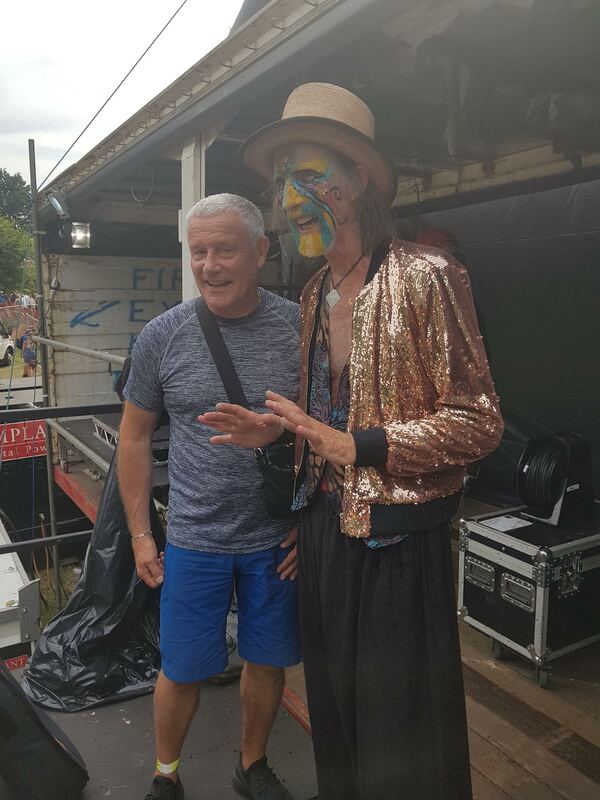 Carl Palmer (with help from manager Bruce Pilato) gets ready to meet the fans at the ALL THINGS THAT ROCK FESTIVAL in Philadelphia yesterday. The event ends Sunday Oct 4th until 5pm and also features Ace Frehley; Guns N Roses' Steven Adler; Gene Cornish of The Rascals; Lita Ford and many others. Carl hangs with pop metal Queen, Lita Ford, at The All Things That Rock Festival in Philadelphia. 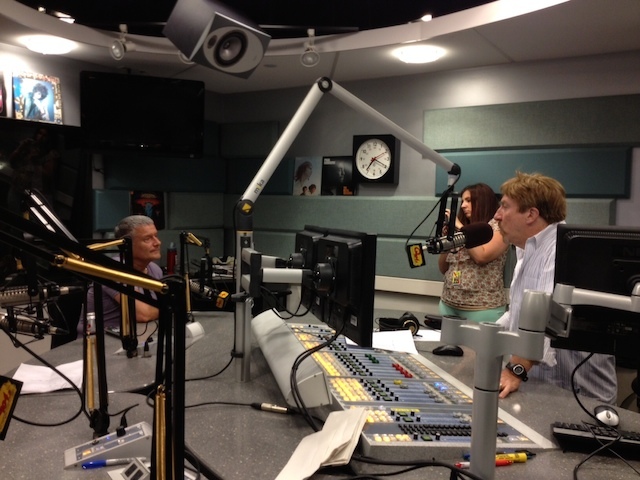 Had a great time speaking on WMGK's John DeBella show. See you at All Things That Rock (Oaks, PA) this weekend! 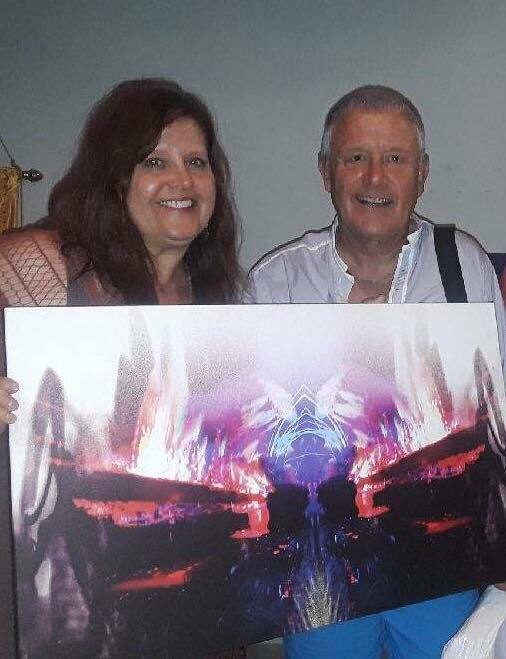 Carl Palmer will be at this exciting event discussing his artwork and signing Carl Palmer, ASIA and Emerson Lake & Palmer items. 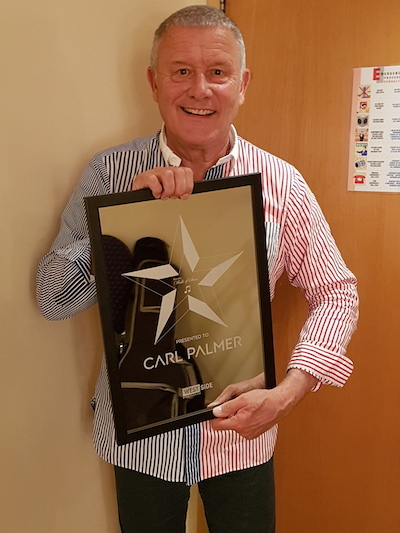 Among the items that can be purchased and signed by Carl will be: ELP and Palmer lithographs; Picture Discs; Vinyl Albums; Publicity photos; Carl Palmer Drums; Drum Heads; Drum sticks and much more! 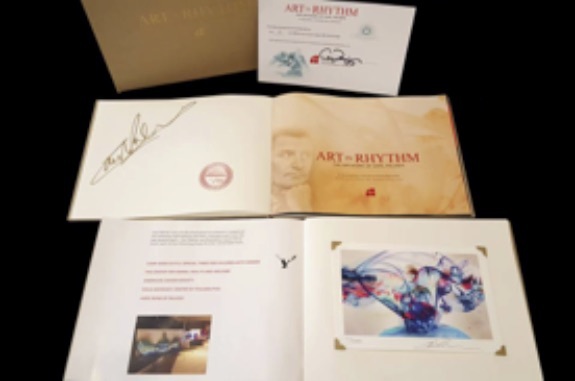 Carl Palmer is releasing a book on his artwork: Rhythm in Art. The first edition is super limited and each copy is signed. Sign up has begun at www.carlpalmerart.com to get more details! 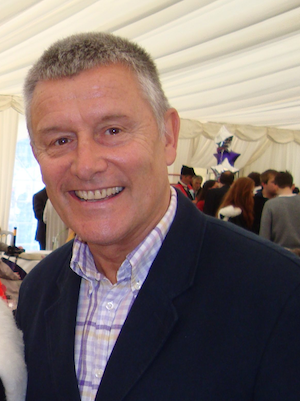 Carl Palmer among headline celebrities at All Things That Rock 2015! Carl Palmer to embark on US tour! Carl Palmer's ELP Legacy is returning to the United States for the final leg of THE 2015 Rhythm of Light Tour. The tour returns to the US with fifteen shows between November 12th and December 6th. Check out the Tour Dates. Recently Carl and Scene 4 Art of Los Angeles, held three art events to raise money for charities he supports. 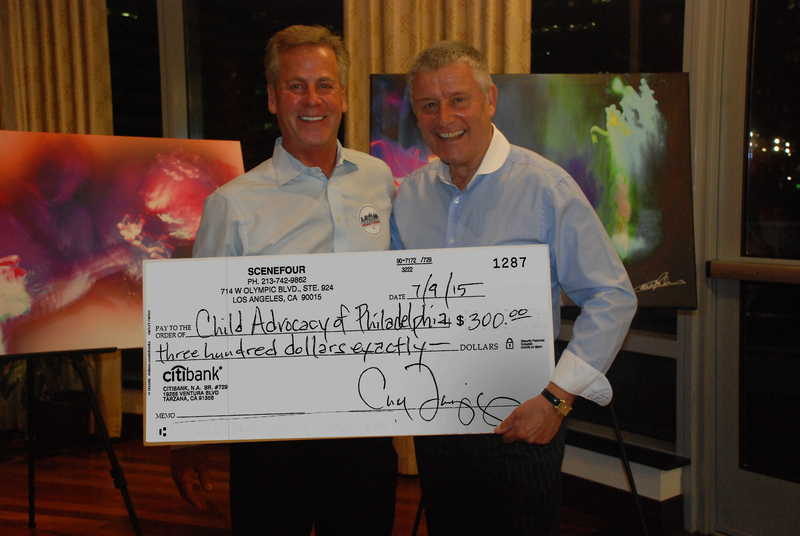 A portion of all the sales of Carl's art at these events were given to the following charities: Camp Good Days & Special Times, providing summer camps for children with cancer; The American Cancer Society; and The Child Advocacy Center Of Bucks County (PA). 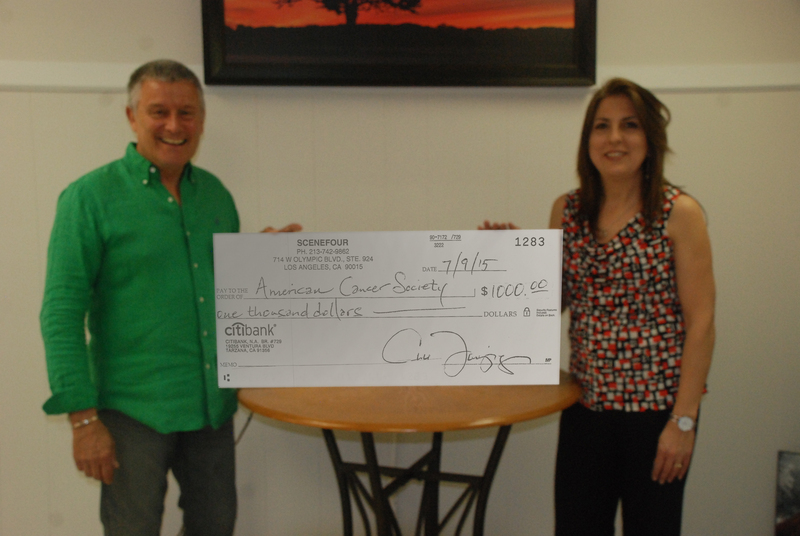 Debbie Rice of Friendship Framing in Bath, PA, accepts check from Carl Palmer on behalf of the American Cancer Society. 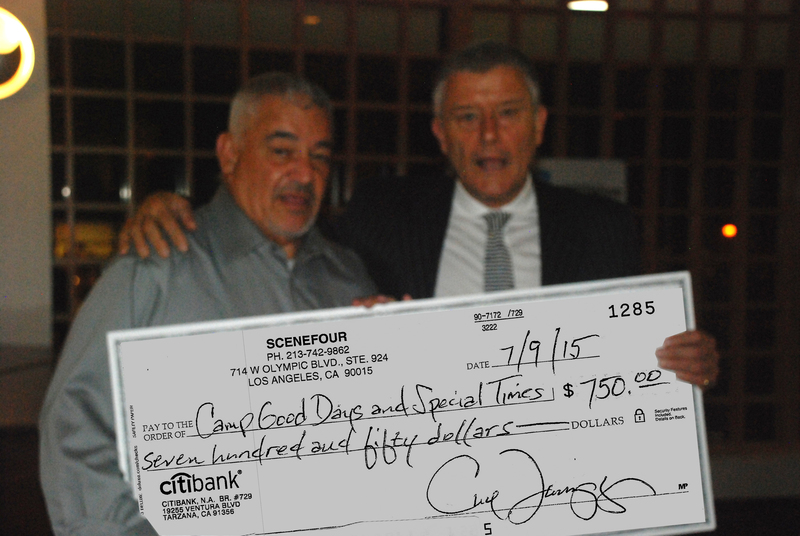 Gary Mervis CEO of Camp Good Days & Special Times receives check from Carl Palmer. 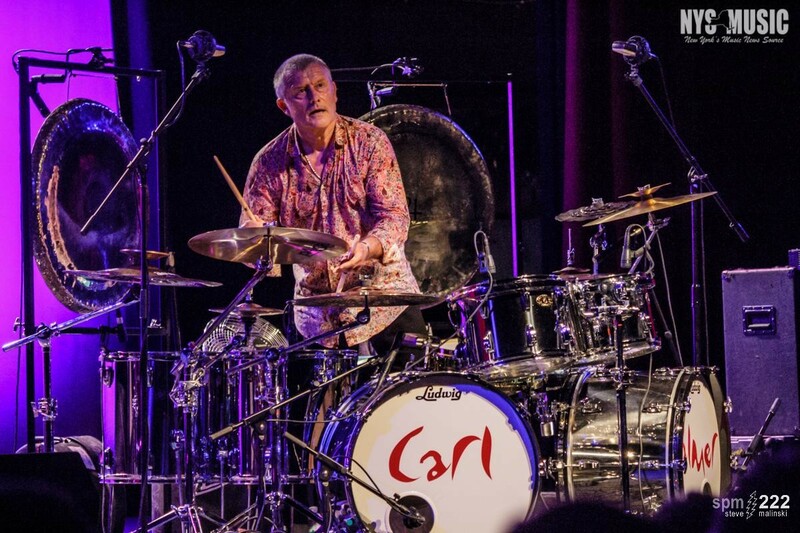 Carl Palmer will be at the All Things That Rock event on both days. 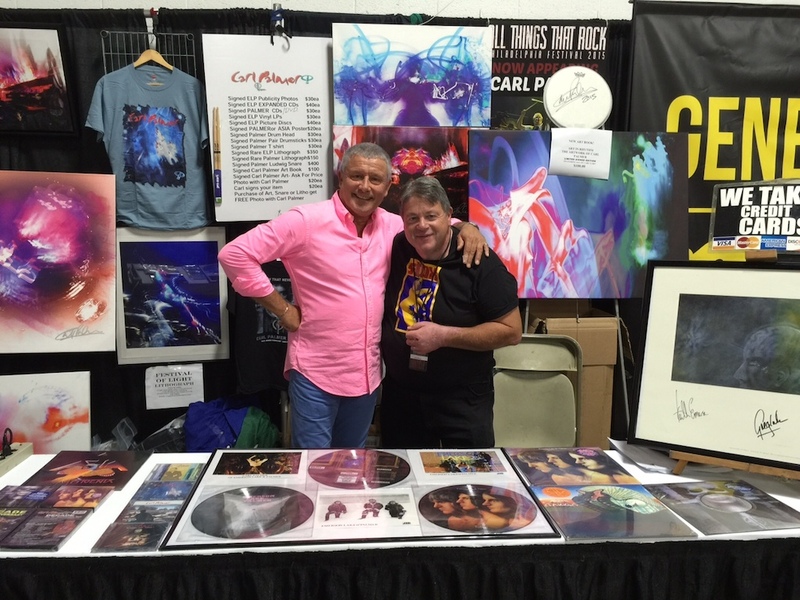 There are planned meet and greets, autograph sessions, and a display of Carl's art work - along with hundred's of America's top Rock-and-Roll collectible vendors. The tour returns to the US with six shows in North Carolina, Pennsylvania, Maryland, Tennessee, and Florida between June 20th and 29th in addition to 2 festival dates in Europe! Check out the Tour Dates. 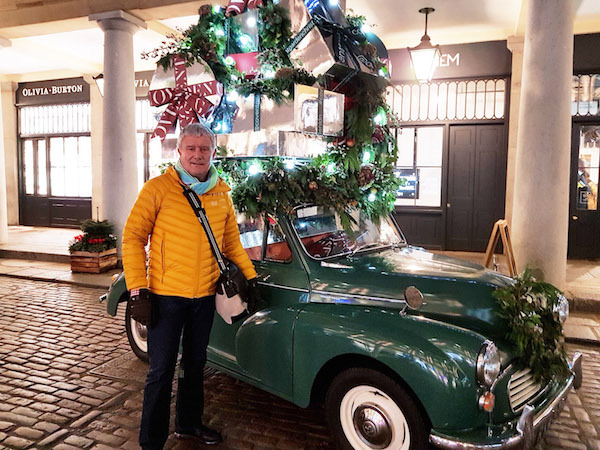 Famed British Musician Hosts Successful Art Events to Benefit Camp Good Days & Special Times; The American Cancer Society and The Child AdvocacyCenter of Philadelphia. 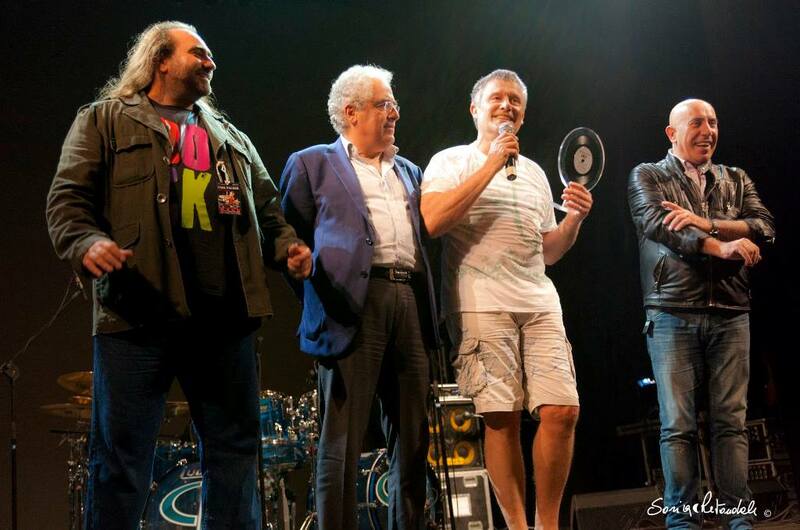 Emerson, Lake & Palmer have been inducted into the Goldmine Magazine Hall of Fame. 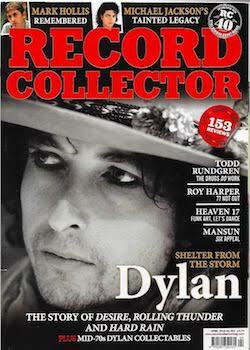 Goldmine which began publishing in 1974, is one of the music industry's most respected publications. 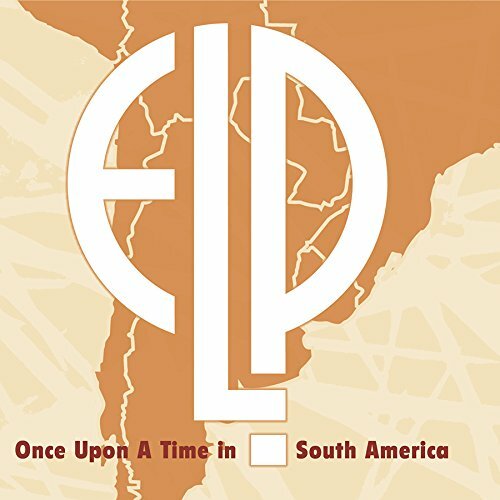 Rockbeat Records has just released Once Upon a Time Live in South America, a 4 CD set Culled from ELP concerts in Chile, Brazil and Argentina in 1993 and 1997. Full track lists can be found at Amazon.com. New video! Newly discovered video of Carl Palmer playing "Fire" with the Crazy World of Arthur Brown. 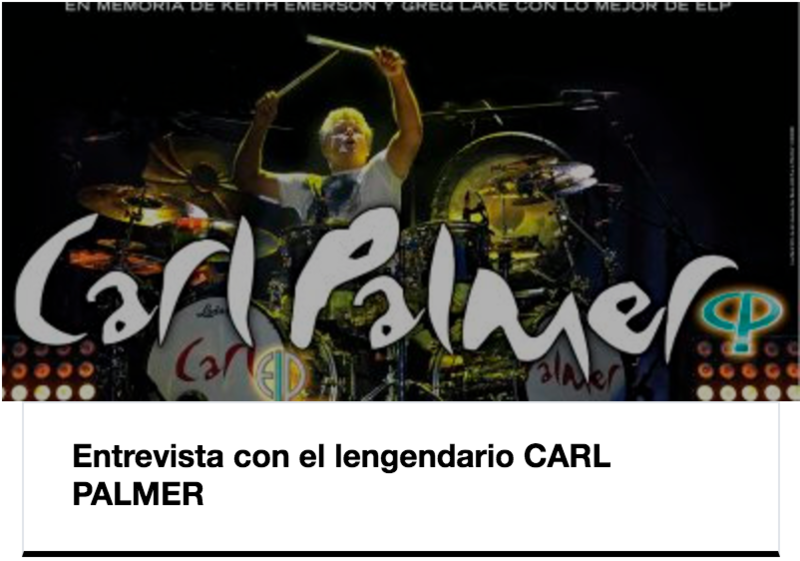 Available on the Official Carl Palmer YouTube Channel and on this site's Video Gallery. Carl Palmer's ELP Legacy 2015 European Tour is under way! 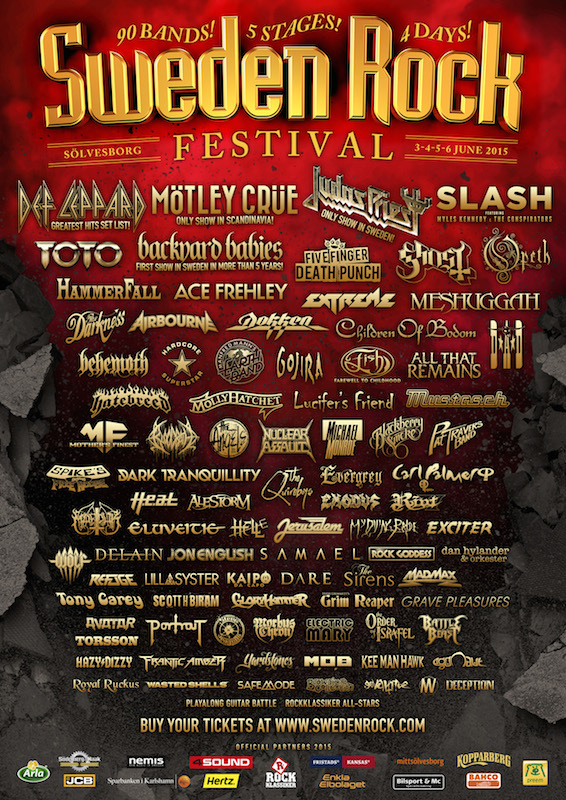 Sweden Rock Festival: Carl Palmer's ELP Legacy will be performing 04 June 2015 at the 2015 Sweden Rock Festival in Sölvesborg, Sweden. "I would like to thank everyone for their support on my UK tour. I had a great time as always working with Paul and Simon. I hope there was not too much inconvenience caused by the cancellations which I know you have all heard before but this was genuinely out of our control. 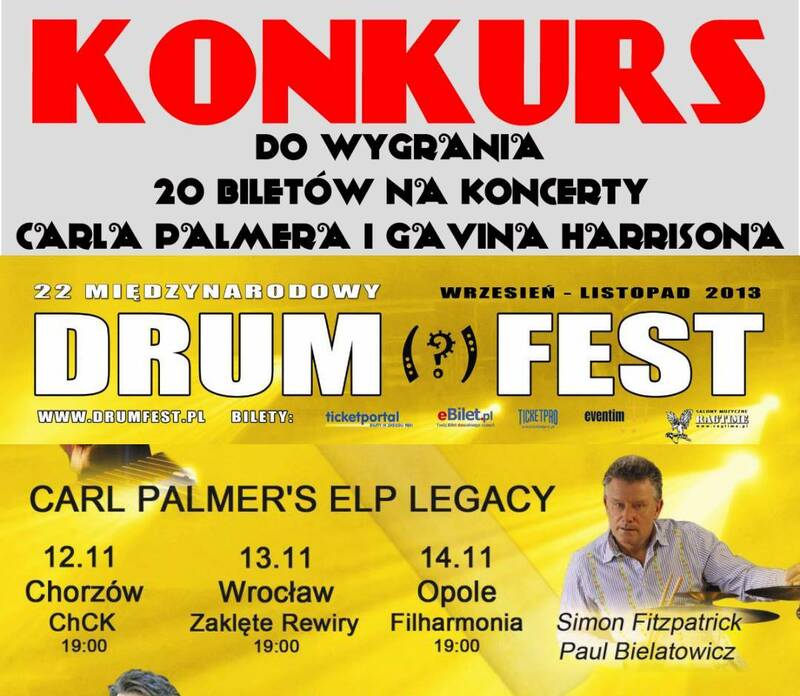 The Carl Palmer ELP Legacy will be playing at the Krush Fest on the 16th October in Great Yarmouth. I look forward to seeing you there! Once again a big thank you to you all." Just about to kick off my February and March UK tour! 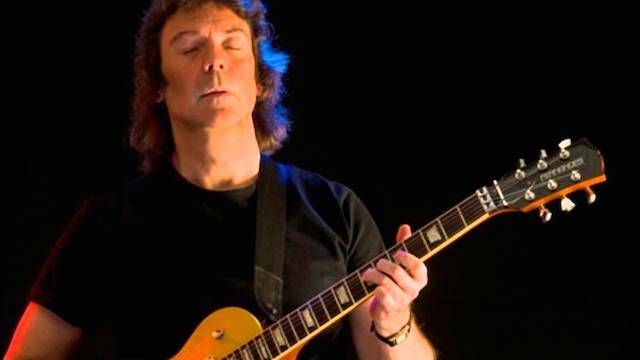 In addition to playing with Paul and Simon as Carl Palmer's ELP Legacy, each stop on the tour features Martin Turner (playing the music of Wishbone Ash) and The Strawbs. It all starts on Thursday (19 Feb) in Cheltenham and continues through to Wolverhampton (15 March). 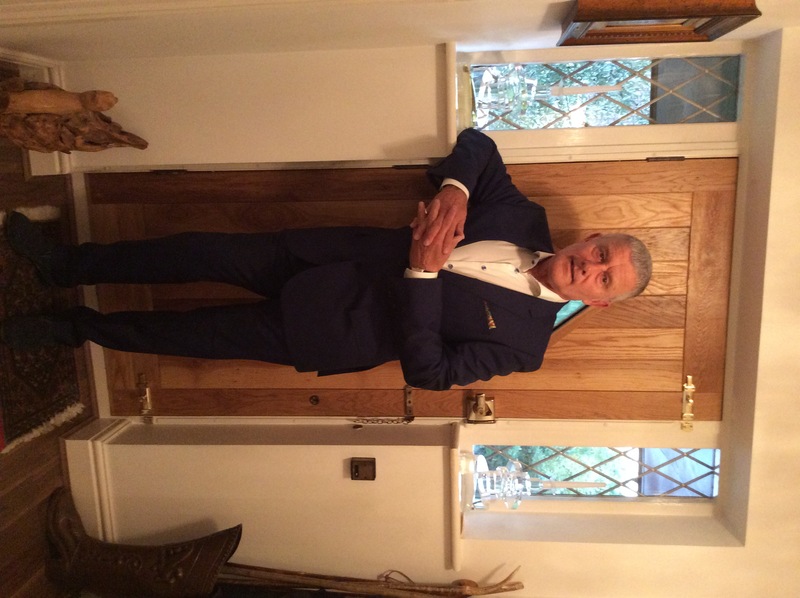 Wishing all my fans and followers, management and crew a very happy, healthy and successful 2015. Looking forward to seeing you all again during the year. Starting off in Oslo on February 10th and then followed with a UK tour. Look out for details of tour dates and art events on my website, Facebook, and Twitter pages. 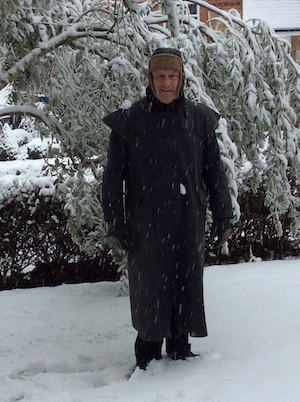 I just wanted to say a big "thank you" to all of you who came along to our concerts in the USA and Canada recently. Your support and enthusiasm was tremendous and Paul, Simon and myself had a great time playing to you. We enjoyed meeting you all and of course some of you we have seen regularly over the years and it’s always great to see you. It was a great opportunity to show my art collection and we had an excellent response. Thank you to all the people who helped to make this a success. I would like to thank all of the management and the crew, who helped to make this tour a success, for all their hard work and endless energy. So many thanks to Bruce, Harry, Jon and Josh, Tony, John Arnold and of course Lori, Bruce&apos;s wife. We will be back again in the USA in 2015 so keep a look out for concert dates and also details of art events as well. In the meantime the band will be starting the new year playing in Oslo, followed by a 19 date tour of the UK and the dates are already on the website and Facebook page. 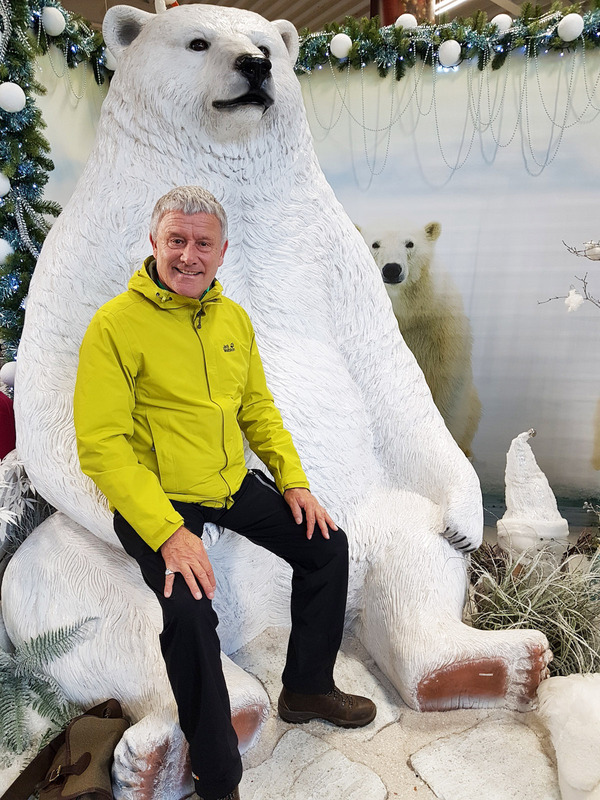 So as I prepare to leave the US for home today I would like to wish you all a Very Merry Christmas and all the best for a Healthy and Successful New Year! Look forward to seeing you sometime in 2015! 2015 Tour dates for February and March! 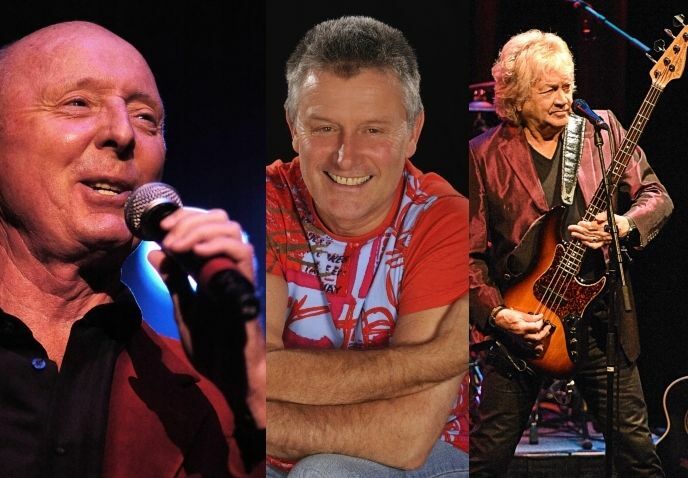 Pleased to announce the February and March 2015 tour dates for the Classic Legends of Rock & Folk 'Super Tour' 2015 featuring Carl Palmer's ELP Legacy along with Martin Turner & The Strawbs. See the tour dates for UK Coast to Coast February/March 2015 starting February 19 in Cheltenham and ending March 15 in Wolverhapton. It's Back... The 12 Days of Palmer Christmas! Sing this Christmas Carol with your friends and soak up the savings! 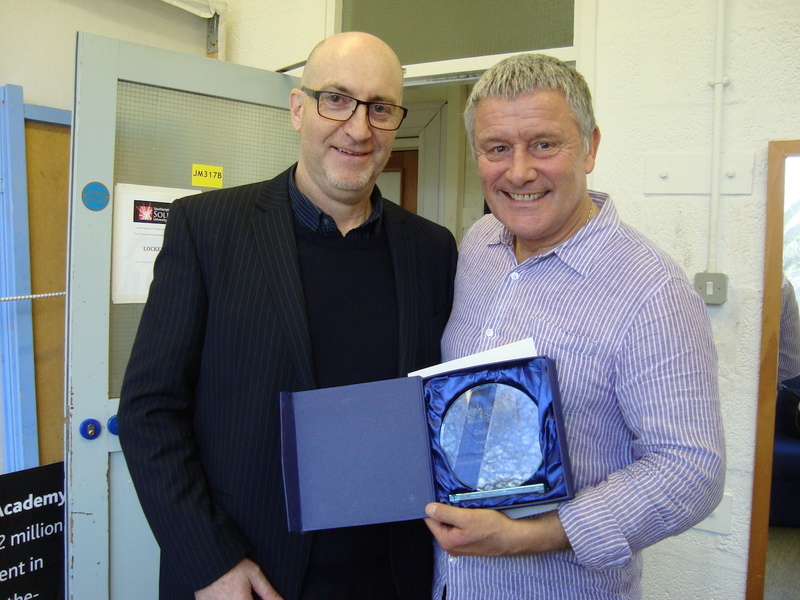 British musician Carl Palmer (ELP/ASIA) presents a check to Gary Mervis, President and Founder of CAMP GOOD DAYS & SPECIAL TIMES which provides summer camp activities for children stricken with cancer. 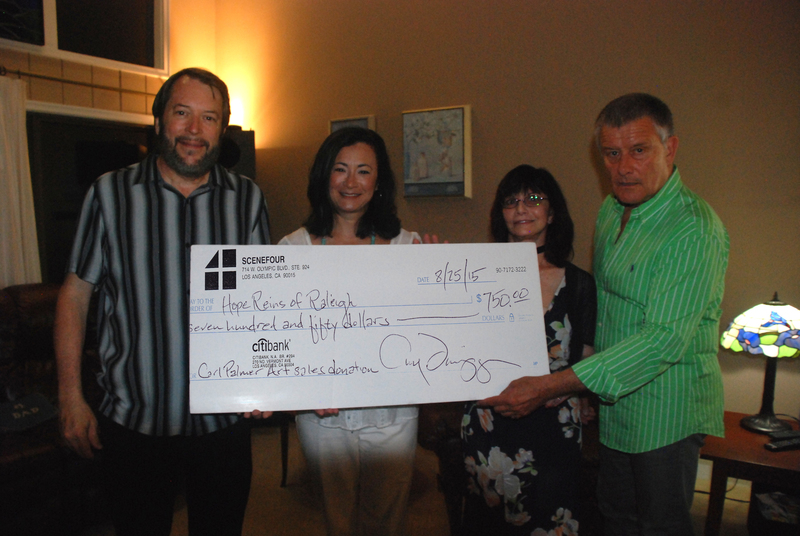 The check represented a portion of the proceeds from the sale of Palmer's RHYTHM OF LIGHT art collection created with Scene 4, and sold at a special gallery event held at the home of attorney Robert Brenna and his wife, Judy. 19 Shows Announced in the US and Canada for November. New shows added in Vermont, Rhode Island, and Massachusetts! See all of Carl's tour dates! ASIA tour of North America and the UK starts September 11! 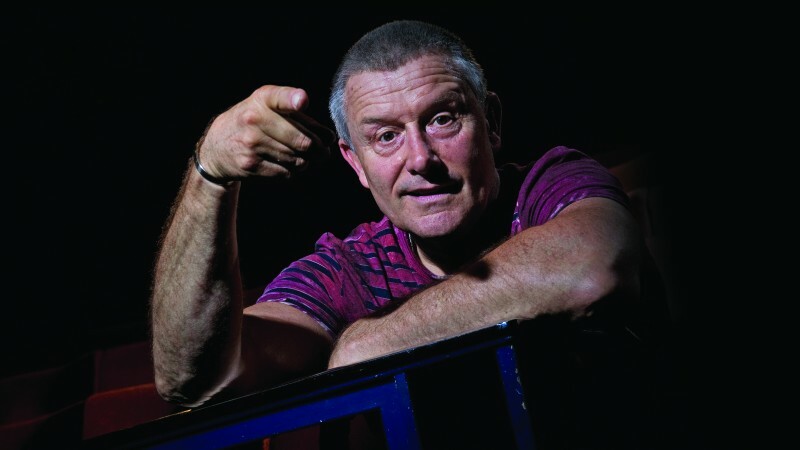 Starting Sept. 11 in the US and continuing until Nov. 2 in London, Carl Palmer will be performing with ASIA! 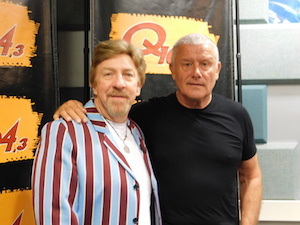 Carl Palmer has done an interview with Ken Dashow at Q104.3 FM in New York. It will air on Friday, July 11th on Ken's show. 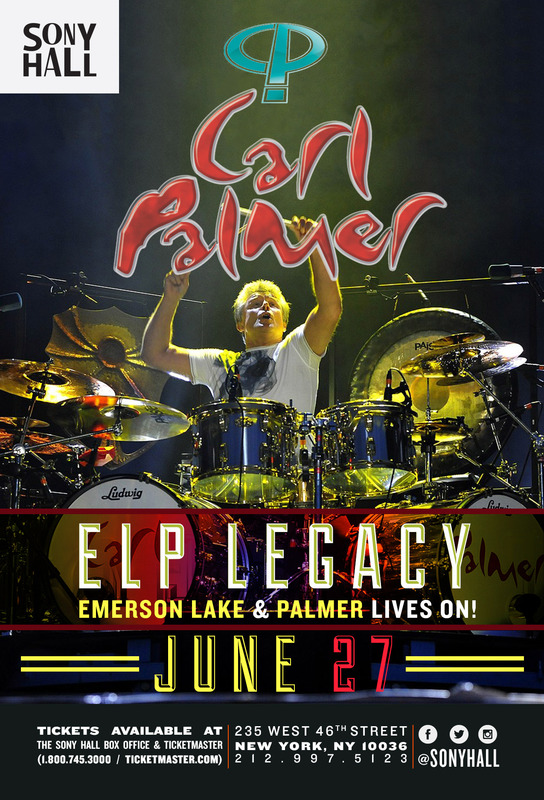 Carl Palmer's ELP Legacy Returns with the RHYTHM OF LIGHT TOUR 2014 – 4 shows in Northeast US for July and an Extensive North American Tour in November. 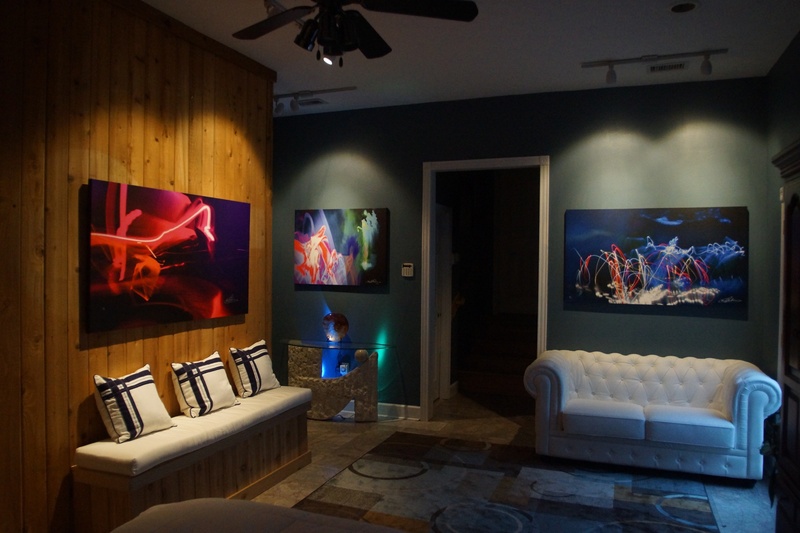 Carl and Katie with the new "Rhythm of Light" art collection. New selections in the Carl Palmer Gift Shop! New products include the new Decade DVD; Carl Palmer 2 CD Anthology (updated with new tracks); signed posters and drum heads; and the new 2014 ELP LEGACY T shirt. Carl Palmer's new Rhythm of Light art exhibit premieres at Miami's Effusion Gallery. Carl unveiled his new art collection, done in collaboration with Los Angeles Art company, Scene 4. Carl greeted fans and signed his original art pieces at the trendy SOBE art gallery from 7pm to 11pm on Friday March 28th. A splendid time was had by all. "[...] In a field known for vibrant characters, Carl Palmer may be the most colorful drummer of them all. 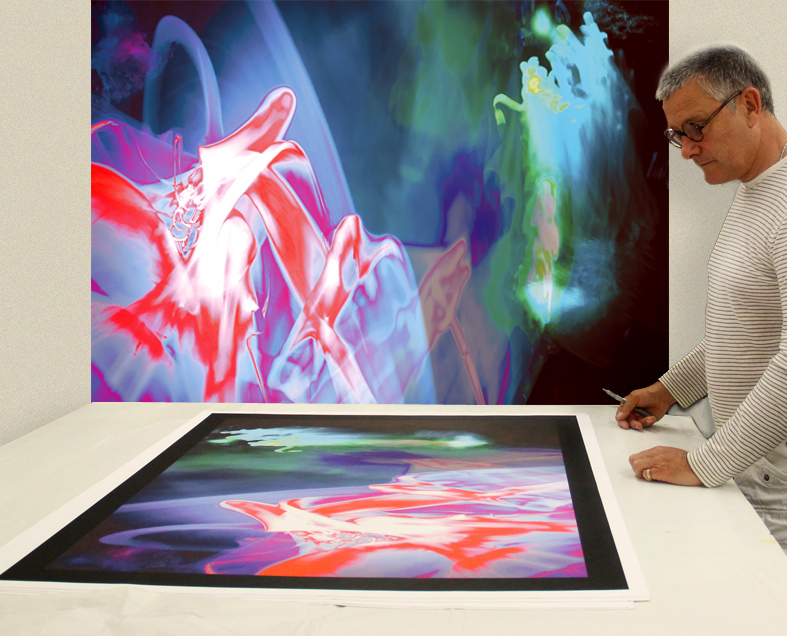 A founding member of '70s progressive rock band Emerson, Lake & Palmer and '80s rock supergroup Asia, the Birmingham, England-born Palmer will premiere his new art collection, Rhythm of Light, at Miami Beach's Effusion Art Gallery. 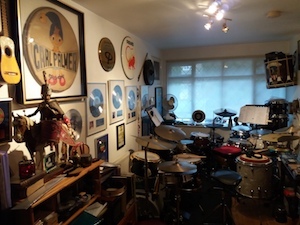 The 16 images in the exhibit were created using a photographic process in which Palmer plays his drums in a pitch black, 12-square-foot room, using custom LED florescent drum sticks. 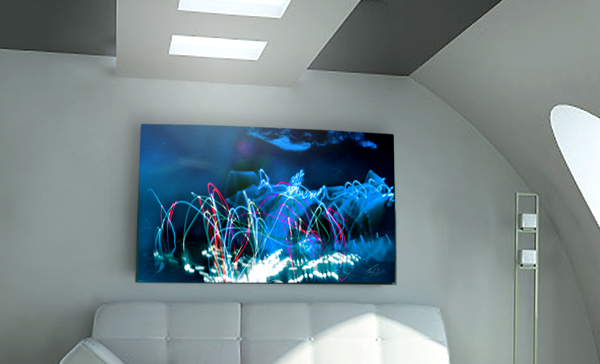 As stick hits drum or cymbal, a burst of light forms a pattern, and the visual images are captured on canvas. [...]" Read the entire article here. "Do Ya Wanna Play, Carl? is a two CD compilation of music by legendary rock drummer that was originally released only in the UK in 2001. The new expanded version contains additional tracks. Do Ya Wanna Play, Carl? spans several decades and various musical genres. Disc 1 focuses on the symphonic side of Carl Palmer, with the extensive 'Concerto for Percussion' by Carl Palmer and Joseph Horowitz. The rest of the disc features a selection of Emerson Lake and Palmer (ELP) cuts from the Works album. 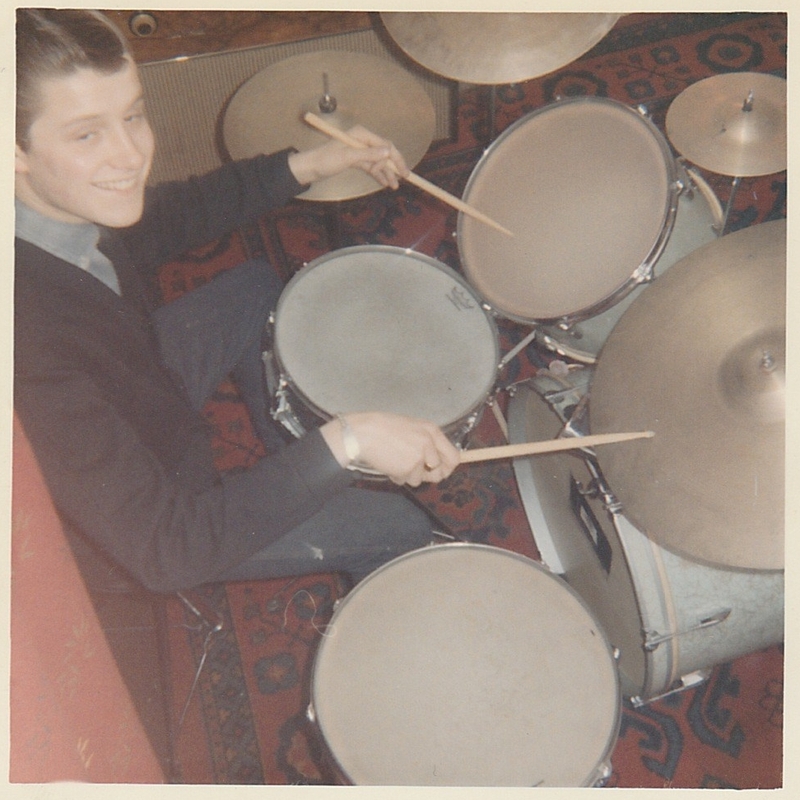 Carl Palmer gets to show his admirable skill as a world class drummer in the pieces selected. [...]" Read the entire article here. 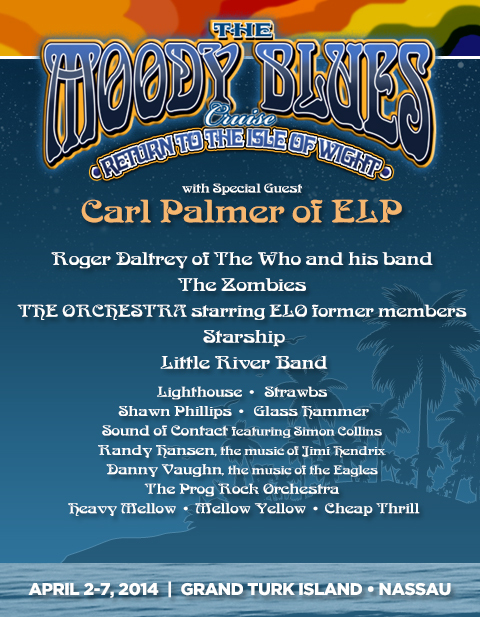 Concert Review: Carl Palmer's ELP Legacy @ Poole Lighthouse, 27th February, 2014. 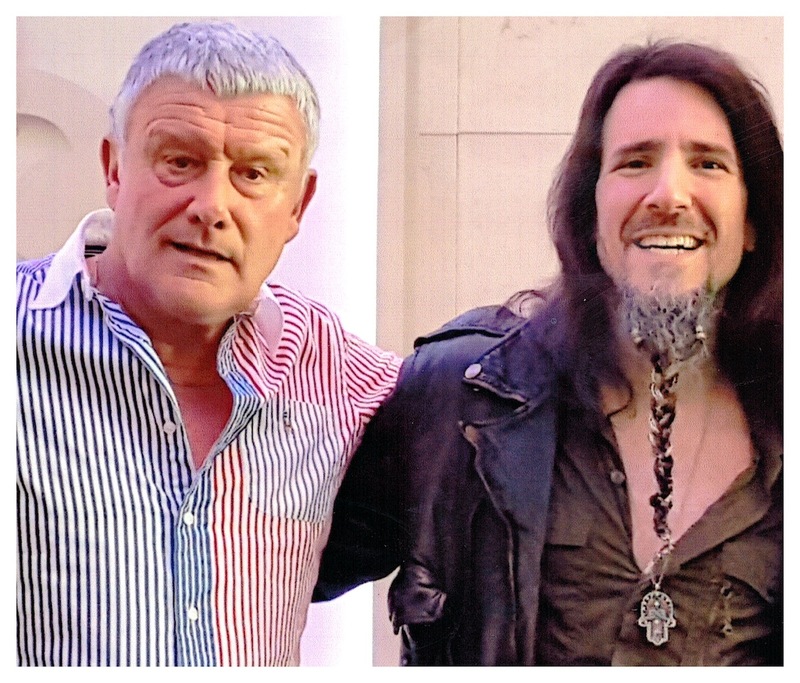 This is to urge all Planet Rock listeners to seize the chance to see Carl Palmer's ELP Legacy next time they tour. I saw them @ Poole Lighthouse last week and they were outstanding — So many highlights: Knife Edge, Jerusalem, 21st Century Schizoid Man, Trilogy, America, Pictures at an Exhibition, Fanfare for the Common Man... to name but a few! I expected a virtuoso performance from Carl Palmer – and he certainly produced one! 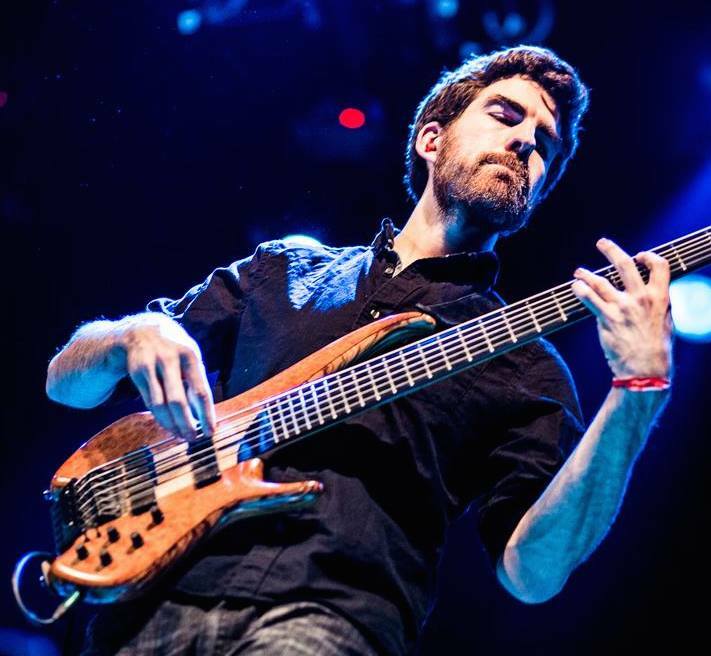 – though I was not expecting to be kept spellbound by a solo bass rendition of Shine on You Crazy Diamond (yes,really!) from the brilliant Simon Fitzpatrick; or to have sounds conjured from Paul Bielatowicz's guitar that made me completely forget that there were no keyboards on stage. If your idea of a great night out is to hear genuine virtuosos clearly enjoying themselves, reinterpreting some of the most imaginative classic rock ever written, you really need to check out this incredible power trio. Get the details in the press release. 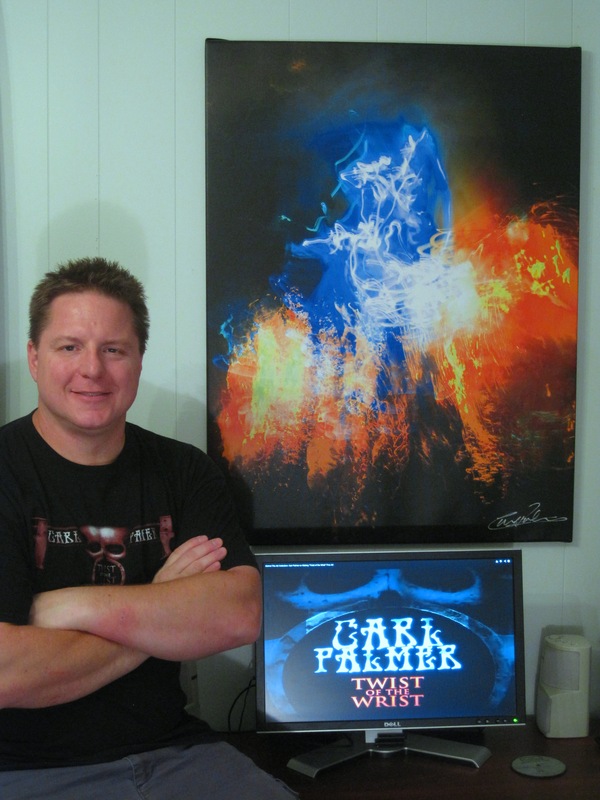 Update: Carl Palmer's debut art collection (www.carlpalmerart.com) is nearly sold out. 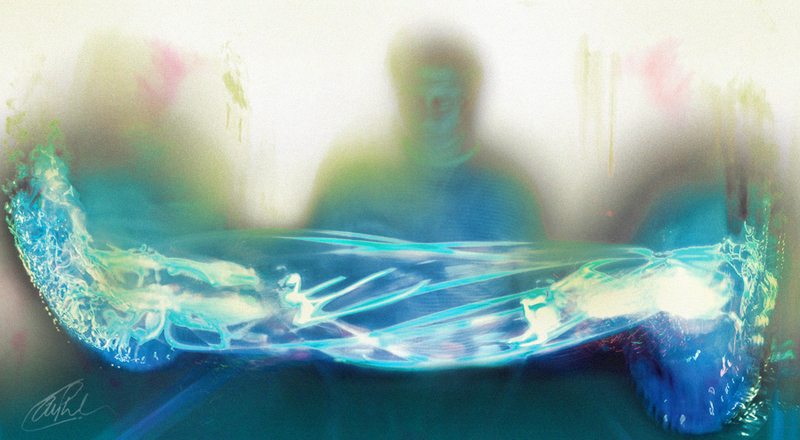 However, an early edition number is now available - #6/25 of Prismatic (as shown in the photo on the right). View the piece and request pricing. 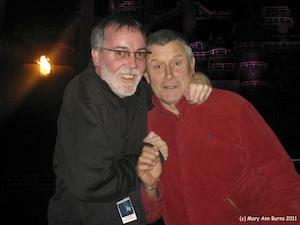 Carl Palmer's ELP Legacy 2014 Tour Photo Galleries! Now that the tour is underway, Photo Galleries are being added to the site. First additions are the shows from Rio (Jan. 18) and Hull (Jan. 24). LAST CHANCE to join CARL PALMER OF ELP plus The Moody Blues for 5 days of music and fun aboard the "Moodies Cruise", sailing to the Caribbean this April 2-7. 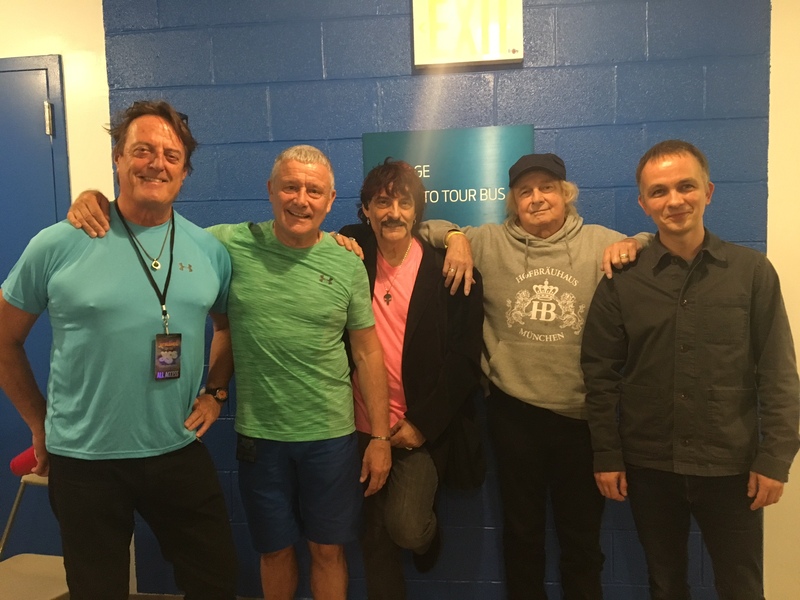 Two New Performances by The Moody Blues! Only two cabin categories are still available... book today! Check it out at www.MoodiesCruise.com or call (855) 622-3111 (US/Canada) or (954) 417-6264 (International). 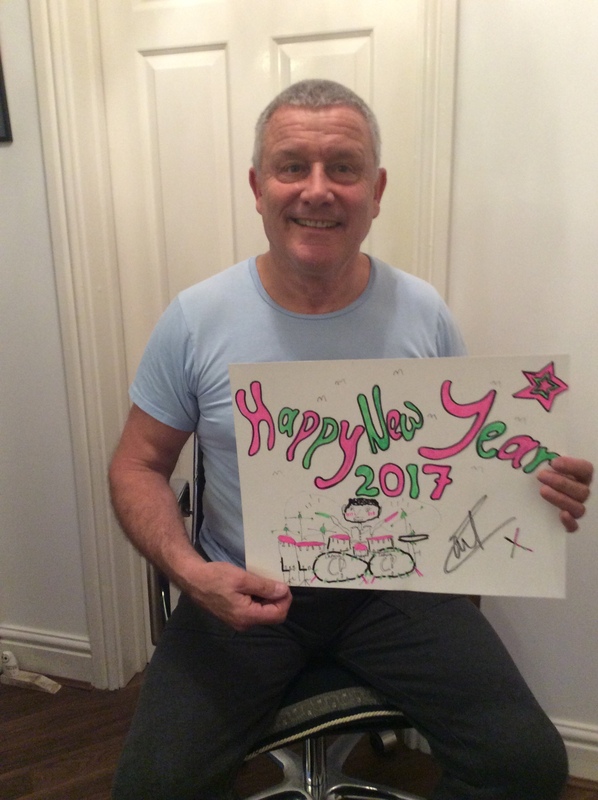 CARL PALMER OF ELP looks forward to seeing you aboard!! Hello Everyone. 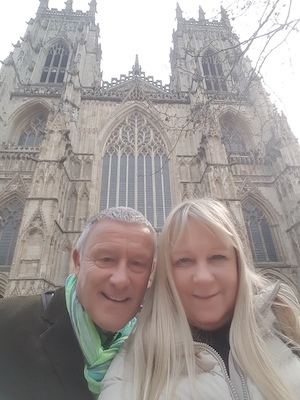 We just started our UK Tour in Hull at The Fruit on Friday, followed by The Rock and Blues Festival at Skegness on Saturday where there was a great crowd of around 1500 people. 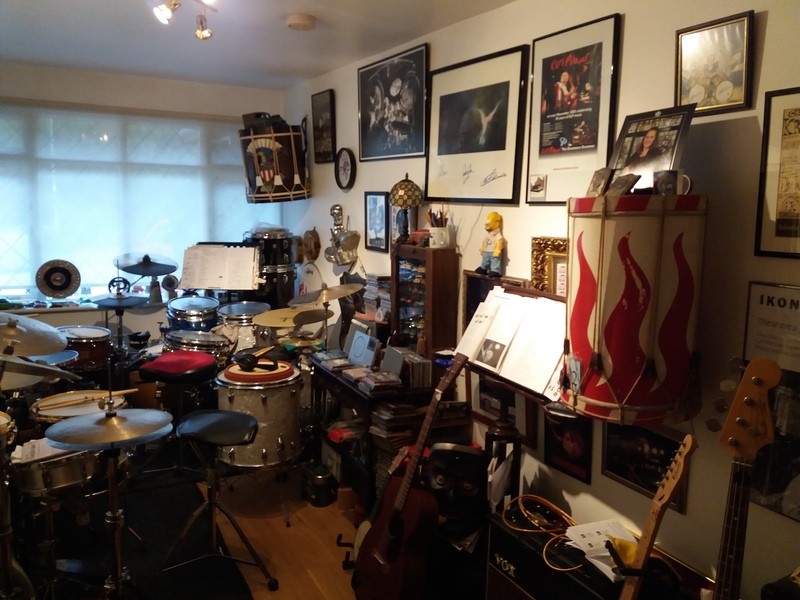 We are now going back into rehearsals to take a look at two pieces for the tour that we haven't played before and if this works out Simon will be playing the Stick on a piece of music that the BBC banned many years ago called Jerusalem. Well known to all ELP fans and one of my favourite pieces. 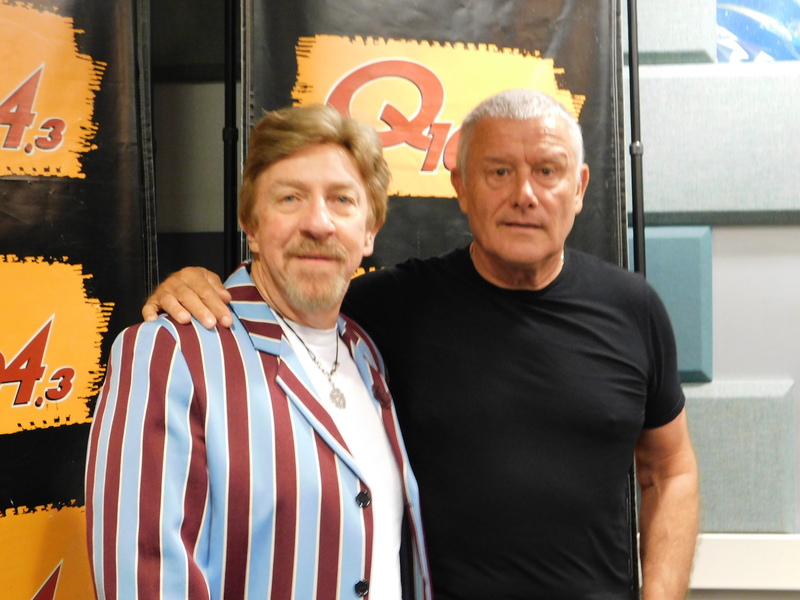 I also wanted to play the piece of music that was probably the first piece of music ELP played together in our initial rehearsals, which believe it or not was Schizoid Man. [...] Read the complete note (including the set list) on the Guest Book. As we embark on a new year, I want to thank all of my fans, associates and friends for their support during 2013. It was a fantastic year, with many great shows by my ELP Legacy band, and the creation of a new ASIA album, Gravitas, due this coming spring. In addition, I embarked in a new phase of my career, with my Twist Of The Wrist Fine Art collection, which, I am happy to say is nearly sold out. 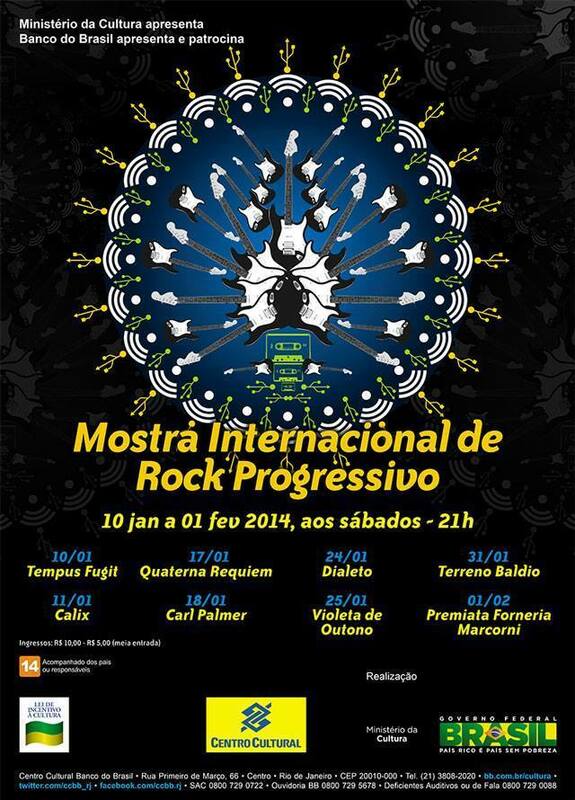 In January my band is looking forward to a headlining show at the Progressive Rock Festival in Rio DeJanerio, Brazil, and in February we embark on our extensive UK tour. 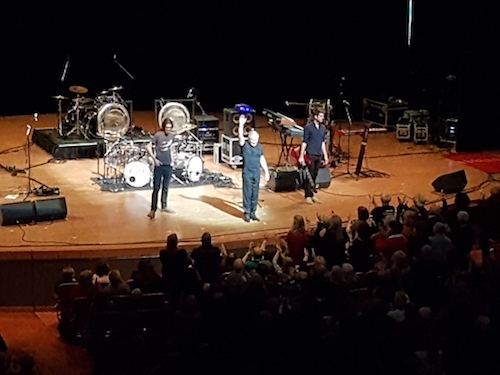 In March and April we will be among the featured artists on both the MONSTERS OF ROCK and MOODY BLUES / ROGER DALTREY BACK TO THE ISLE OF WIGHT cruises, and we are presently putting together tours of North and South America and Europe for the second half of 2014. In addition, ASIA will return to Japan and the UK in June, and North America later in 2014. 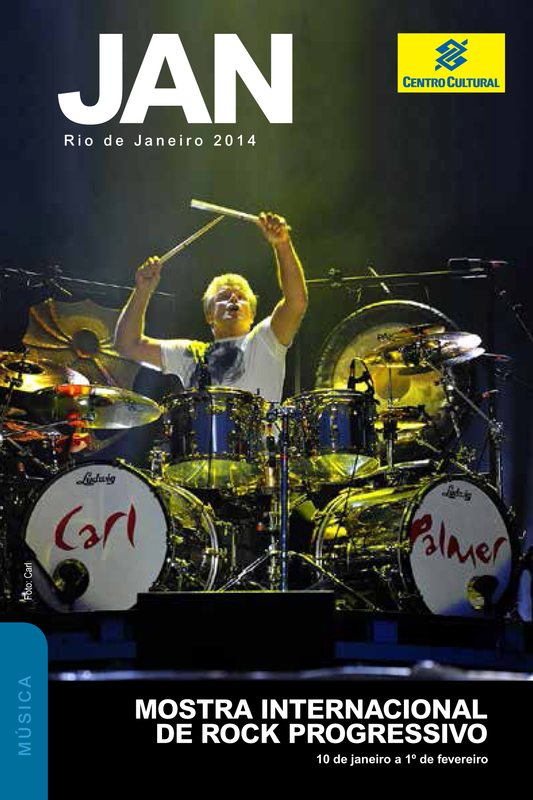 I am very happy to announce three official Carl Palmer products will be released worldwide in March, 2014. Music Video Distributors (MVD) will be issuing our new concert DVD – Decade – The 2011 10th Anniversary Tour featuring my current band with guitarist Paul Bielatowicz and bassist Simon Fitzpatrick. Also being released at the same time on DVD will be the art film I made with Andrew Cross in the UK, The Solo. And last, but not least, MVD will be re-issuing and updated and expanded version of –l DO YA WANNA PLAY, CARL? 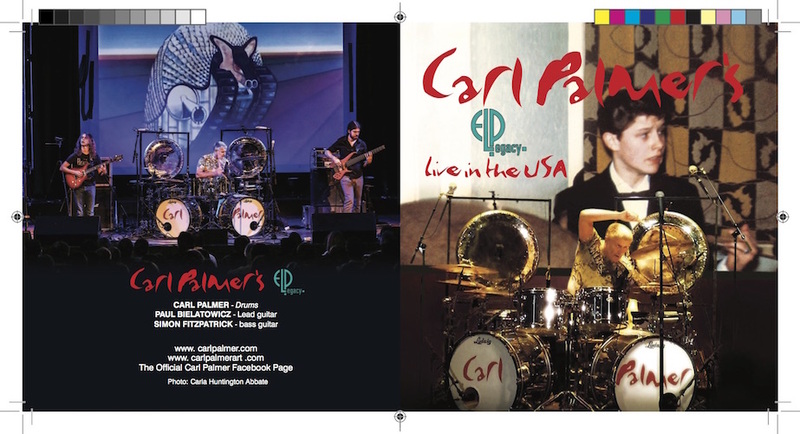 – THE CARL PALMER ANTHOLOGY two CD set. Our partners in Los Angeles, Scene 4 Art, will be releasing my second collection of Fine Art, which is still to be named. Look for that to premiere in the Spring of 2014. So, there is plenty to look forward to this year, and I hope to see all of you on the road at some point. Thanks again for a great 2013, and my best wishes to you for a happy new year. 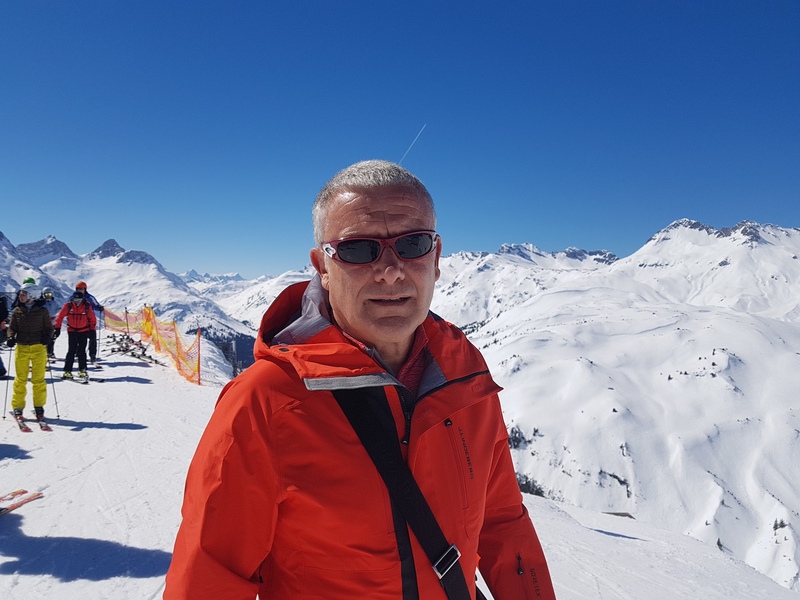 I have been reappointed as a Visiting Fellow in the Faculty of the Creative Industries at Southampton Solent University in the UK. 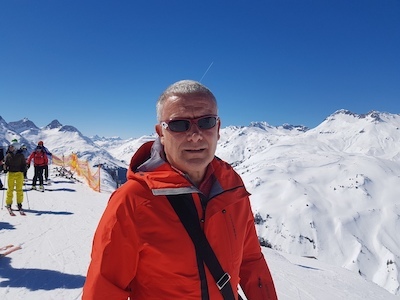 I have been a Visiting Fellow at the University for five years and am looking forward to continuing my involvement with the staff and students at the University. Learn more about the University at www.solent.ac.uk. We have postponed the show in order to include the date in a more extensive US Tour, later next year. Refunds are available at point of purchase and we will let you know the rescheduled BB KING'S date as soon as it is confirmed. Thank you, happy holidays and see you next year! 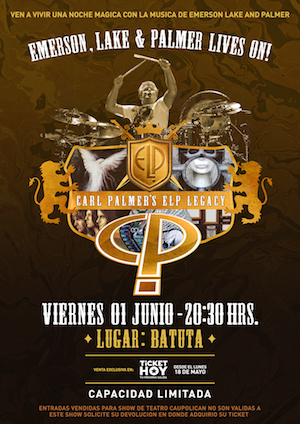 Carl Palmer's ELP Legacy - 2014 Tour Dates! The first tour dates for 2014 are announced! "It was another great weekend at the National Drum Fair, in my home town Birmingham, and it was nice to see some new faces. This is the 11th year and the fair continues to attract more stalls and visitors alike. As always, there were some interesting drum sets of a very high standard on display. And, if you wanted that special part you have been looking for years, you will more than likely find it among the stalls this weekend. That's for sure. 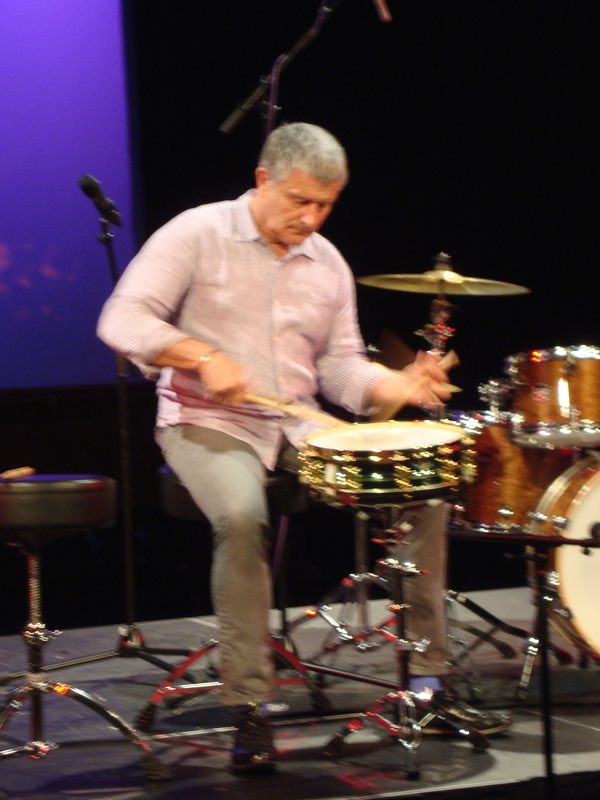 I visited the show on Sunday and was fortunate to see Clark Tracey playing with his trio, which was really fantastic and also Pete Cater gave a great master class on technique. I had a good wander round the stalls and met people I only get to see at the fair. A good time was had by all and the 'A' team did a great job as always. Yes, I am talking about Garry, Simon and Matt." 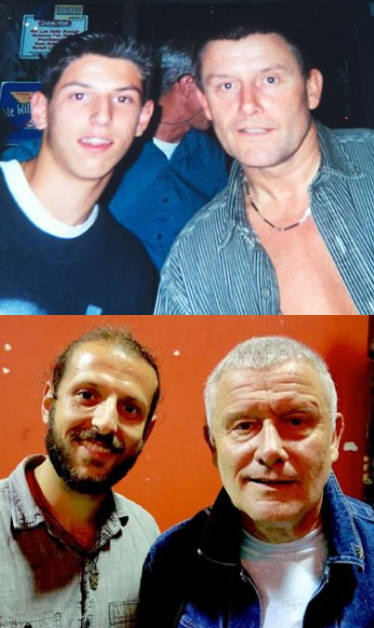 Carl Palmer's ELP Legacy - October tour of Bulgaria and Italy! Tour dates posted! 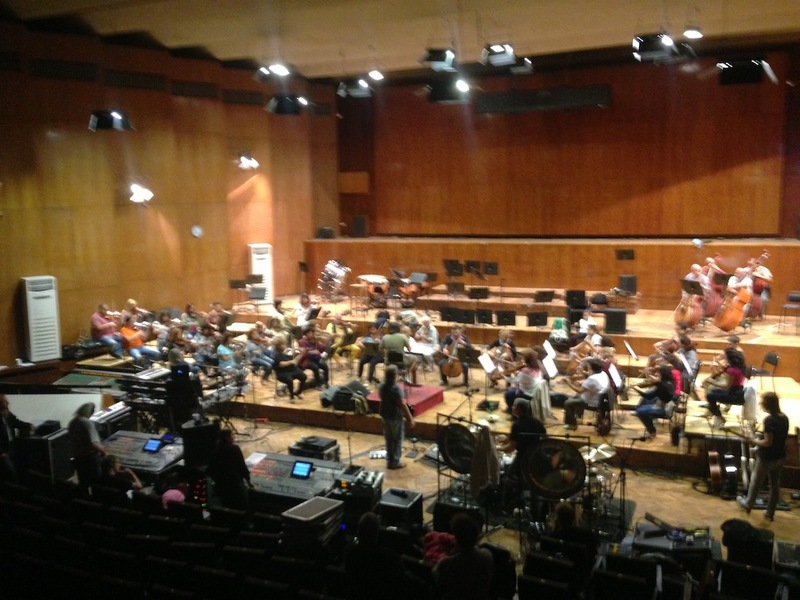 Currently rehearsing with the Plovdiv State Opera Orchestra in Bulgaria, for the Roman Amphitheatre concert tonight. Show is nearly sold out! Available now for the first time, a new line of high end audio headphones manufactured exclusively by OrigAudio for Carl Palmer fans. 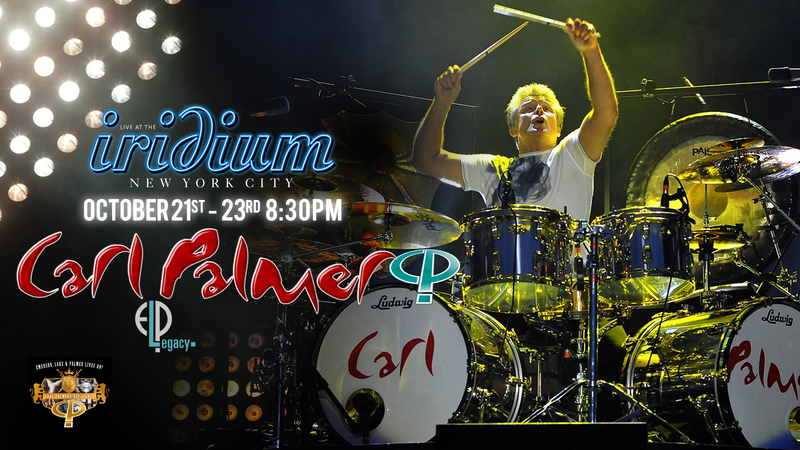 Each set comes in a sturdy carrying case with a personalized authentic Carl Palmer autograph. 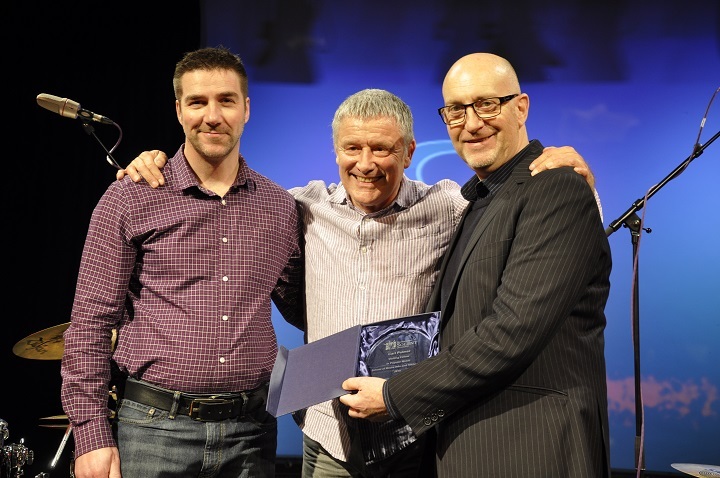 Carl Palmer received the 'Drum Legend Icon' award at the Las Vegas Rock Awards on August 25. The ceremony was held at The Joint - Hard Rock Hotel, Las Vegas. 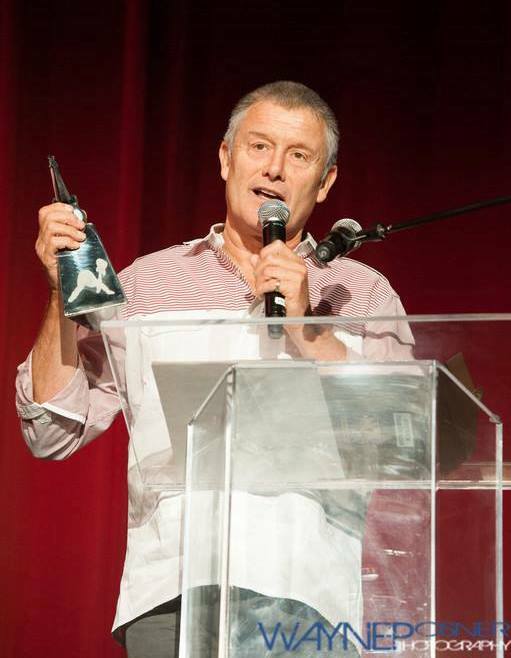 Carl Palmer Rocks Las Vegas As He Is Honored At The Las Vegas Rock Music Awards, Aug 25th 2013. 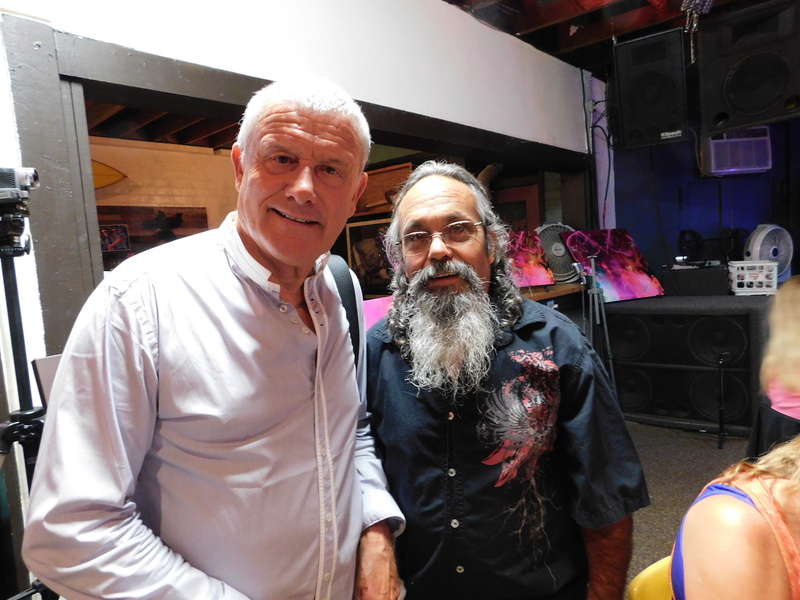 LA'S PROG MUSIC FANS, ART LOVERS & CELEBS TURN OUT FOR CARL PALMER'S TWIST OF THE WRIST ART EXHIBIT AT MR. MUSIC HEAD GALLERY. 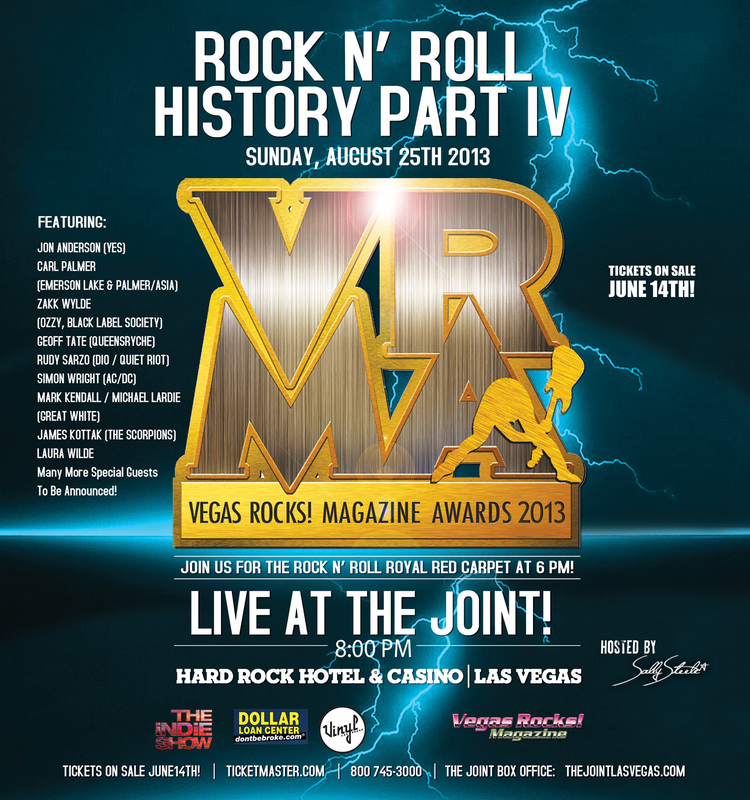 From VegasNews.com: "[...] Rock n' Roll history Part 4 will take place again with this year's theme of "A Celebration of Classic Rock" and will feature some of the most legendary artists in the music business. 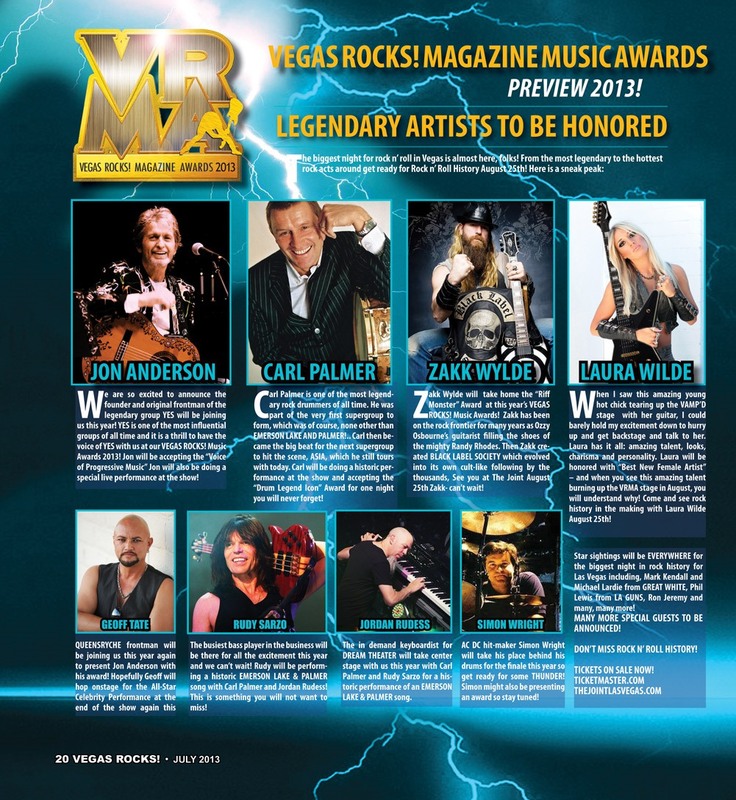 Jon Anderson (Yes) will be honored with the "Voice Of Progressive " award, Carl Palmer (Emerson Lake & Palmer / Asia) will receive the "Drum Legend Icon" award, Zakk Wylde will receive the "Riff Monster" award and newcomer Laura Wilde will receive "Best New Female Artist" award. [...]" - read the entire article. 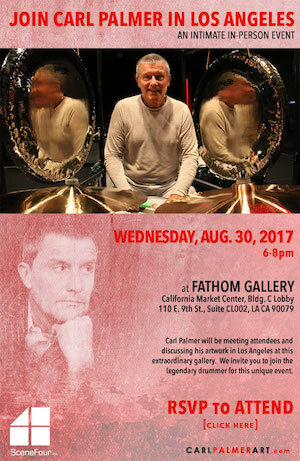 Spend an evening with Carl Palmer in Los Angeles! 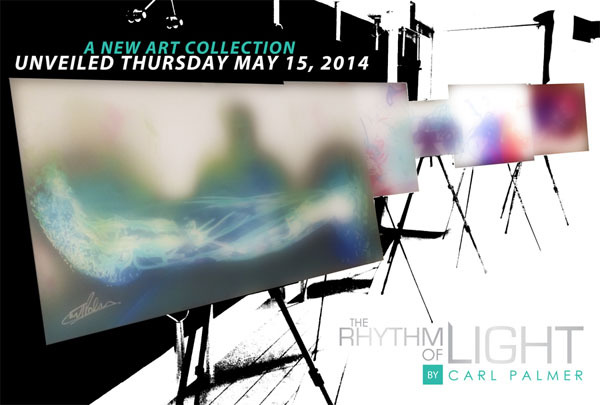 Attend the Reception Night/QA Event for Carl's fine art debut. A free event, we ask that you RSVP at www.carlpalmerart.com. Hope to see you there! Your invitation! 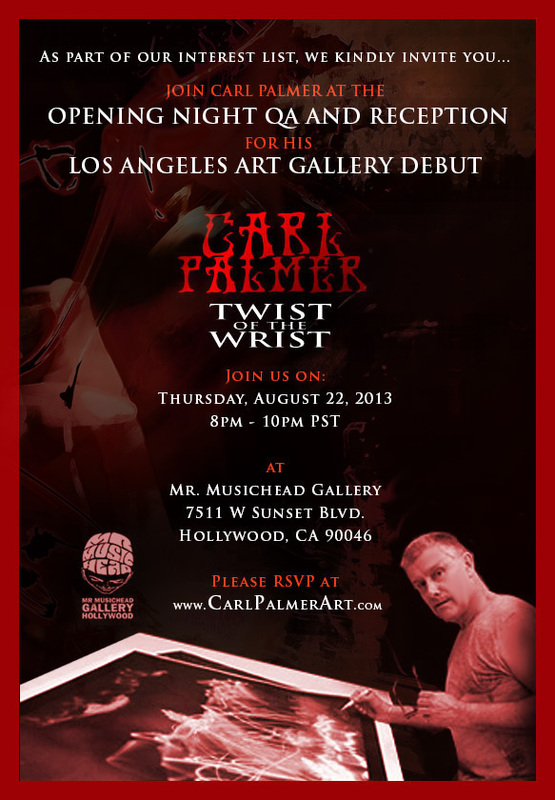 Join Carl Palmer on August 22, 2013 at a QA/Reception for the L.A. Art Gallery debut of Twist of the Wrist at Mr. Musichead Gallery. RSVP at www.carlpalmerart.com, and we hope to see you there! We've got a new page featuring collectors of the Carl Palmer Art collection. First up, Mark with Blue Mountain Fire #6. See all the collectors on the Collectors page. 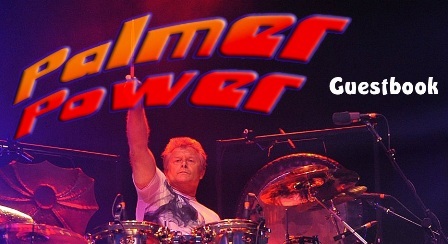 CARL PALMER TO ROCK LAS VEGAS - AUG 25th - WHEN HE IS HONORED! Carl will be performing with legendary YES frontman, Jon Anderson, and will return to his ELP roots with a new 'one night only' super trio featuring Rudy Sarzo (bassist for Ozzy Osbourne/Quiet Riot/Queensryche) and Jordan Rudess, (keyboardist for Dream Theater). Read more about this historical event here! Asia: European tour - August/September 2013. Check out the tour dates. We expect more dates will be added as shows are confirmed. Asia fans! Stay up-to-date by following @originalasia on Twitter. In addition, Yestival will feature a special exhibition and sale of Carl Palmer's acclaimed Twist of the Wrist art work – including a meet and greet with Palmer and audience members after his presentation. 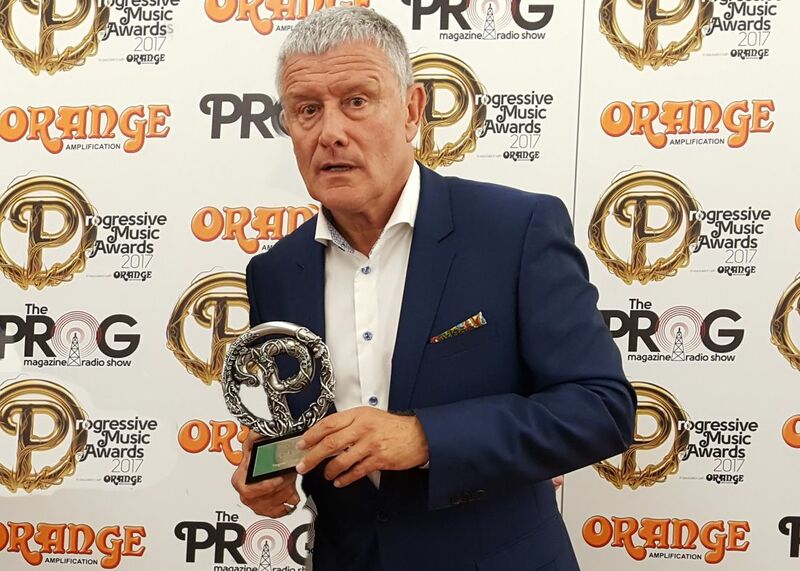 Carl Palmer to receive Drum Legend Icon Award at 'Vegas Rocks!' Awards. 24 April 2013 - See the Twist of the Wrist artwork in person and meet me at my first fine art exhibition in the United States! 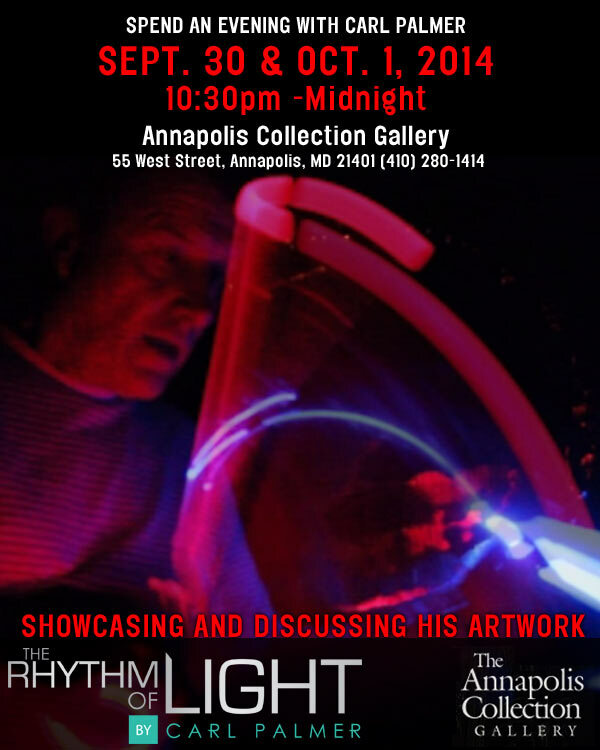 I'll be showing my Twist of the Wrist artwork on gallery row at the Annapolis Collection Gallery (Annapolis, MD) from May 6 through June 4, 2013 AND I'll be at the gallery for 2 Q&A Nights (May 6/May 7). It's a free event, so please RSVP and get the details at www.carlpalmerart.com. 2013 Cruise To The Edge Photo Galleries. Back in North America after a string of great sold out shows in South America. Another Carl Palmer's ELP Legacy 2013 Photo Gallery. 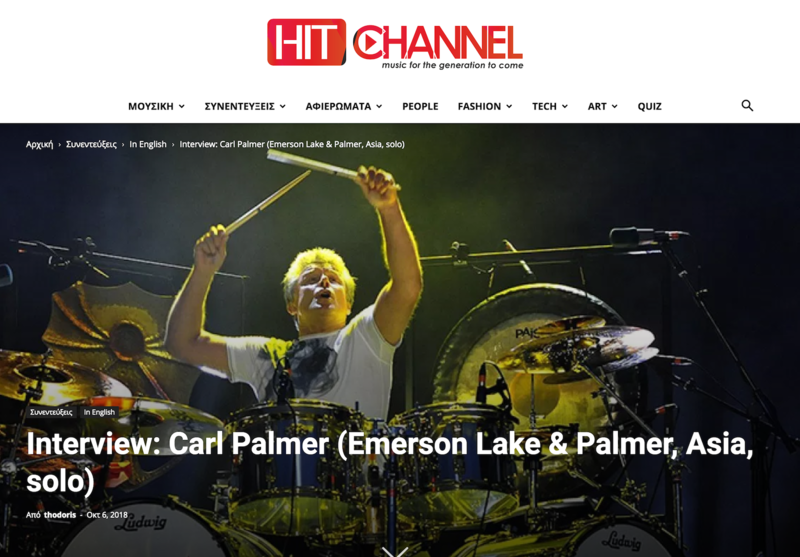 Carl Palmer interview on Examiner.com. 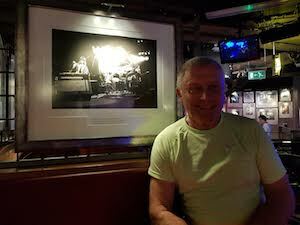 19 Mar 2013 Update Twist Of The Wrist - Carl Palmer Art! 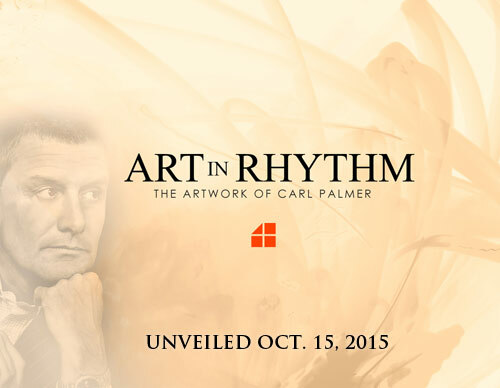 A new short documentary on Carl Palmer's art debut of rhythm on canvas "Twist of the Wrist." 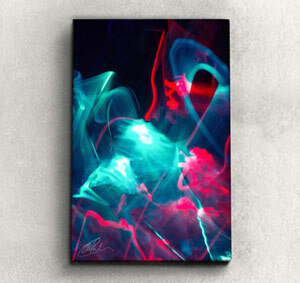 And if you haven't seen the collection, head over to www.carlpalmerart.com to have a look and reserve one for yourself! 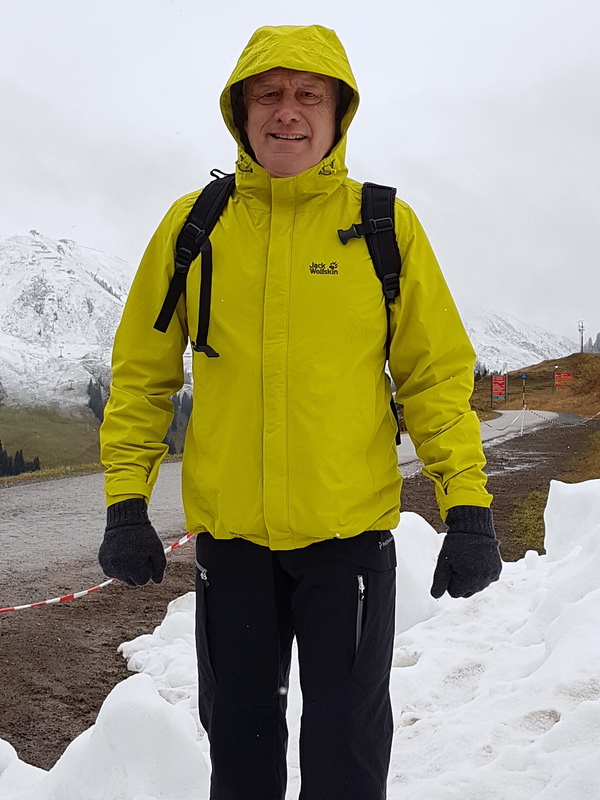 "Well we are coming towards the end of the European leg of our World Tour where we have encountered some very cold and snowy weather along the way. 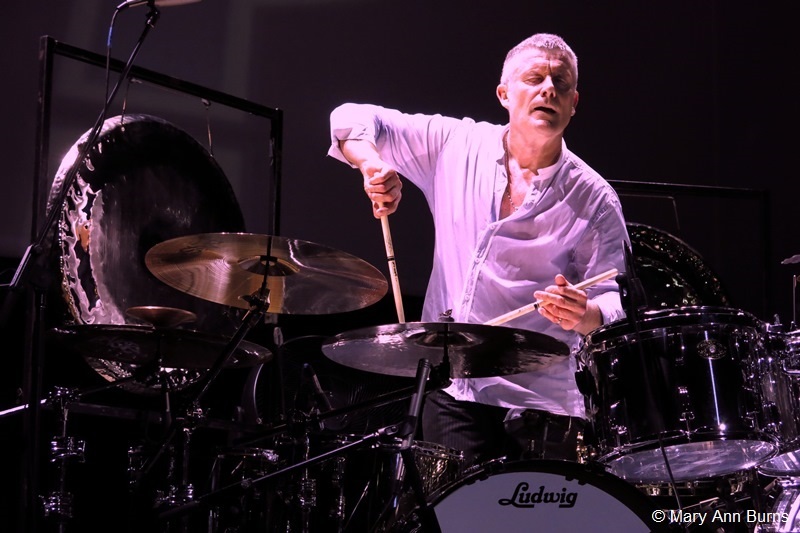 We have travelled through several countries in a relatively short time [...]"
01 Mar 2013 The Carl Palmer Legacy will be playing a UK Tour in the second and third week of February 2014. Dates and venues to be announced as plans are finalized. Twist of the Wrist 2013 tour of Europe started tonight! Complete tour schedule available at the Tour Dates page. "Just back from Japan following a really great time. Our Japanese fans were very enthusiastic about the music and we are looking forward to returning in the future. 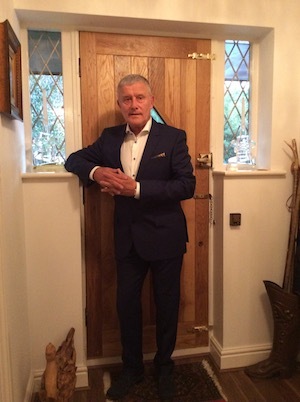 It was the first time that the band had played in Japan even though I have been playing there regularly since 1972, firstly with ELP and later on with Asia. I thought you would like to see the new set list we will be playing on the Carl Palmer Legacy World Tour starting on March 1st in Europe and continuing on to the USA, South America and Canada: [...]"
"We would like to give our Condolences to all of the Downes Family"
14 Feb 2013 Additional Tour Dates Added! 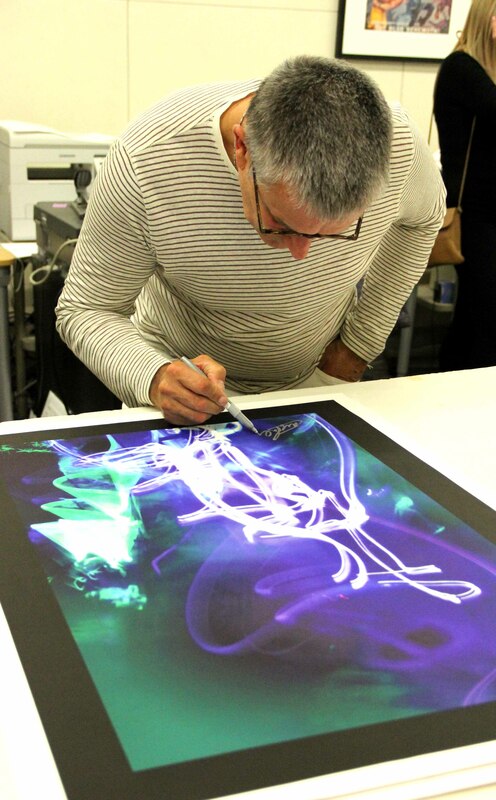 25 Jan 2013 1 WEEK AWAY... Carl Palmer's Twist of the Wrist art collection debuts next Friday, February 1st! 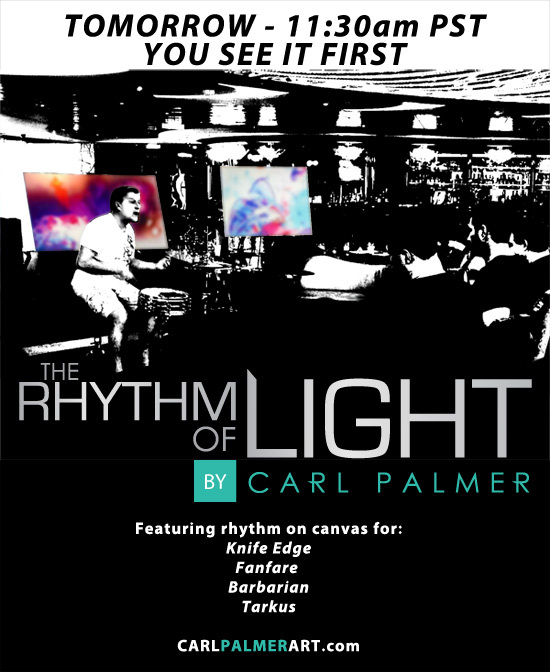 If you want to see the collection of rhythm on canvas early, THERE'S STILL TIME - join the interest list at www.carlpalmerart.com to get your invitation. 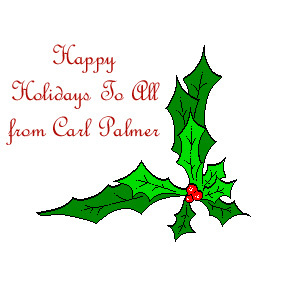 22 Jan 2013 Update Twist Of The Wrist - Carl Palmer Art! In this latest video, Carl Palmer talks about his experience creating rhythm on canvas and how it relates to his interest in photography. To get exclusive information before the February 1, 2013 release, sign up at www.carlpalmerart.com. 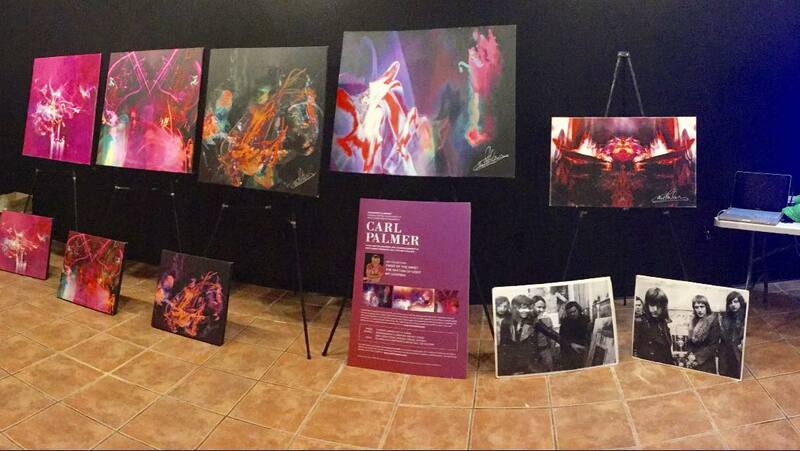 New Tour, New Concert DVD, and New Signature Art Collection – "A Twist of the Wrist"
Twist Of The Wrist - Carl Palmer Art! 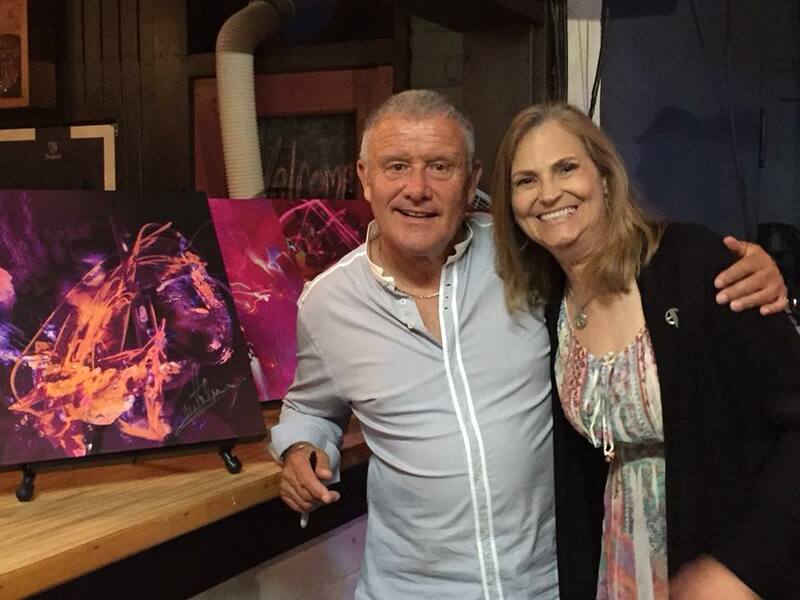 Abstract, vibrant, and historic - Emerson, Lake and Palmer drum icon Carl Palmer to release a career first, an art collection of rhythm on canvas. With only 200 pieces in the series, this highly limited release becomes available worldwide on February 1, 2013. Those interested should get on the early interest list at www.carlpalmerart.com to learn more and get the opportunity to see and own the collection before the release date. ASIA update: new guitarist, Sweden Rock appearance, new album. Carl has posted an announcement on the Guest Book sketching out his plans for 2013. For starters, the band is now called Carl Palmer Legacy. 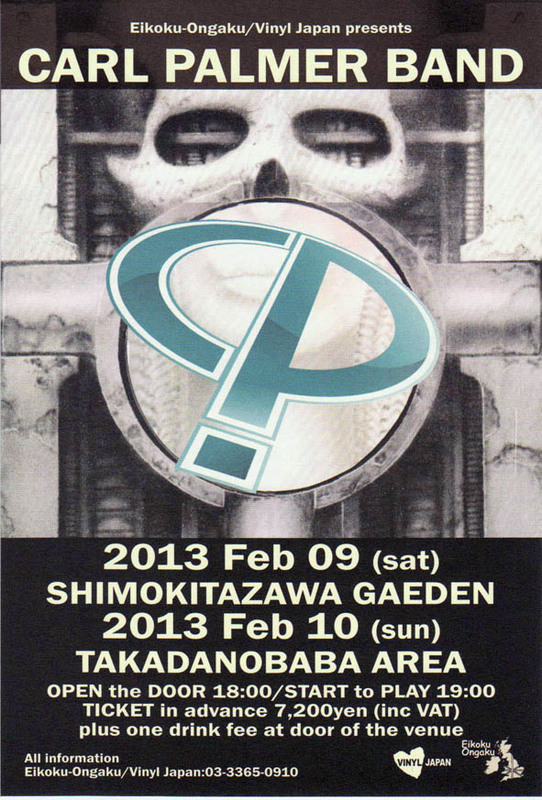 The Decade DVD will be out in 2013 and plans are shaping up for an extensive tour beginning in February. Read Carl's note in its entirety on the Guest Book. 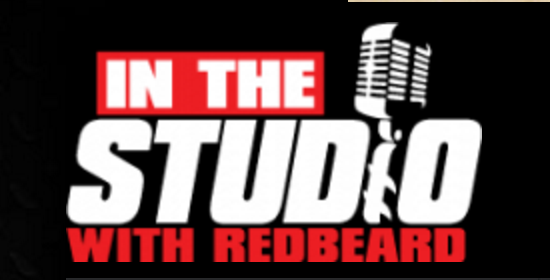 The show will be streamed on the Rockline website for two weeks beginning the afternoon after the live broadcast. 30 Jan 2012 Coming later this year! 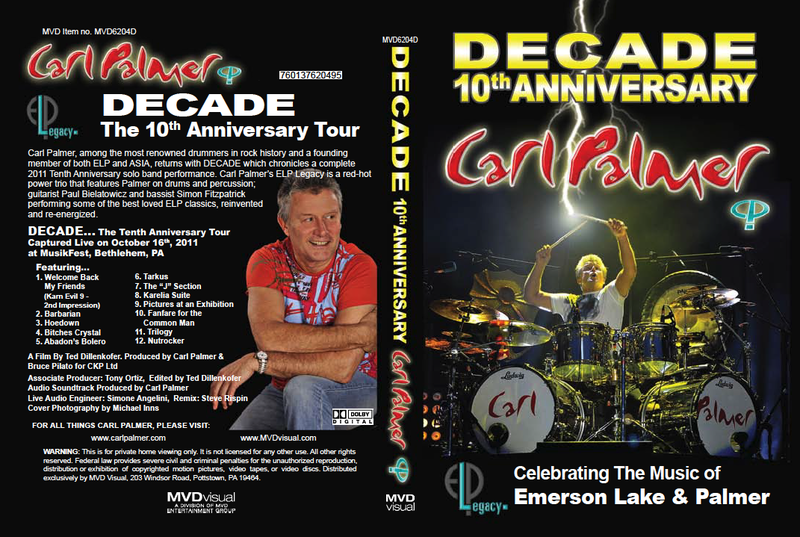 Carl Palmer Band 10th Anniversary DVD. Interviews with all the members. Live footage recorded in the US. Approx. 1 hour 50 min. 12 Nov 2011 New! NOW AVAILABLE! 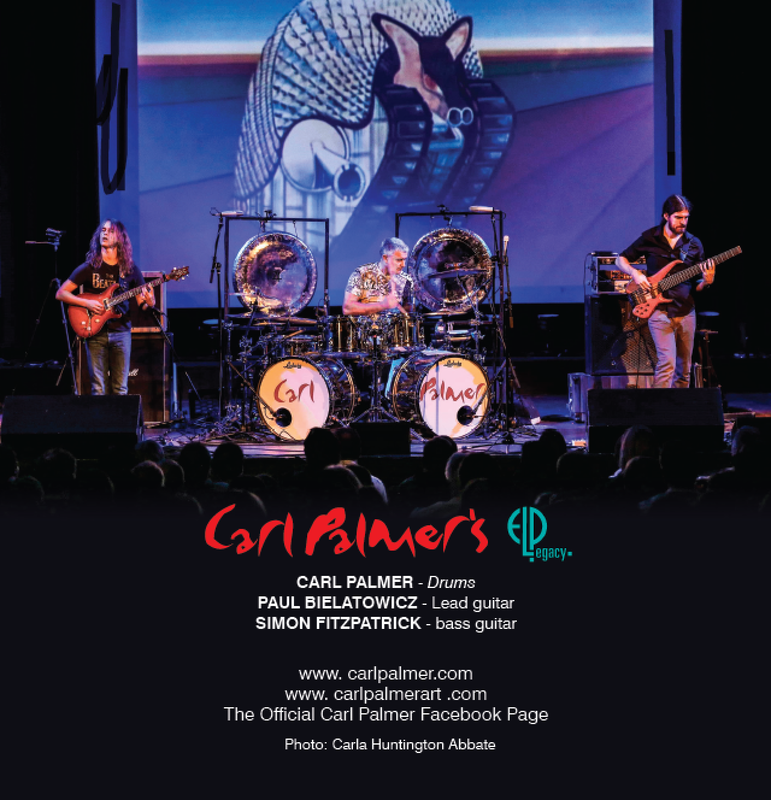 Limited Supply of Merch from the Carl Palmer Band 2011 tour. New T Shirts! New THE SOLO Palmer Art Film, and much more! 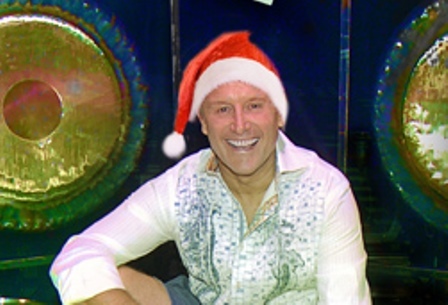 Now at the Carl Palmer Gift Shop! 11 Nov 2011 Carl will not be at the FORUM KENTISH TOWN on the 14th of November as advertised in CLASSIC ROCK MAGAZINE for the screening of the ELP film. 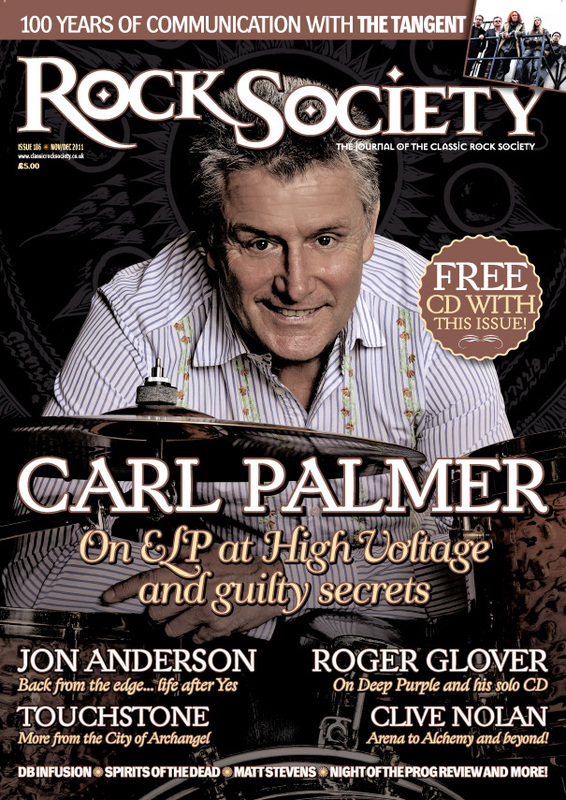 01 Nov 2011 Carl Palmer appears on the cover of Rock Society magazine Issue 186. 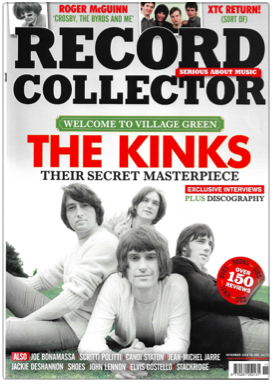 Rock Society is the magazine of the UK-based Classic Rock Society.